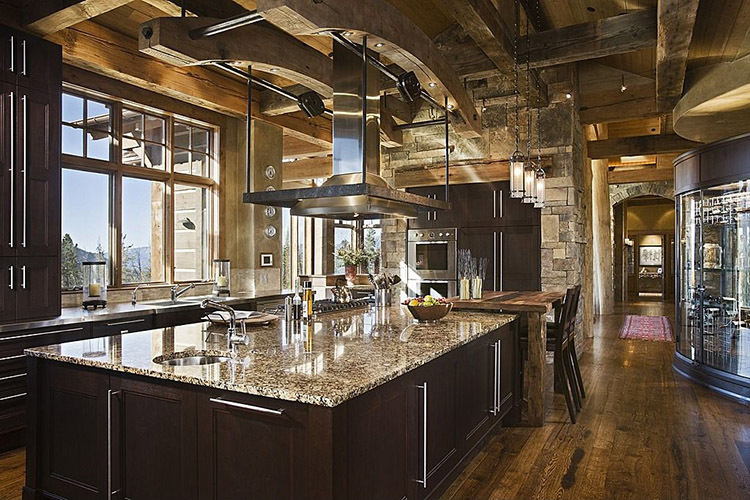 We geek out for Luxury Kitchens and we have found 174 jaw-dropping luxury kitchen designs to inspire you for your home. Each of these luxury kitchen designs that made this exclusive list have been reviewed by our team of Lifetime Luxury writers. 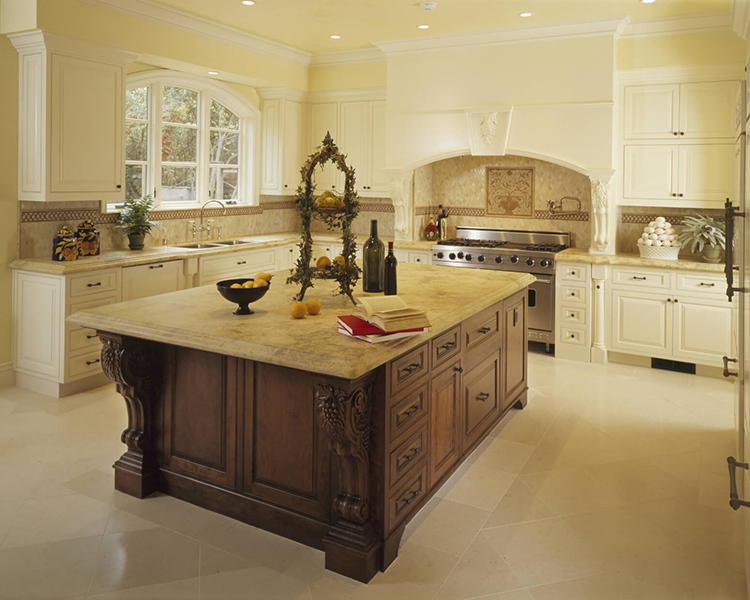 The design styles of these kitchens vary widely from classic country to Mediterranean to modern. What these kitchens designs all have in common are their clean lines and artistic layouts that qualified them to make our list. 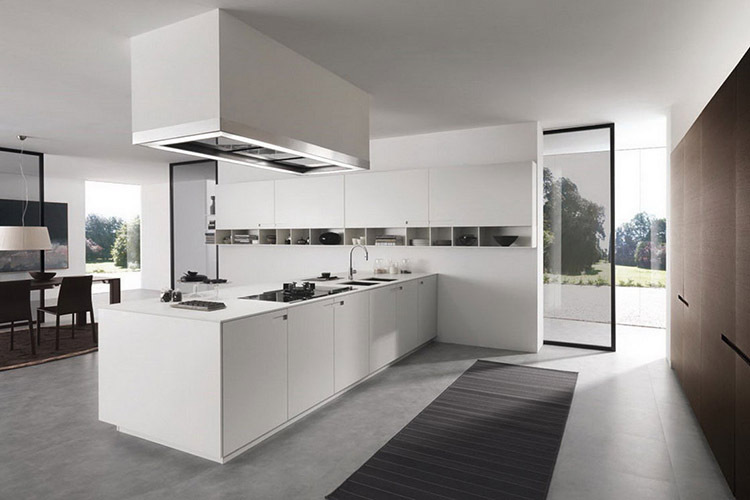 1.1 This is a collection of white themed luxury kitchen designs. 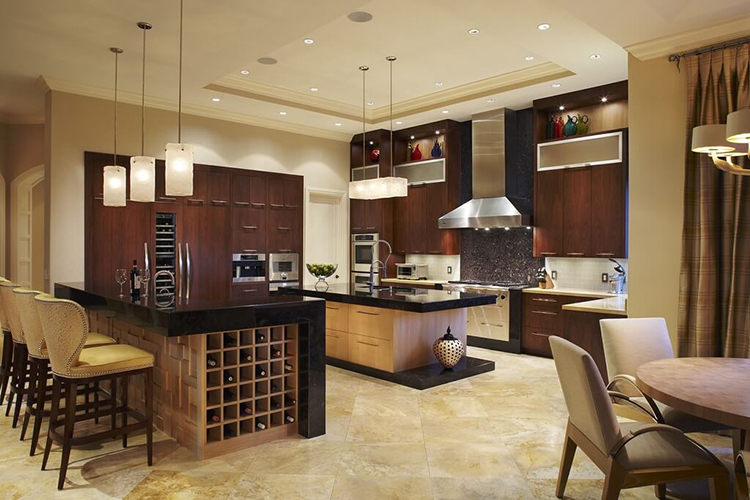 There are a total of 174 spectacular luxury kitchens that were chosen by our design team. 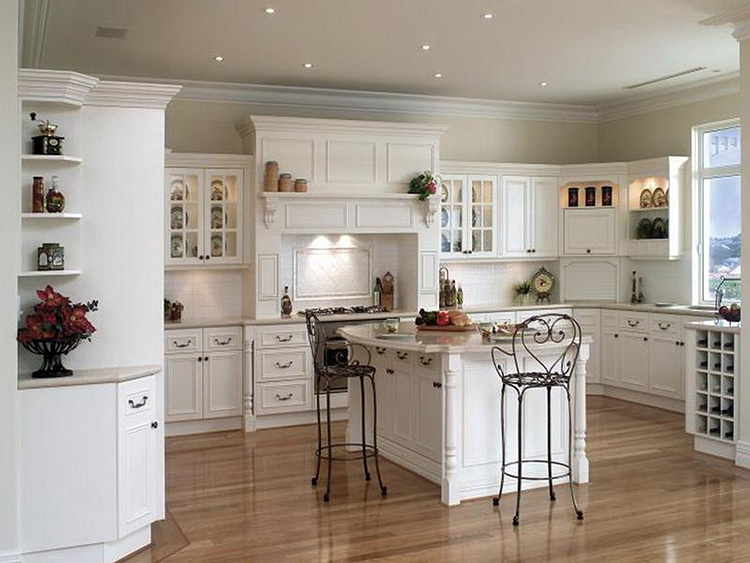 This is a collection of white themed luxury kitchen designs. 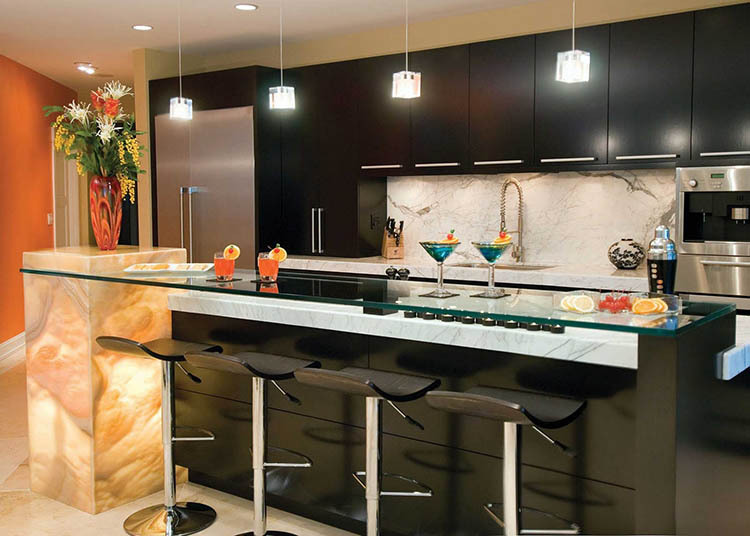 There are a total of 174 spectacular luxury kitchens that were chosen by our design team. The masterful use of the contrast between white and brown creates a cosy and warm atmosphere in this beautiful yet practical kitchen. The large island is perfect to gather and entertain your friends with snacks, while the spacious counter provides plenty of room for food preparation. 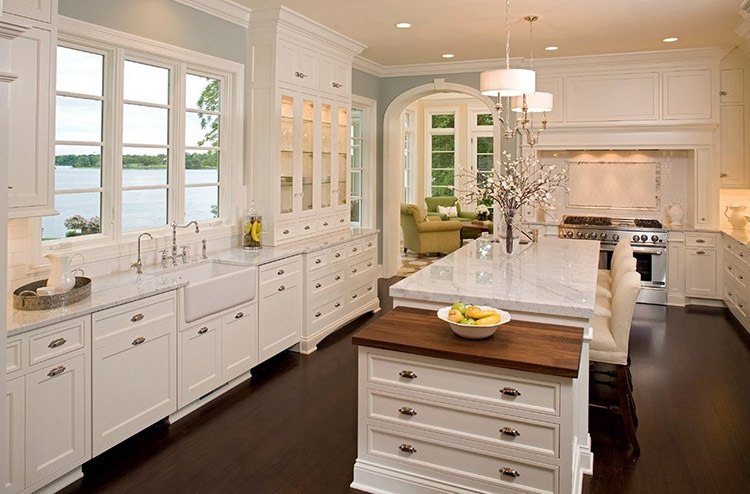 This classical white kitchen is a perfect solution for social eaters. Like in a sushi bar, the space is clearly divided into a working area and a guest area. Cook for your guests on standing in the space between the wide, practical island, and the spacious counter where you find all you need. Here, space is masterfully arranged in order to provide the chef with the top level of comfort without sacrificing beauty. The spacious fridge, the compact island equipped with sinker and oven, and two large counters give all the necessary resources to cook fast and efficiently in a smart environment. Food preparation enthusiasts will certainly appreciate this solution that replicates the high functionality of the kitchens of restaurants. Desktops in stone and the spacious cooking area equipped with two ovens provide the chef with a very comfortable working area. 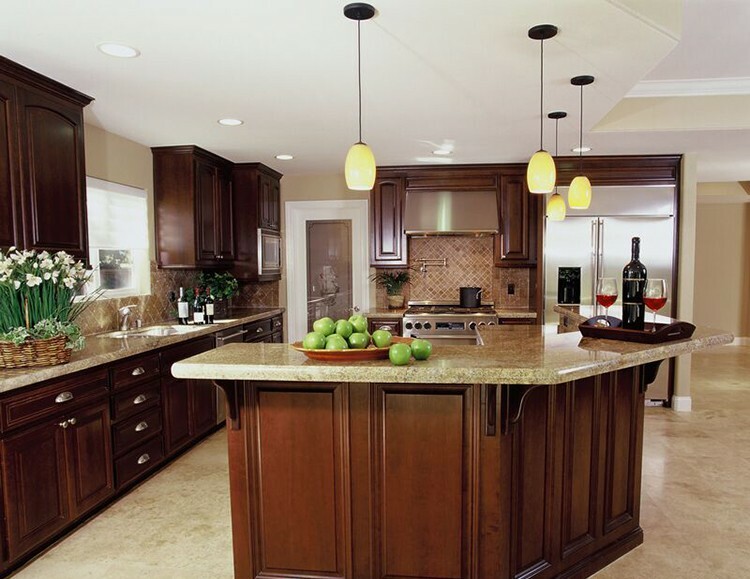 Food is placed on the counter-shaped island and then easily dispatched to the living room. Elegant and functional, this concept creates a cosy atmosphere that is perfect for your meetings with the people that you really love. 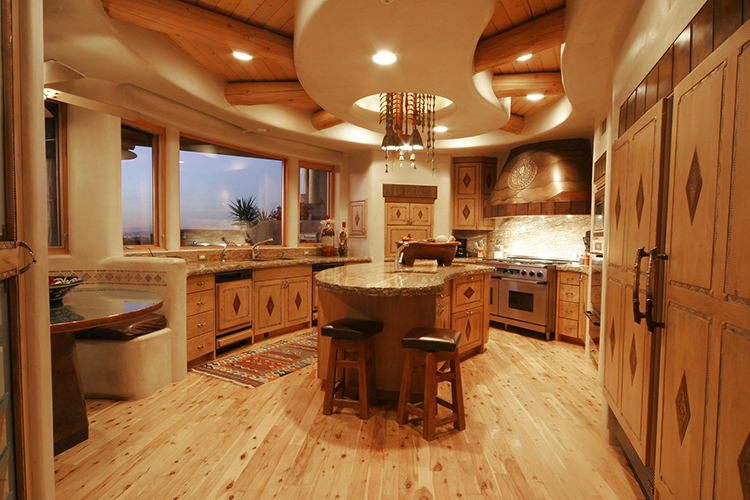 The counter-shaped island in the middle is designed for having meals, snacks or just some wine with your guests. Behind, the working area made of a spacious counter, a perfectly equipped cooking area and some roomy cupboards. 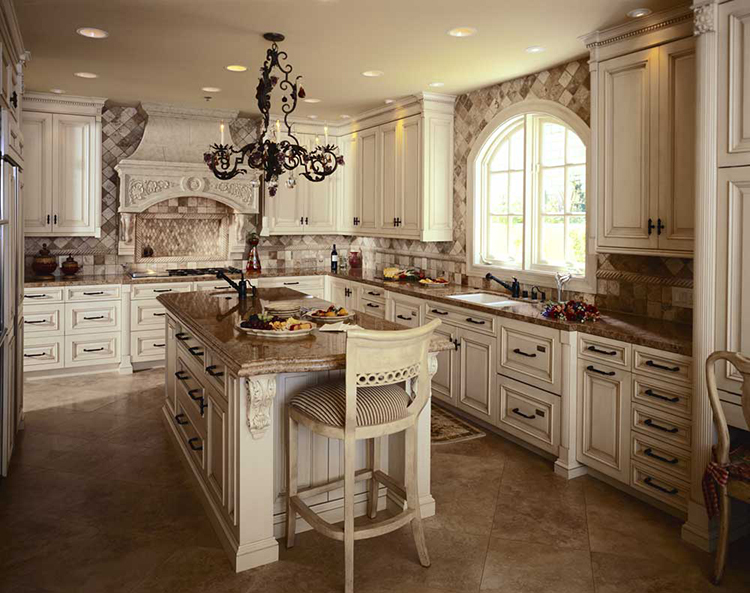 This really luxurious kitchen combines practicality and beauty with the classical design of the kitchens of castles and mansions. Countertops made in polished white marble, golden decorations on cupboards and drawers, finely designed valued faucets and a practical cooking area with false fireplace mantel ensures superior experience of eating and cooking. 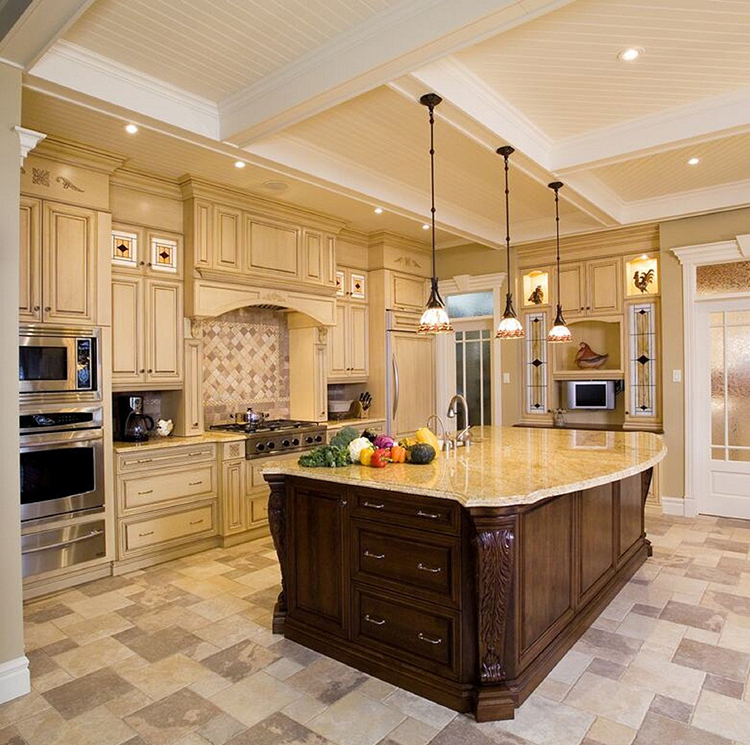 This beautiful, luxurious design with Greek themed decorations turns your kitchen into a real party room. Its special features are the long wall counter that can host a large amounts of people, the huge fridge and the comfortably spacious cooking area with two ovens and a triumphal fireplace mantel finely decorated. Here, functionality is king. This design is the right solution for food preparation enthusiasts. Two ovens, a big and convenient fridge, some spacious wardrobes, a wide island where to work obstacle-free and finely refined countertops will make your experience of cooking a real, great pleasure. Luxurious but not pretentious, this kitchen is the right solution for those who like to have meals together with family thanks to its broad island with top in polished white marble that can be easily turned into a table. Other distinguishing features are its practical white ceramic sink and the spacious cooking area with classically styled fireplace mantel. Modern and practical, this concept is great for flats. The space is arranged in a way that it is possible both to cook and eat with family, or simply spend some time together with friends. Very convenient the counter-shaped island in the middle that can be easily turned from a working board into an eating surface. 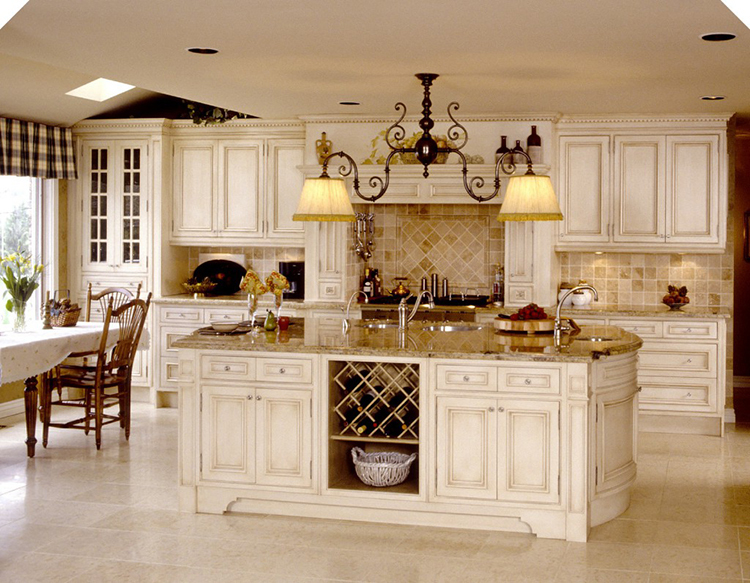 A real, classically cream coloured luxury kitchen. Good for a mansion or a house. The gently round shaped island with precious wooden decorations and top of polished marble can be utilized as a counter or a table according to the needs of the moment. Space is well optimized in this compact but posh kitchen nicely decorated with wooden motifs and elegant countertops of polished grey marble. The island can be utilized indifferently as working area or table. A good solution for flats, resorts, apartments and, in general, dwellings with little room. 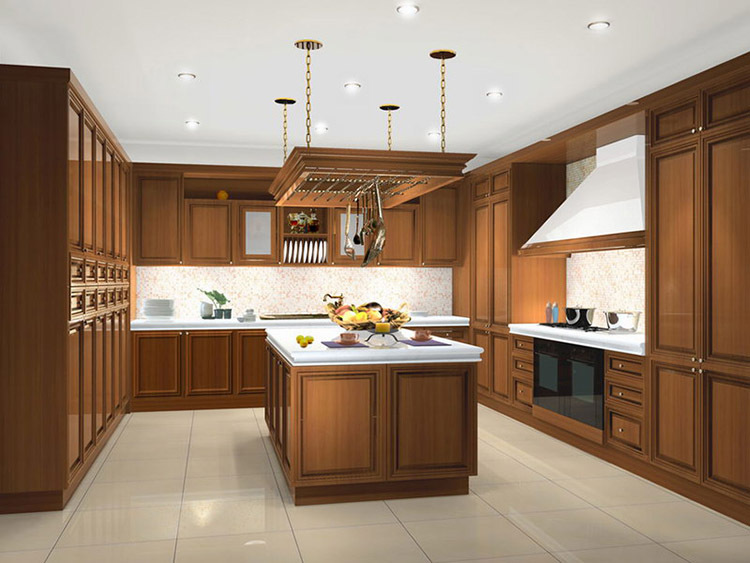 The real luxury kitchen for villas and cottages that combines elegance and functionality. Main features: long counter with top of white polished marble, nice cooking area surmounted by a traditionally shaped mantel, compact island with top of black marble and cabinet included. The long and articulated counter can be utilized as working area or eating surface. 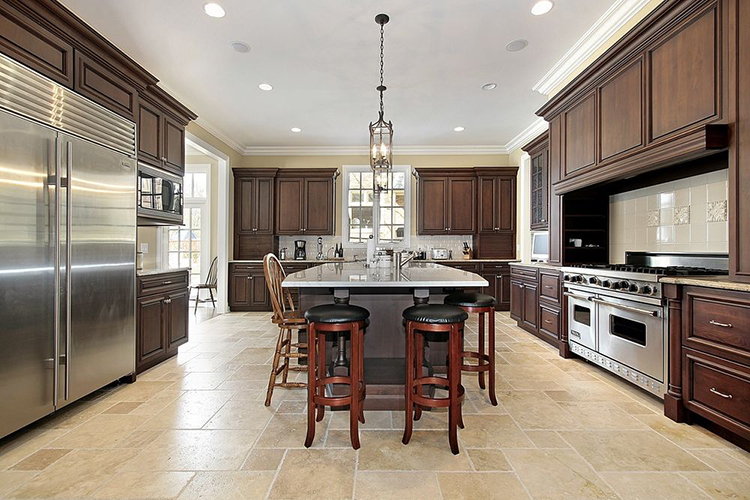 The cooking area is comfortably spacious, while the countertops of polished marble add further value. 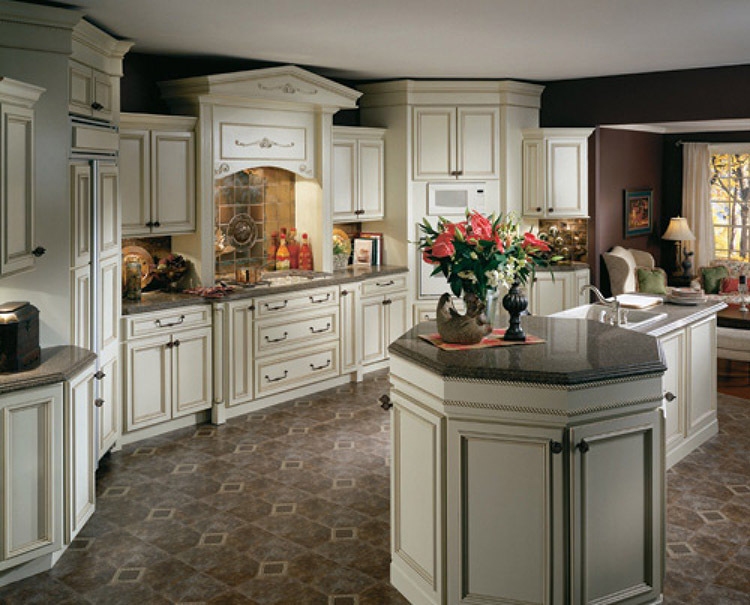 The long and narrow island allows your guests to move with ease through the kitchen. 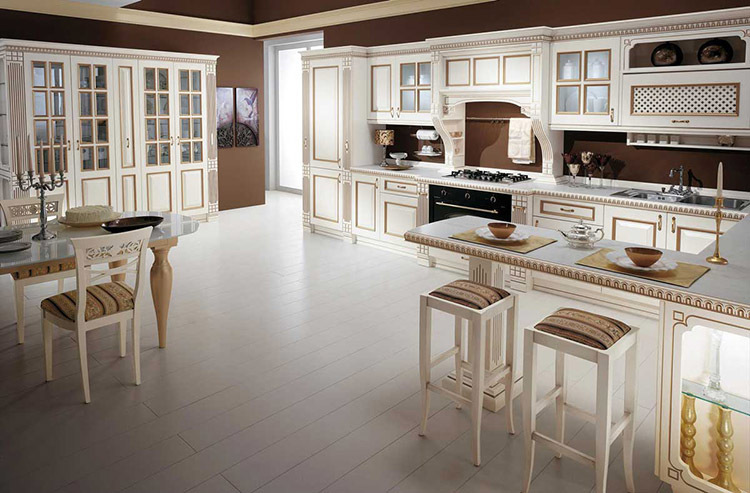 Roomy and elegant, this kitchen is a good solution for a villa or a mansion. 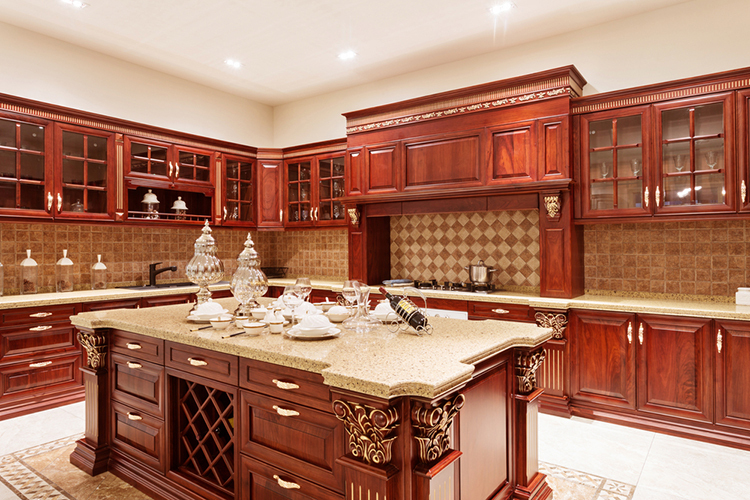 The island is decorated with precious wooden motifs and has a cabinet incorporated, while the wide cooking area recalls the fireplaces of castles. 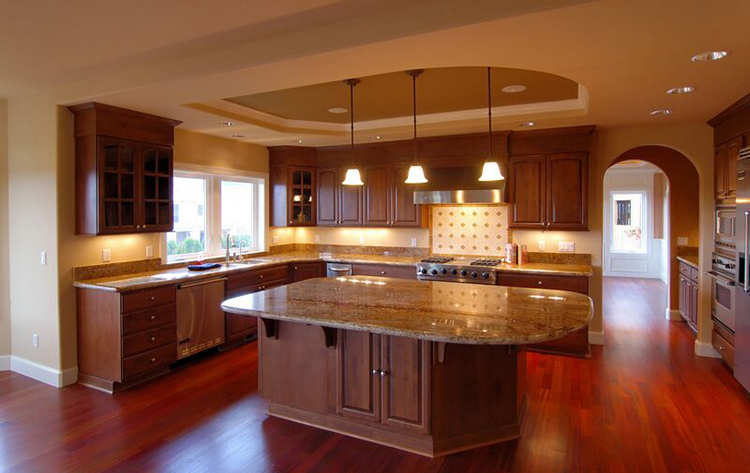 Countertops are made with polished marble and can be utilized indifferently as eating surface or working area. 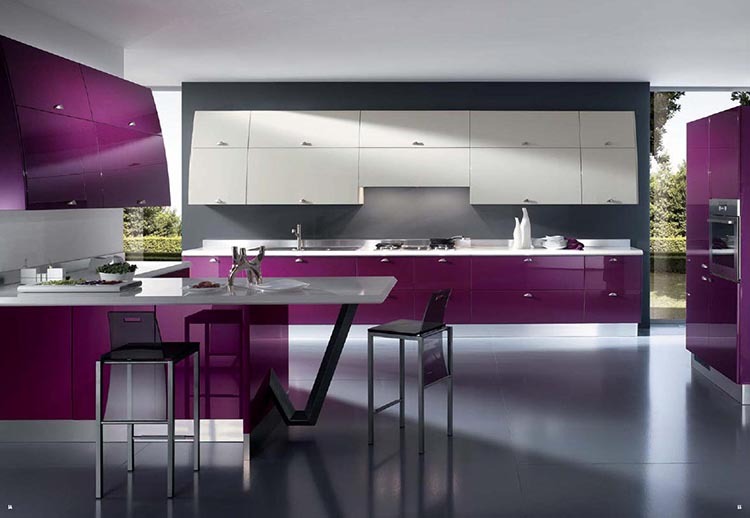 Superbly well designed kitchen that can be indifferently set in a luxurious loft or in a posh mansion. Space is masterly divided in several specialized areas – cooking area, storage area, washing area, the oven corner. In the middle, the large square island can be utilized as a broad and functional working area. Its distinctive features: wooden decorations, valued taps, wide and practical ceramic sink, countertops in polished marble. 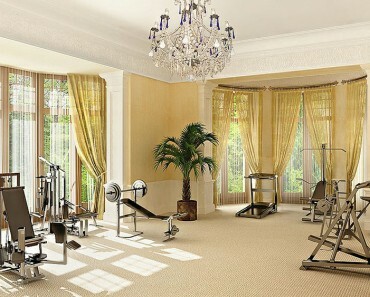 Room is king in this simple but powerful layout that is certainly very suitable for a villa or a mansion. The broad cooking area allows you to cook and serve food to your most intimate friends sat down at the counter-shaped island comfortably, while everything is at hand thanks to the large cupboards. 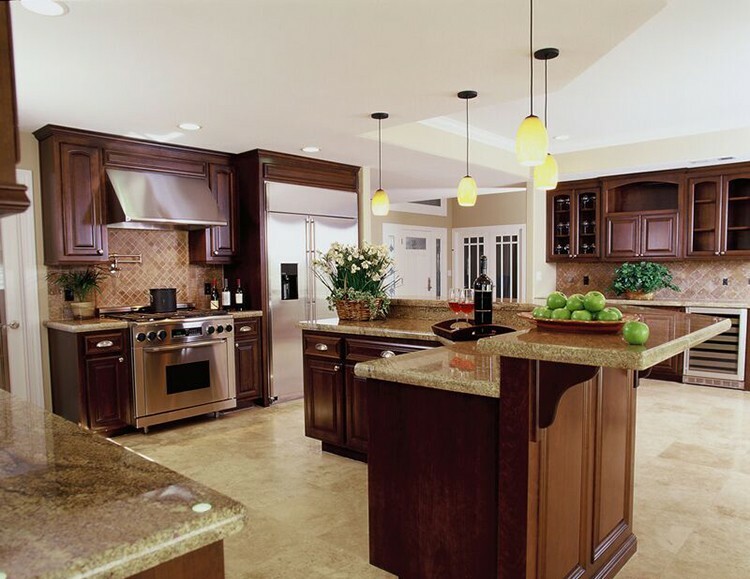 Further value is added by the wooden decorations and the countertops of polished marble. 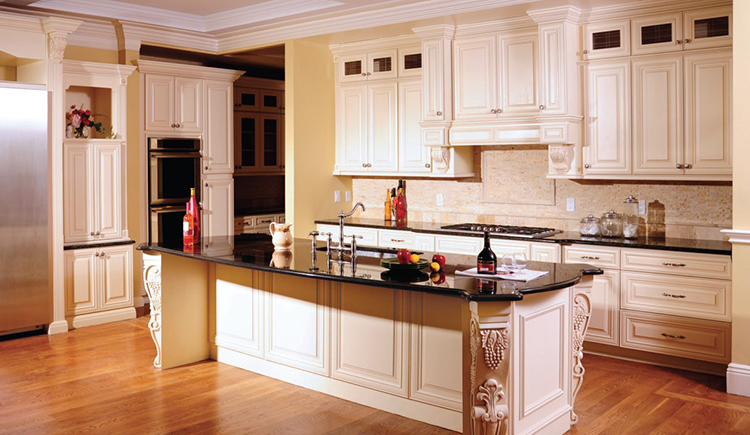 Choose this solution if you are looking for a real luxury kitchen. The wise use of marbles, Inlays and golden decorations naturally create a sense of opulence and richness without decreasing functionality in any way. 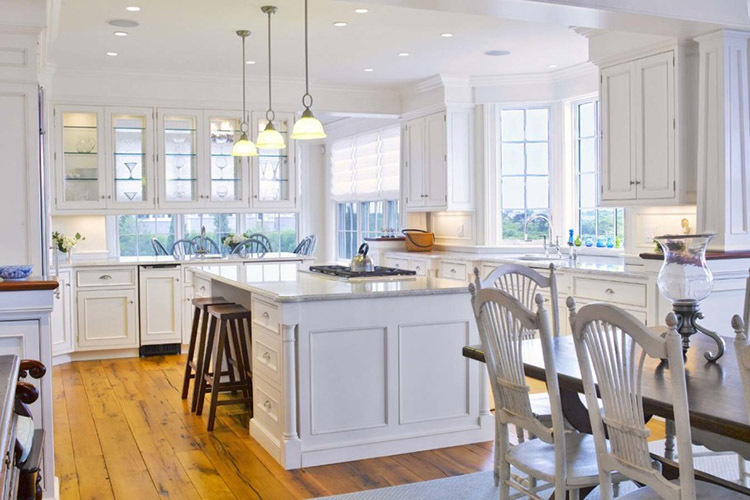 Warm, roomy and posh, this kitchen could be easily utilised also as a living room. A roomy layout that allows you and your guest to move with ease through the kitchen. The sumptuous decorations on the cupboards and the sides of the island combined with its light cream colour create a pleasantly warm atmosphere that will make your guests immediately feel at ease. 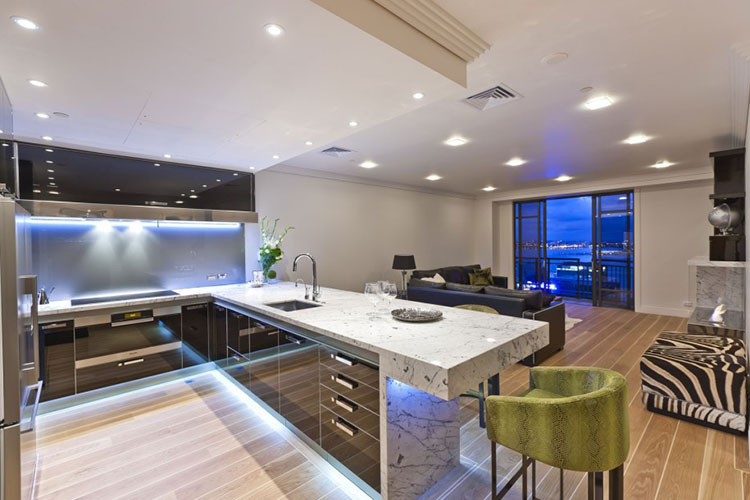 A smart design that merges living room and kitchen in one! 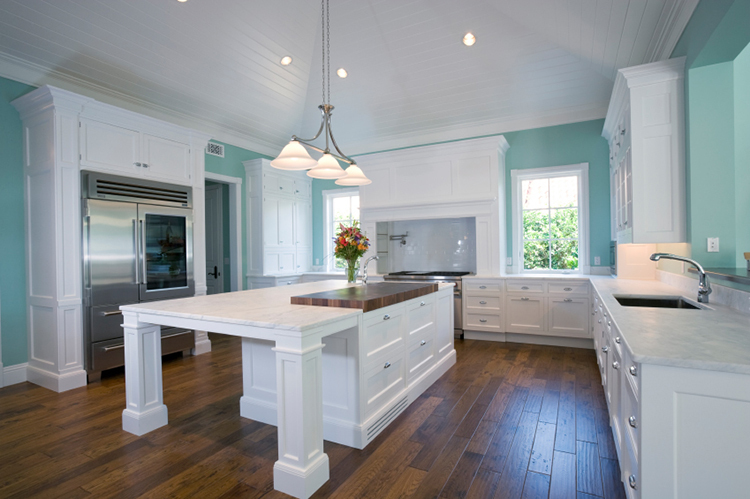 This layout creates a roomy space between the island and the hob where the chef can comfortably work, while guests wait being sat down at the table. Kitchen and living room are merged in one in this roomy layout. The big cupboards and the long counter give you all the space you need, while a desk allows you to utilize this kitchen as a place where to both work and live. Definitively a great design for a luxurious loft. The wise utilization of sophisticated golden decorations on a creamy background in combination with polished dark marbles creates an effect that is luxurious but not trivial in this vibrant design with classical Greek lines. A great solution if you wish to impress your guests. Roomy and bright yet cozy, this kitchen is really fitting for everyday life. The large island with side desk and the long, big table turn your kitchen into a place where to work and live. You will definitively feel at home here. Very elegant the solution of surmounting the large hob with a classically styled mantel . The hob is spacious and set inside a false fireplace with an elegant and finely decorated mantel. 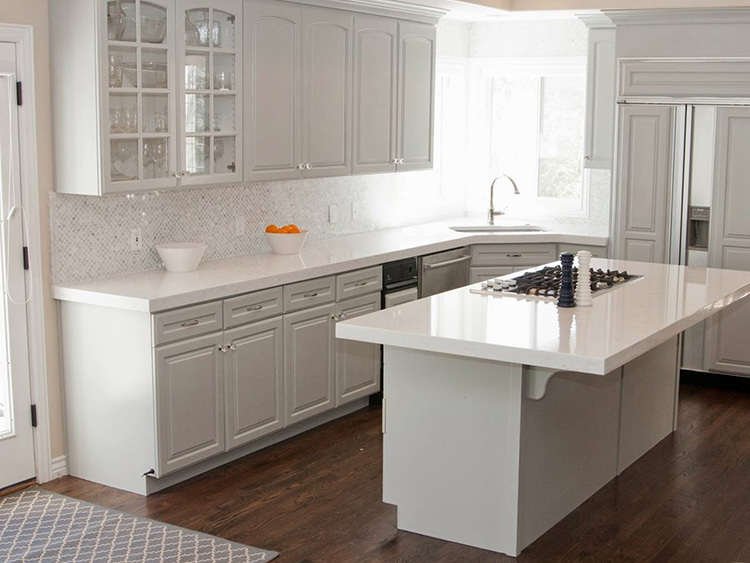 The sink in white ceramics is large and practical, and the island is long and narrow in order to take up less room. Sophisticated yet warm, this design makes your kitchen the best place where to receive your guests and friends. 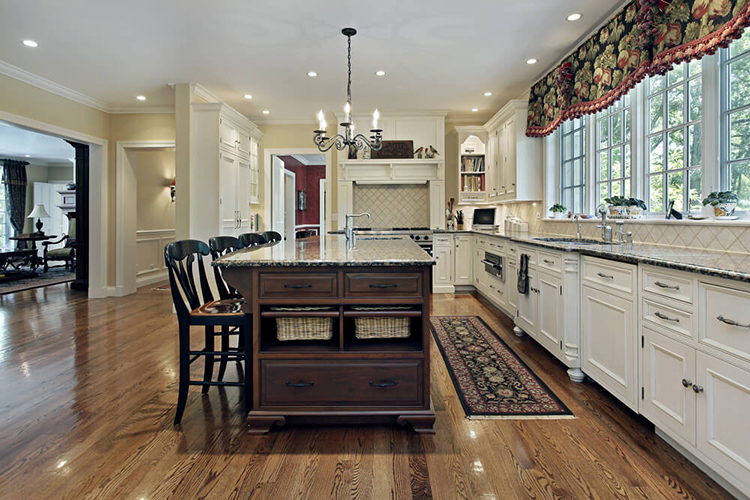 The long and large island with two sinks provides a really practical working area. Immediately behind, there is the cooking area equipped with a big oven and a hob and set inside a false fireplace. Your guests wait sat down at the table, while you are cooking in front of them. 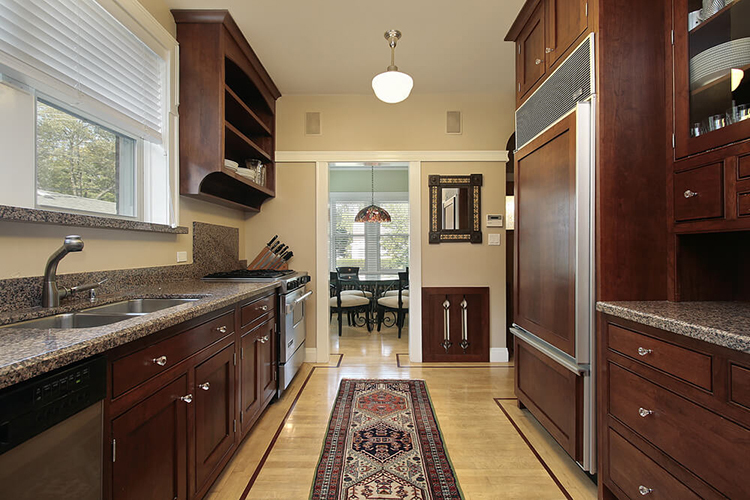 This roomy layout merges the dining room with kitchen, and it is a great solution for enthusiasts of food preparation. 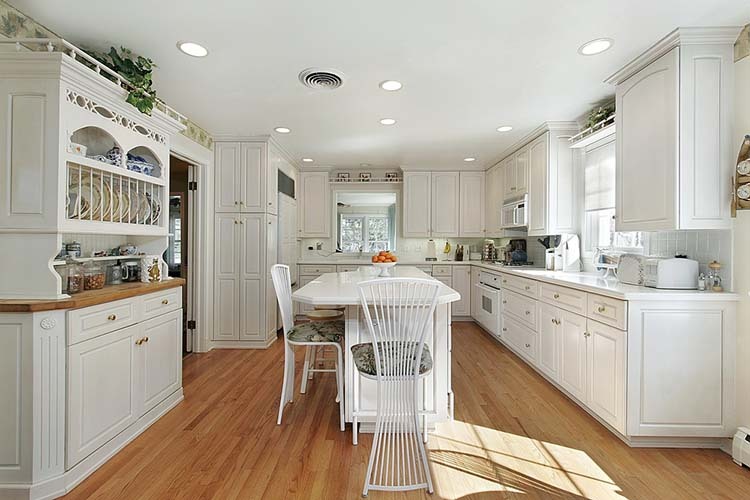 Warm and elegant, lead white makes this kitchen a cozy and pleasant environment where to cook and eat. 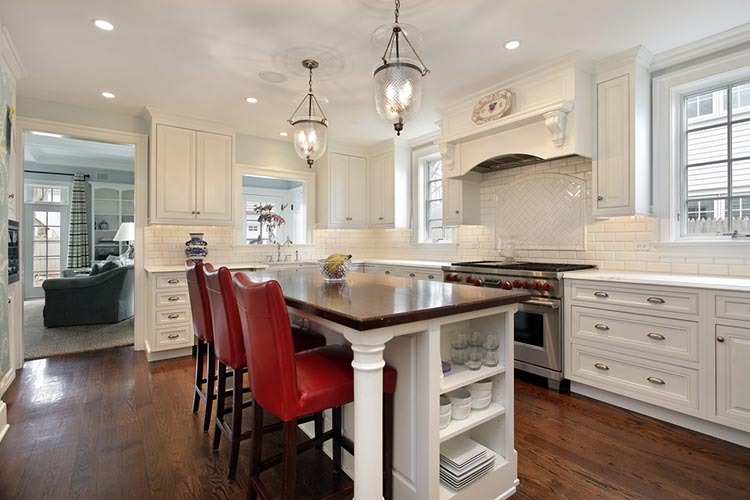 The long counter is equipped with two practical square sinks in white ceramics, while the hob and the oven are set under a false fireplace surmounted by a richly decorated mantel. Some wide cupboards and a big fridge add even more functionality. 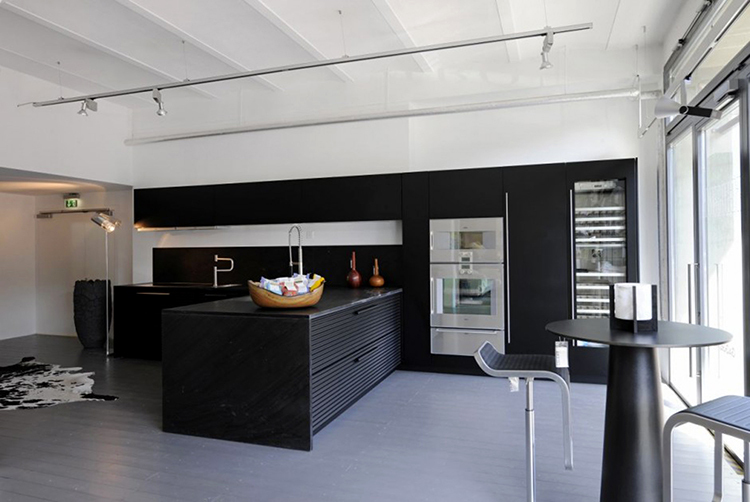 A very modern layout that recalls the design of industrial kitchens. 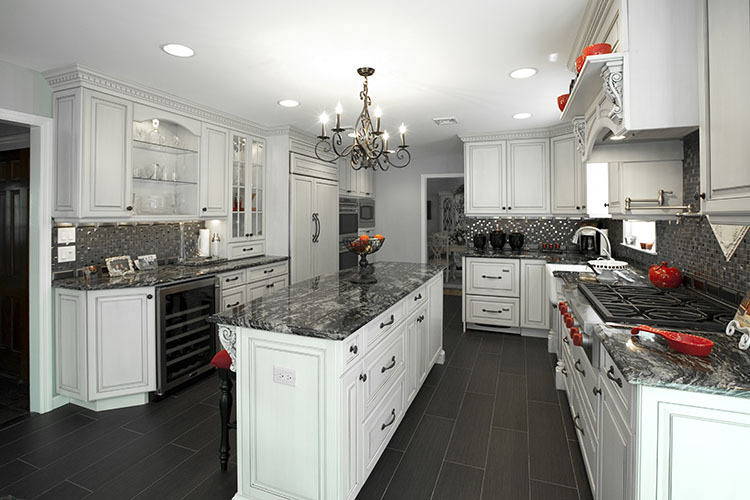 Two big ovens are set in a dedicated area, while the large and long island provides additional working surface. Great solution for real enthusiasts of food preparation that need a practical kitchen to cook big amount of food for many guests. 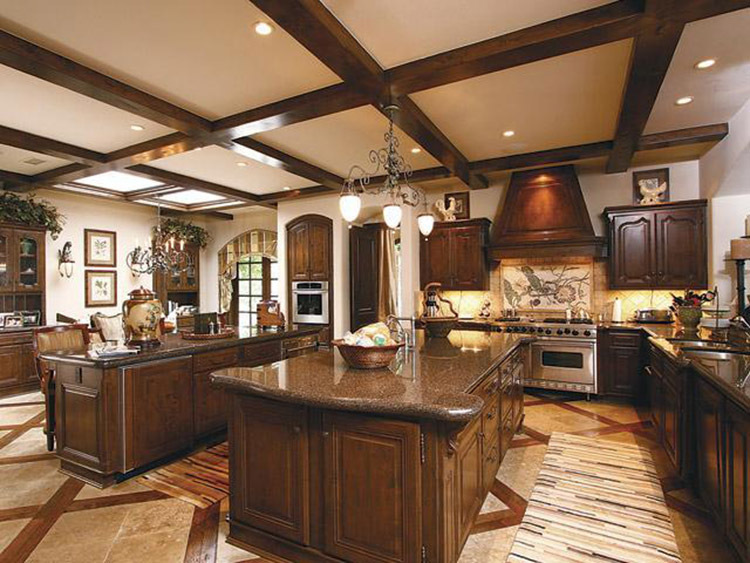 This is a very good layout for the kitchens of villas and mansions. The space is split into two distinctive areas, one where to have meals that has a nice walnut table placed right in the middle, and another where to cook that is equipped with a large and compact island, a long counter with sink, a spacious hob with big oven set inside a false fireplace classically decorated. 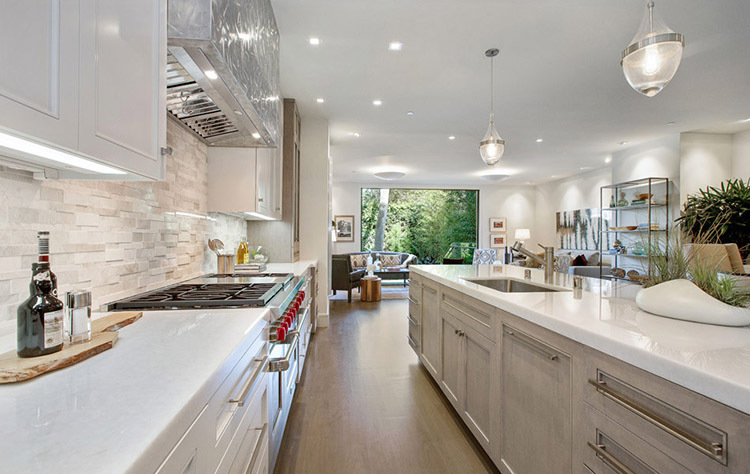 Very modern and with a design based on essential lines, this kitchen is bright and roomy. The island is replaced by an avant-garde table, while a very practical working desk is provided by the large and long counter made in steel and equipped with two square sinks. The addition of a couch and a library on the right makes this kitchen a well-thought solution for a studio. 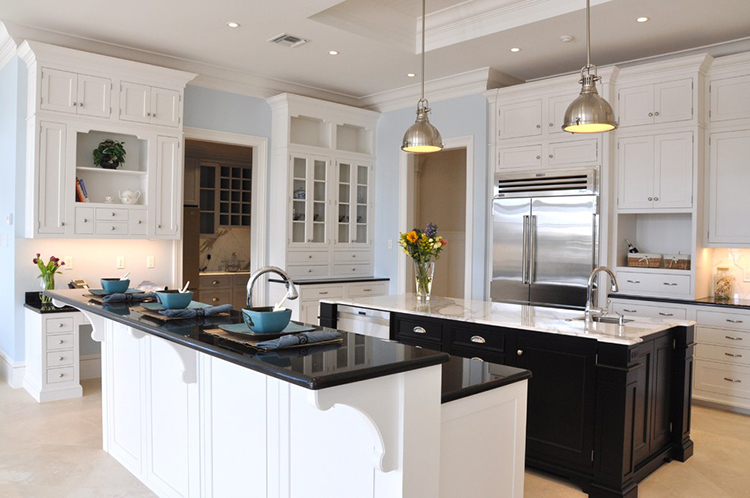 Modern and traditional elements are perfectly combined and balanced in the nice design of this kitchen. A high level of functionality is ensured by the presence of two big square sinks, a large counter, a big oven and a spacious hob. 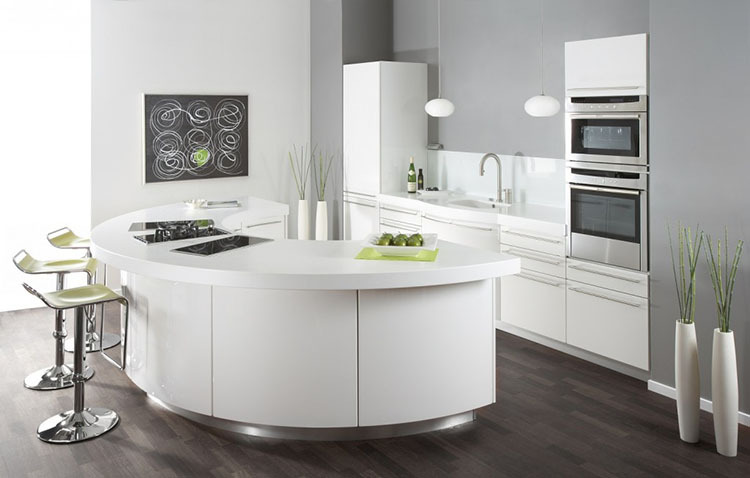 The counter-shaped island allows you to serve food and snacks to your guests. In this kitchen, the island is turned into a table with an innovative design that merges tradition and innovation without losing some basic functionalities, like the practical small sink and the countertop in polished marble. The working area is classically arranged with counter, a large sink in ceramics and two wall mounted draining racks. Fridge, cupboards and cooking area on the sides. 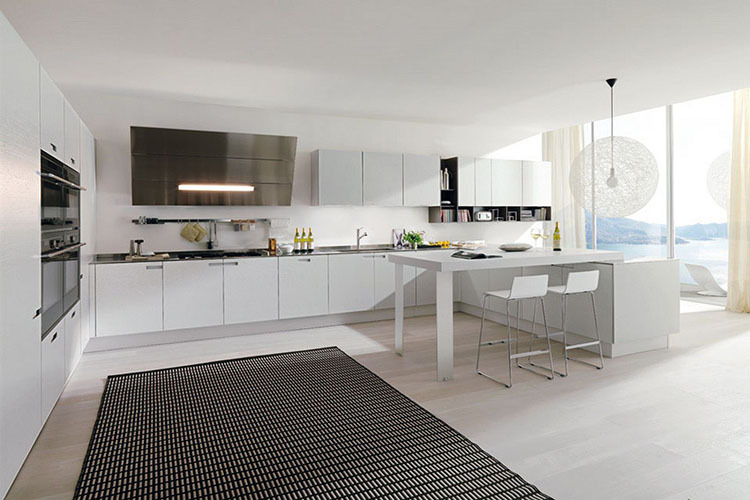 A very modern design based on linear patterns makes this kitchen beautiful and functional. The layout shown in the photo is perfect for a flat, as the furniture does not take up much room. Smart combination of a table and a cooking area, the island allows you to cook just standing in front of your guests. Behind, a large and functional sink. Cupboards, ovens and fridge are set on the left side. An avant-garde concept that merges living room and kitchen in one room. 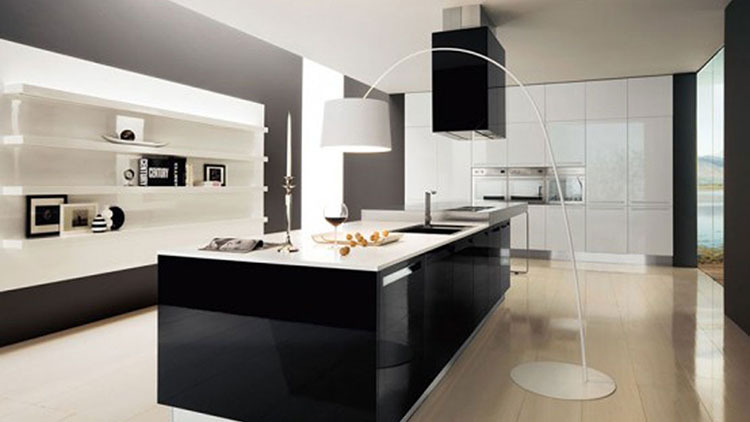 The elegant arch-shaped lamp enlightens the large and practical island where are set appliances, sink and hob. 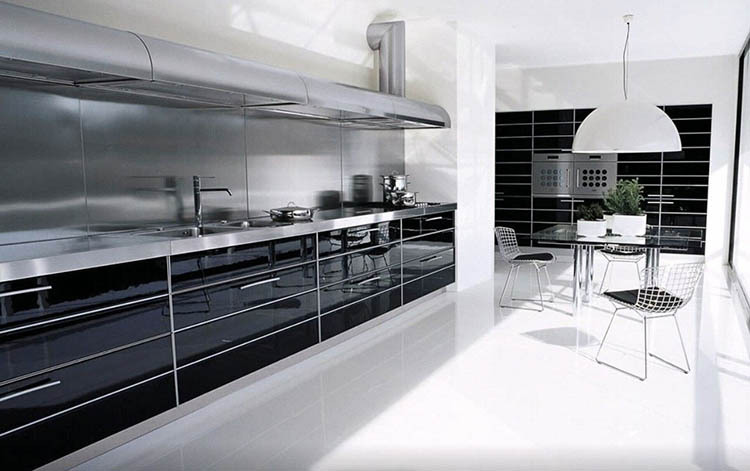 Ovens are wisely inserted into a big wall cupboard, while some shelves on the wall on the left add a touch of elegance. Fully equipped with one big hob, four ovens, one giant fridge and several cupboards, this grey and white kitchen is a real paradise for food preparation enthusiasts, chefs and everybody who loves cooking. The narrow and long island adds working surface without taking up too much room. 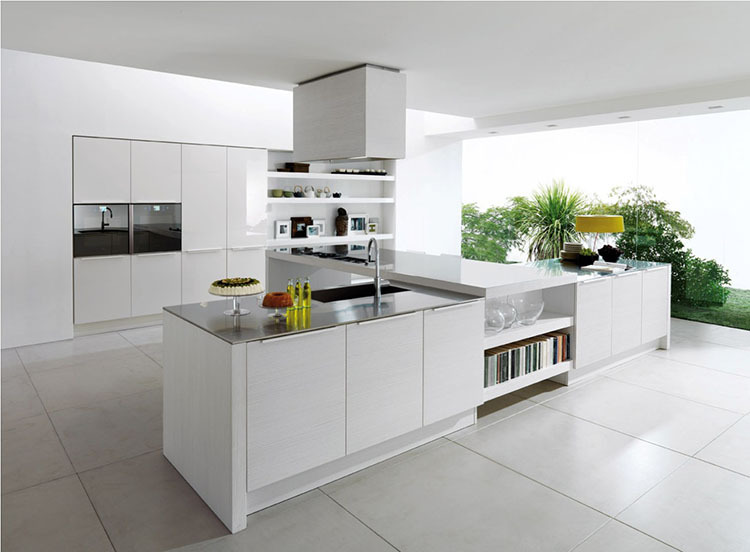 This innovative design changes your kitchen in an open-space that offer all the functionalities of a living room. 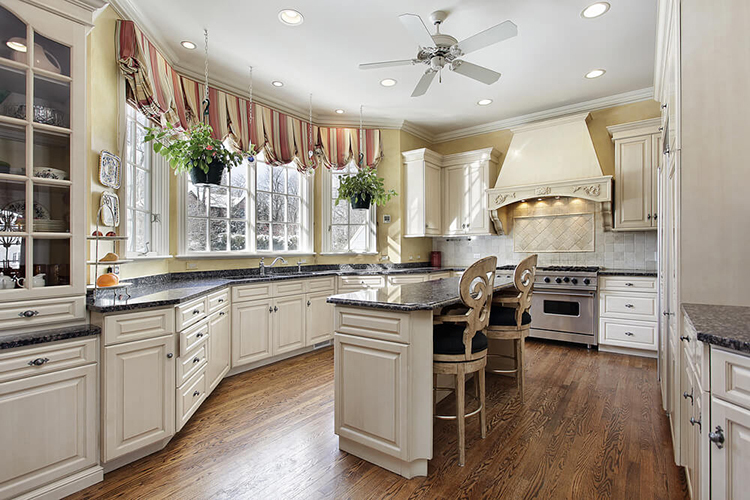 The layout is wisely organized by dividing the kitchen in several areas. On the right, a long counter equipped with hob, sink, ovens, fridge and cabinets provide all the necessary to comfortably cook your meals. The large island in the middle works as both cupboard and working surface. In the far end, the living area. 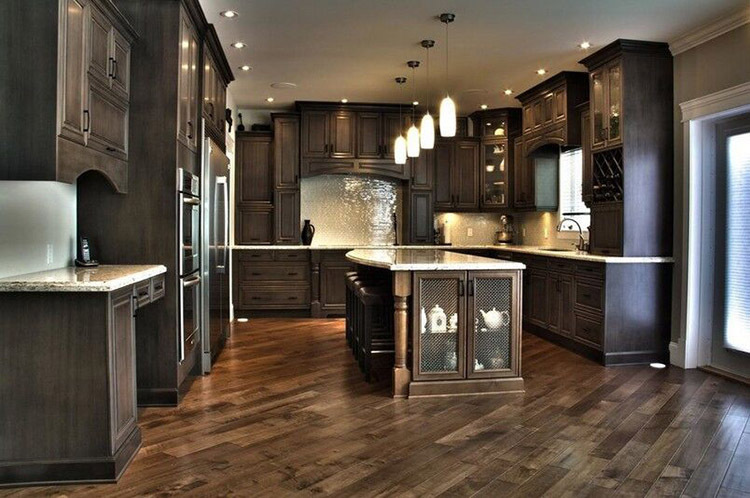 Cream and walnut colours create an effect that is both elegant and warm in this luxurious yet nor pretentious kitchen. 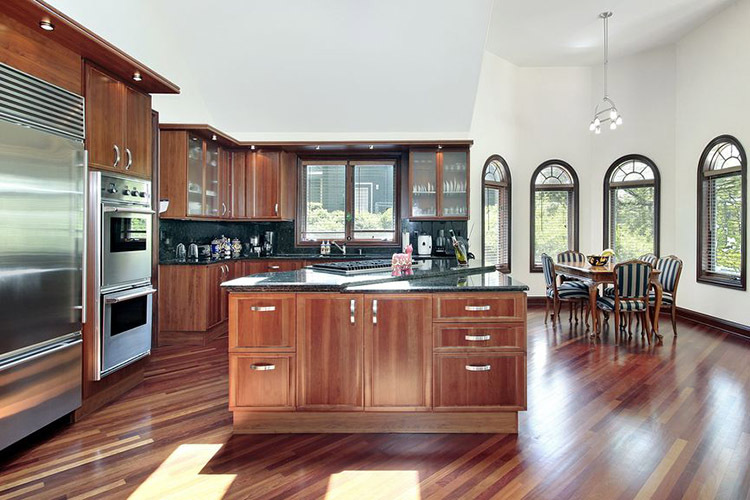 The classical lines of the design combined with the wooden decorations and a wise layout make this kitchen a space that can be utilized as living room and party room as well. The large, comfortable cooking area is designed in a way that the hob and the oven are placed close together in order to provide the best in terms of comfort and ergonomics. The island can be utilized also as a desk, as some shelves are strategically placed on its sides. The clever layout allows you to use this kitchen as multi-purpose space where to cook, live and give parties. Beautiful, posh and innovative, this classically-styled kitchen is a real multi-purpose space where to cook, live and meet friends. The definitive solution for lofts and open spaces. Equipped with a large island that can work as both table and working area, a practical wide sink in steel, a practical cooking area with hob and oven set inside a false fireplace, a desk, a big fridge, some cupboards and cabinets, some spacious counters with top in white marble. Modern, bright and roomy, this kitchen works also as dining room thanks to the large table set in the middle. Space is at the centre of its design. The dimensions of the working surfaces (hobs, counters, island) are large and comfortable, cupboards and fridge capacious. A smart layout allows you to move with ease. The charming design of this kitchen creates a cosy and warm place where cooking and having meals with your family come natural. 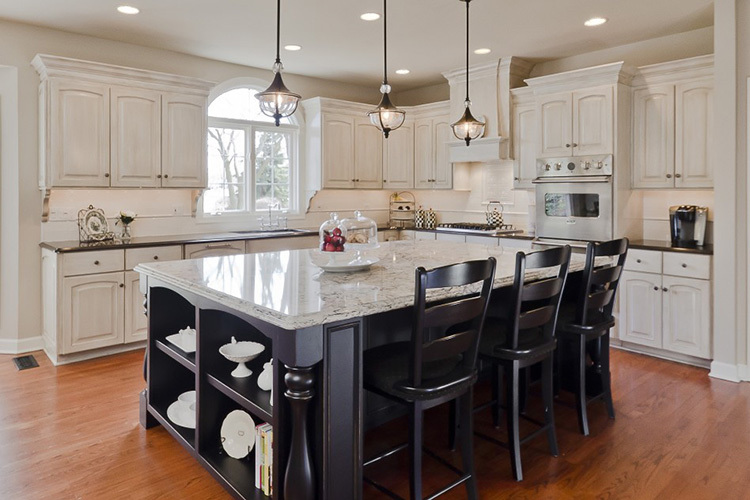 A noticeable feature is the island that is purposely planned in order to be easily turned into a table. An interesting solution for families. 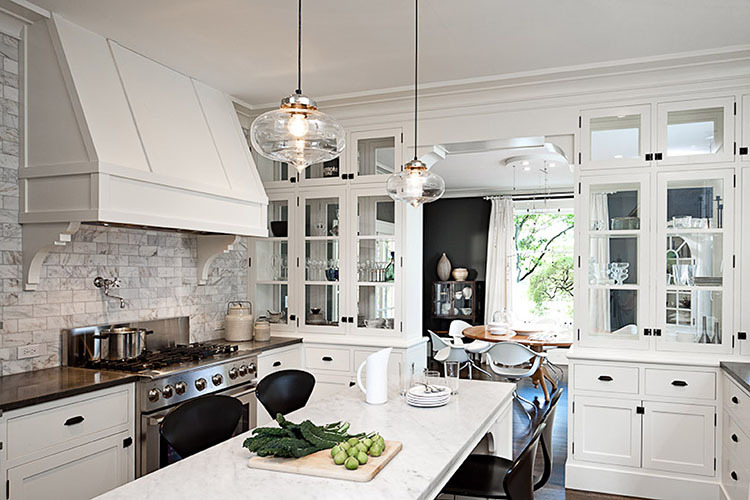 Modernity and tradition meet in the white and grey design of this kitchen. Space is smartly divided in several specialized areas (moving from the left to the right: the oven corner, hob and fridge, fireplace, big sink in steel). 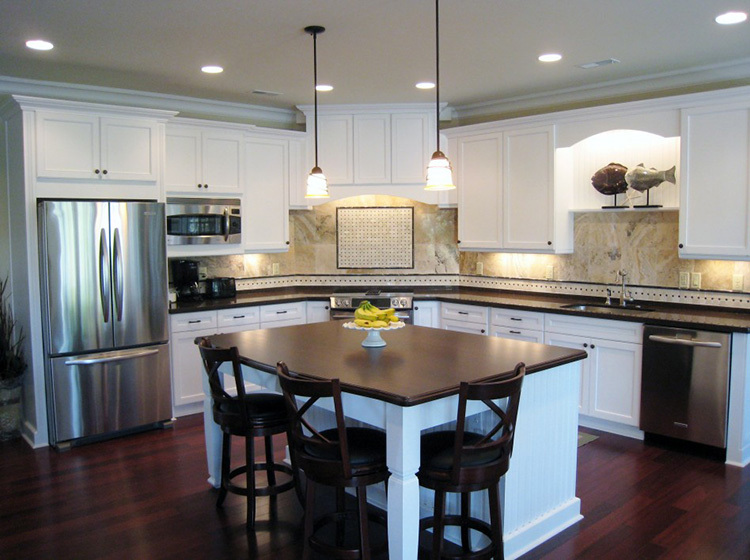 In the mid, is there a large island that adds extra working surface and can be also utilized as table. 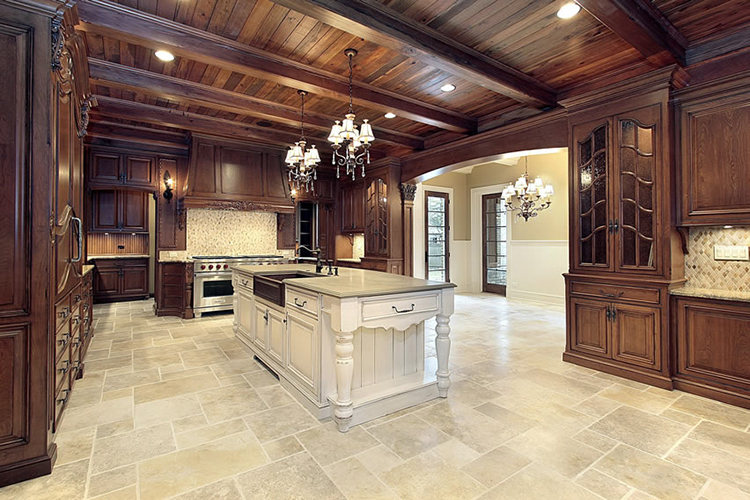 This posh kitchen is suitable for a mansion or a villa. Set it in an open space in order to exploit all the potentialities of its smart layout and cleaver design. 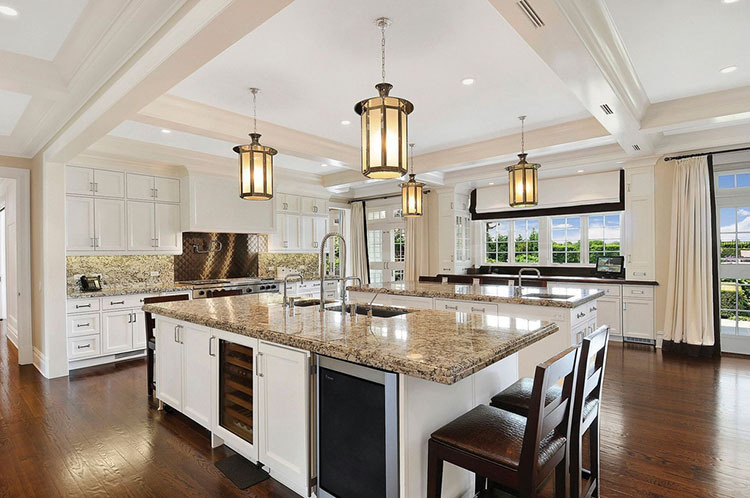 The large and long counters with cabinets is both functional and practical, while the island with fine wooden decorations adds a touch of elegance and class. Very beautiful the false fireplace where the hob and a big oven has been conveniently set. 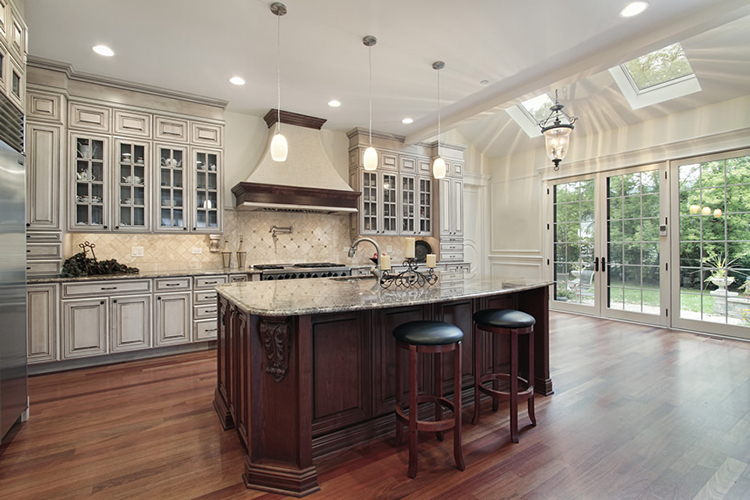 Here is another beautiful kitchen that merges both classical and modern styles in its design. The large, big island that can be either a table or a working surface holds the stage. Behind, a practical hob and a long and wide counter that runs all along the wall. One sink, one big fridge and tree ovens complete its equipment. Really roomy and comfortable. Simple but beautiful, this classical design combines the visual impact of the huge false fireplace on the background with the majesty of the wide rectangular island in the foreground. Taking up little room, this kitchen can be combined with other pieces of furniture in multi-purpose spaces. This classical kitchen is a real cosy place where it is nice to stay, cook, have meals or just drink something with friends. 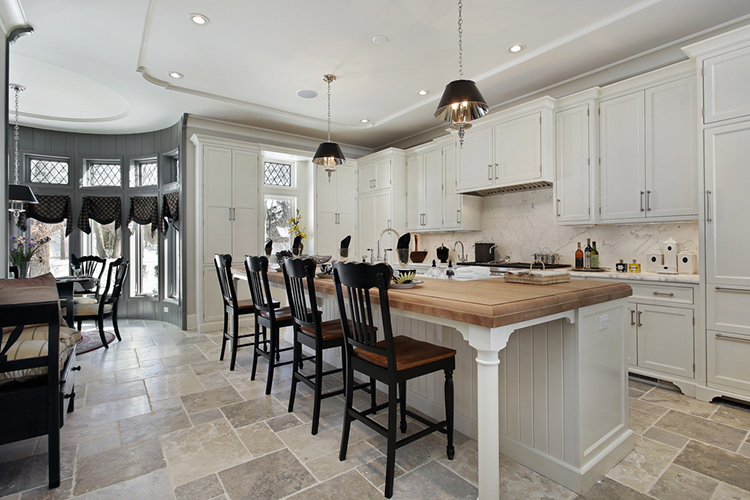 The lovely wrought-iron chairs add a touch of fantasy to the small island in the mid. The hob and the oven are conveniently placed inside a false fireplace surmounted by a wide decorated mantel. Cabinets runs all along the wall under the spacious counter. A very practical solution where functionality is king. 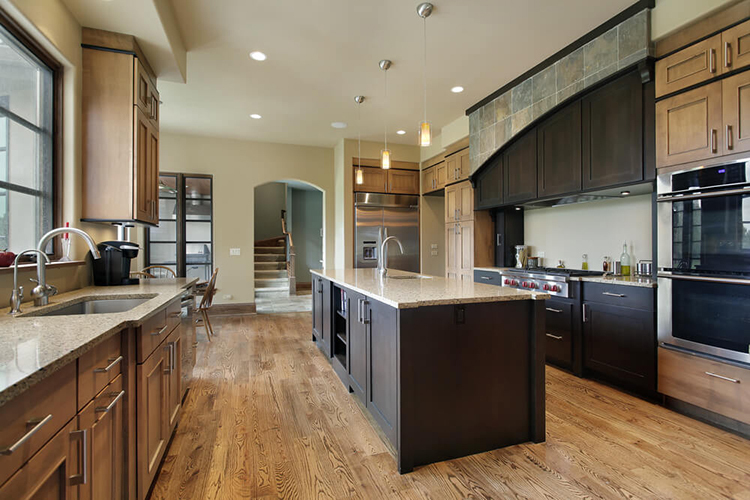 Food preparation becomes a real pleasure in this linearly designed kitchen when you can dispose of a big cooking area equipped with one large hob, two ovens, and one big hood. The big square island in the mid provides the necessary working surface, while the fridge and some capacious cupboards are close at hand. 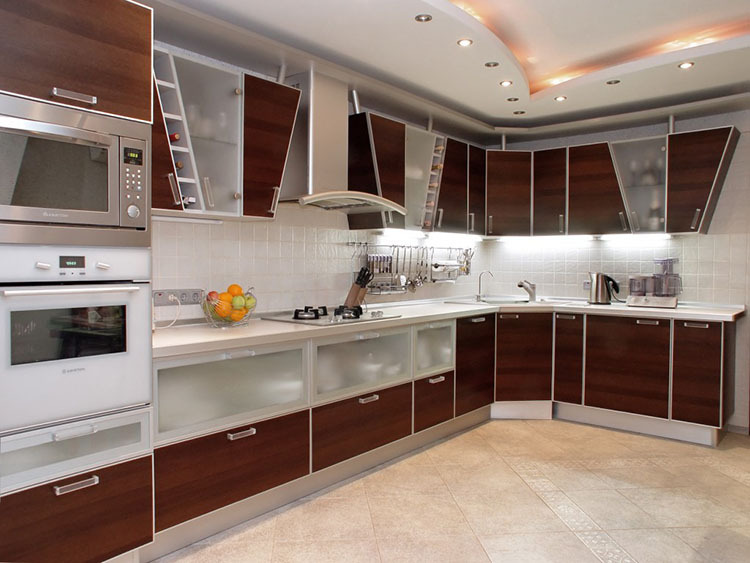 Beautiful and functional, this nice kitchen has everything that is needed to give you a wonderful experience. Its classical decorations are simple yet very elegant, while the volumes are set in a way that breaks monotony. Its smart layout really optimizes space and allows you to comfortably move and cook. 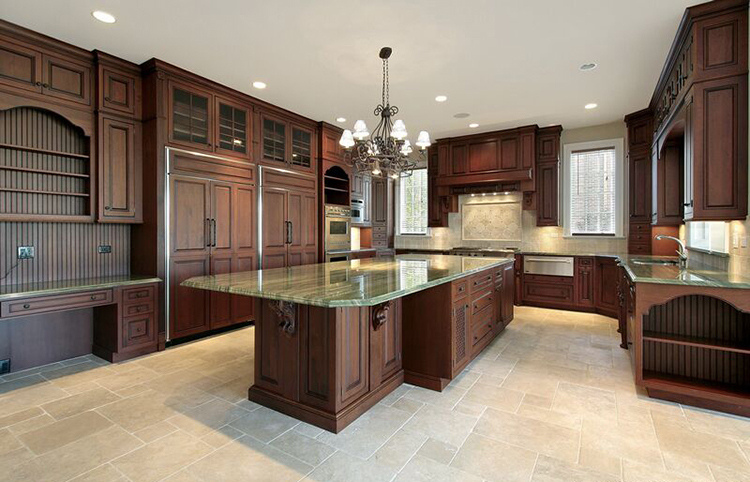 Impress your friend with this luxury kitchen that is worthy of a castle or a mansion in its majesty. The cooking area is incorporated in a big false fireplace finely decorated with classical motifs, while the opaque white marble countertops creates an effect of elegant sophistication. 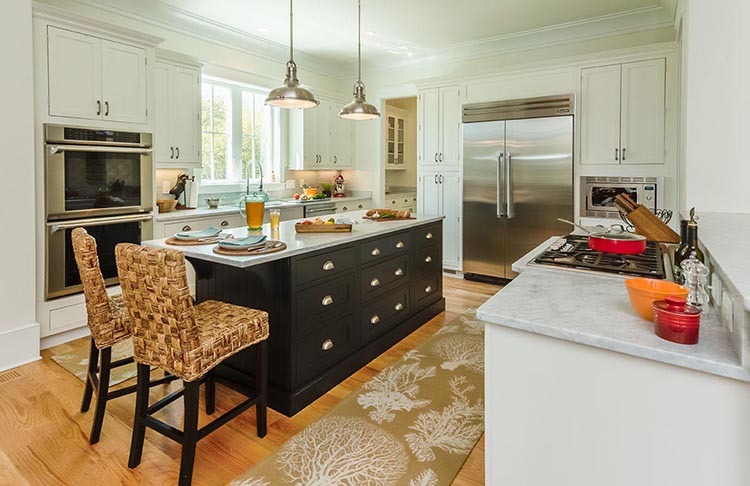 Your guests sit down at the wide, capacious counter-shaped island, while the cabinets placed below the counters provide all the necessary space to store supplies, tools , plates and silverware. 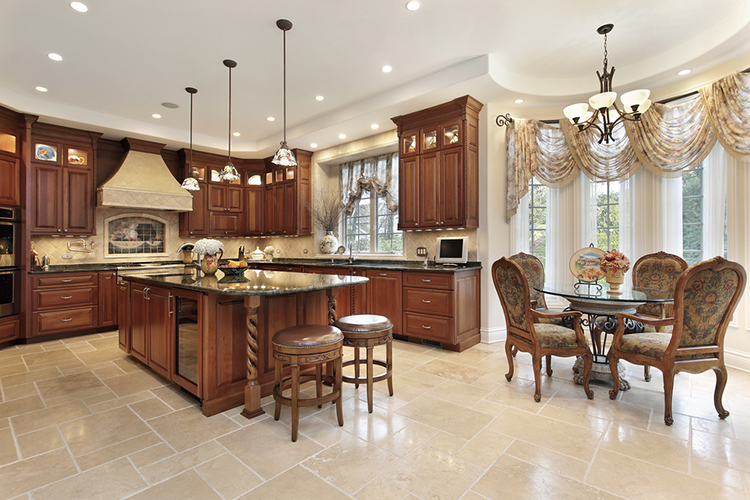 Warm and elegant, this kitchen is perfect for social eaters. Friends and guests sit down at the comfortable, spacious table on the right, while food is prepared on the large square island on the foreground and then dispatched to the table. A smart design that is fitting for multi-purpose spaces. Small but practical, this kitchen is suitable for flats, studios and apartments. 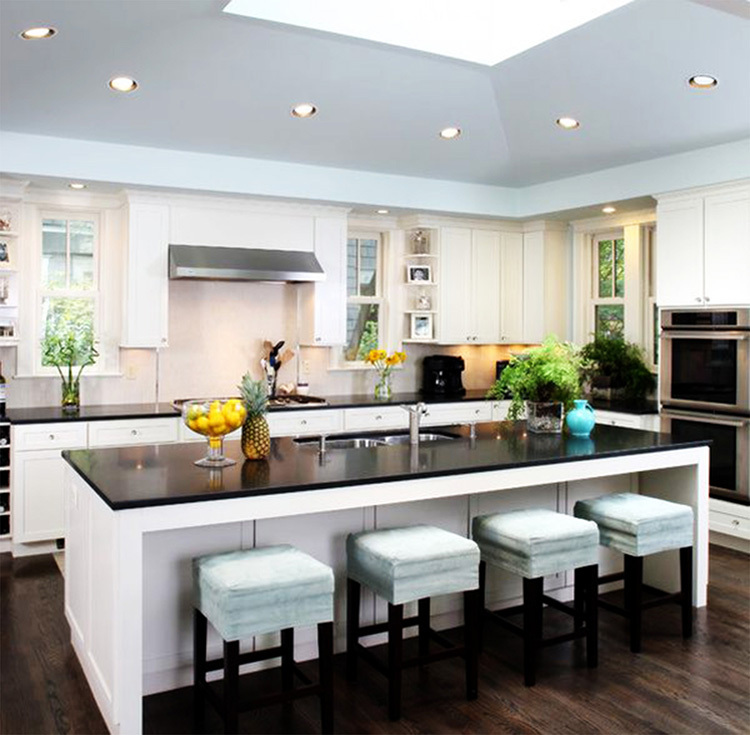 The island is absent and it is replaced by a cooking area with a modern hood and hob. Immediately after two sinks. The layout is arranged in a way that the person standing in front of the hob has everything close at hand. The design is modern and clean in order to add functionality. 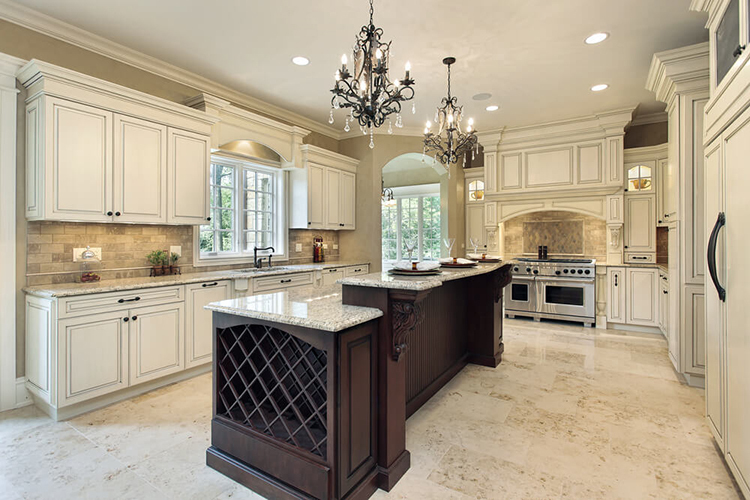 Luxury triumphs in this glamorous, classically styled kitchen. Its smart layout optimizes space perfectly and creates a bright, roomy environment that is pure pleasure for you and your guests. Hob and ovens are placed inside a big false rectangular fireplace, while taps are of top quality and the sink is covered with precious white ceramics. 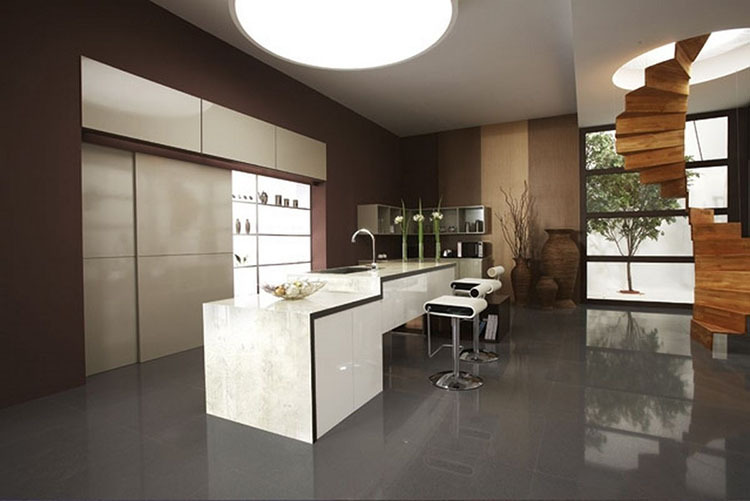 The beautiful island of polished marble is able to work as either table or working surface. 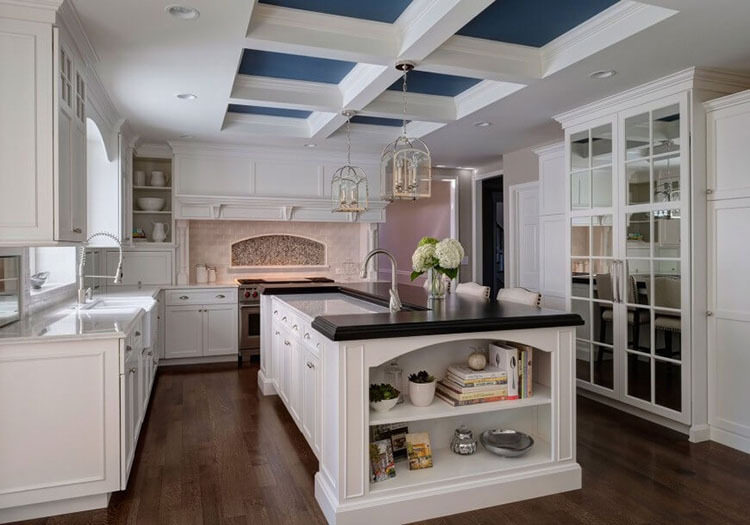 Several cabinets are set under the island and the counter that runs all along the walls in order to optimize space and add brightness to the room. Light is the main idea in this smart, powerful design that creates a roomy and bright environment where it is nice to live and spend time with family and friends. 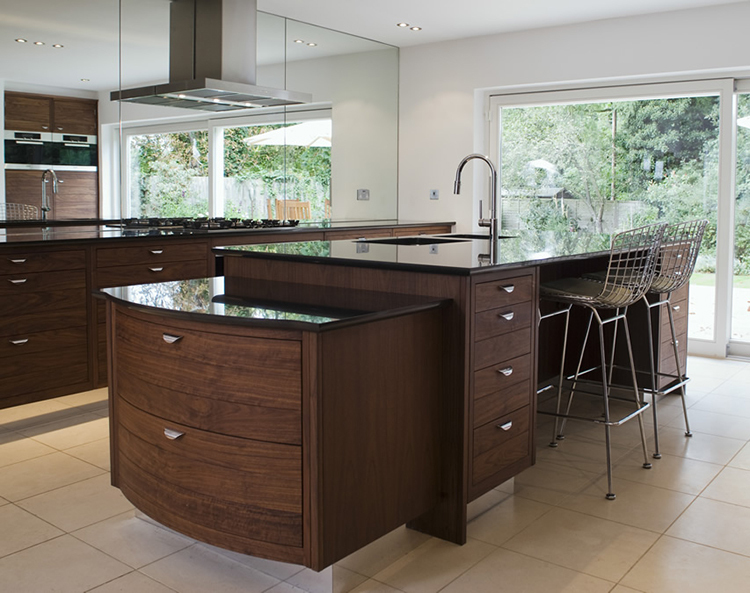 The walnut stripes add a touch of unusual elegance to this modern kitchen. The design is simple and linear, and spaces are very well optimized. The large island set in the middle offer a practical and comfortable working surface, while its smart layout leaves enough room to move with ease. Great solution for a loft, an apartment or a studio. Very roomy, this kitchen gives the best in terms of comfort. Equipped with large wall cupboards, one spacious hob and oven, two wide sinks, one table for guests and one L – shaped island that can be either a working surface or a desk. 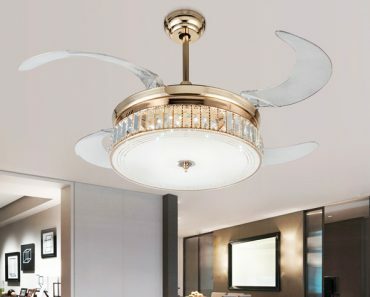 The design with rich decorations and cream colours looks really luxurious and posh. This original layout, which is suitable for lofts, open-spaces and in general multi-purpose spaces, utilizes two large islands – one as working surface, the other as desk or table. It creates a nice environment where it is possible to live, cook and have meals with your friends and family. The living area is in the background. It is furnished with a big table, a wall library, and some cupboards. Simple and modern, this design creates a happy, bright atmosphere. 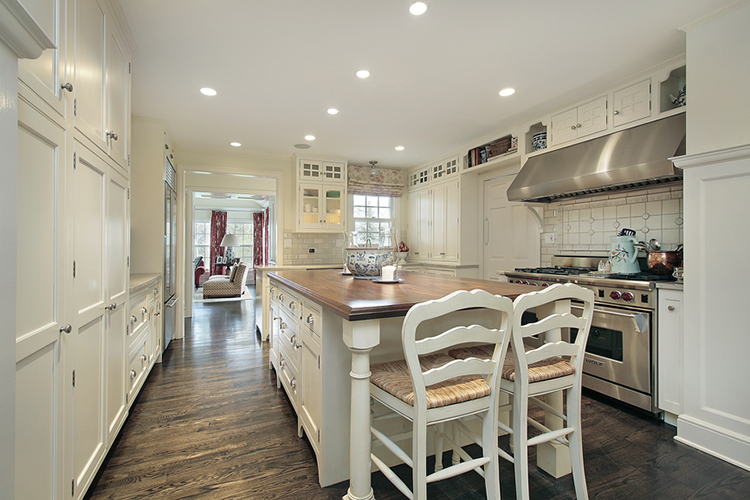 The functional layout merges in one kitchen and dining room. A large island with practical big sink in white ceramics provides a big working surface from which food can be easily dispatched to the guests sat down at the wide walnut table. Hob, oven, counter and wall cupboards are at hand just behind the island. 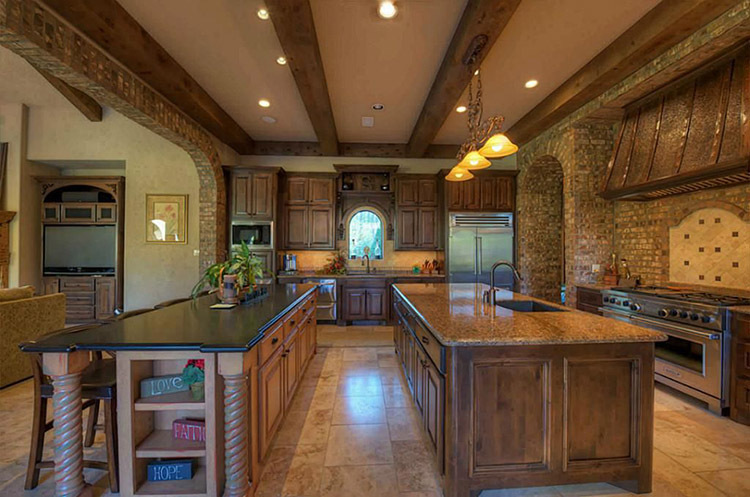 Very traditionally styled, this kitchen resembles the kitchens of the past. 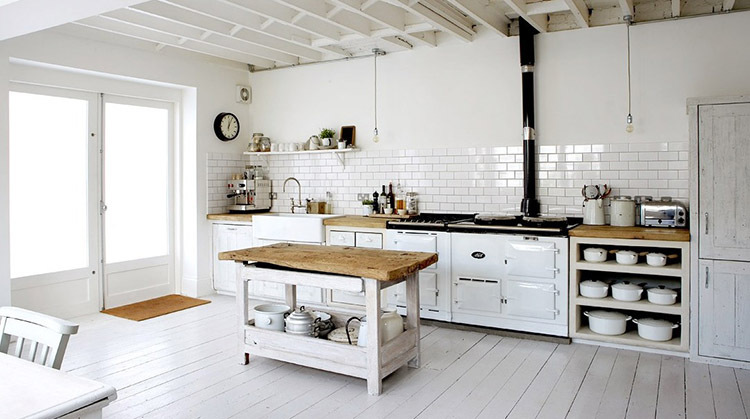 White tiles on the wall, wood stove and wood oven, thick rough wood countertops, cupboards with pickled panels and rectangular sink in white ceramics create the same atmosphere of a kitchen of a century ago. The layout is basic, but functional. 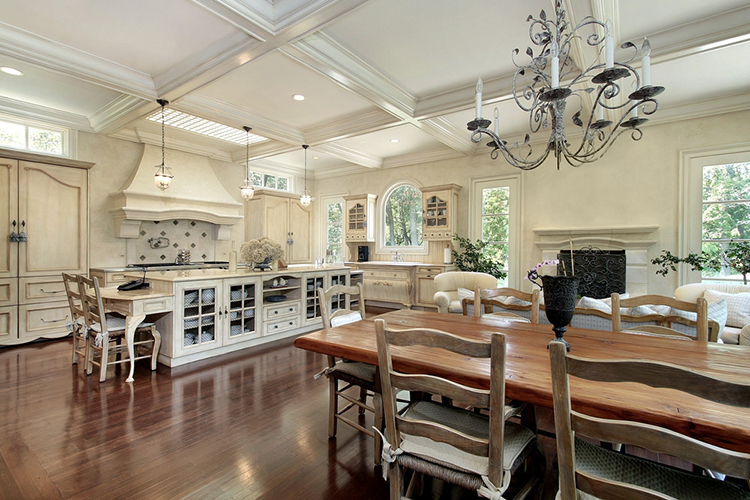 A real luxury kitchen that works also as living area. Furniture is sumptuous and finely decorated with classical motifs, while the working surface is concentrated on the island where the rectangular sink has been set. Utilize this solution in combined living spaces or multi-purpose spaces. Small, compact and practical, this kitchen is very suitable for flats, studios and apartments, as it takes up very little room. Hob, oven and sink are placed all along the long wide counter that is a great working surface. The fridge is on the left, some cabinets are placed up on the wall. 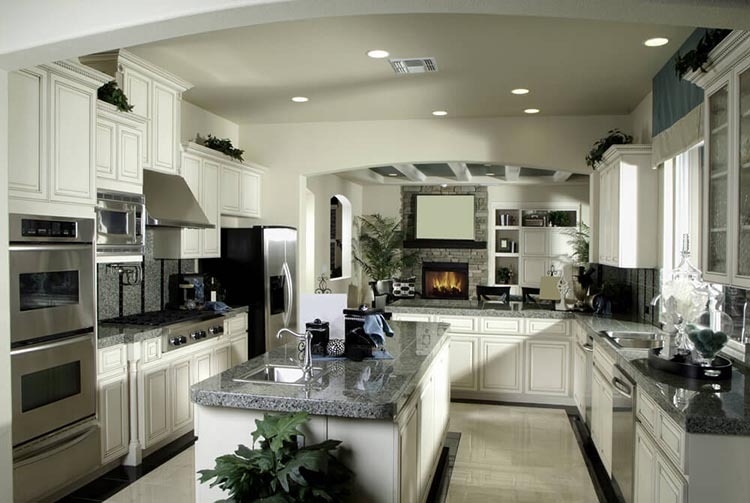 This layout turns your kitchen into a great place where to cook and live. Wide, bright and comfortable, this kitchen allows you to spend with your family the nicest and most intimate moments. A long and large counter equipped with hob, oven and sink provides a practical working area for food preparation, while meals are consumed on the island in the centre that combines the functionalities of a table, a desk and a cupboard. Finally, a big and spacious fridge on the right corner ensures all the necessary space to store supplies. 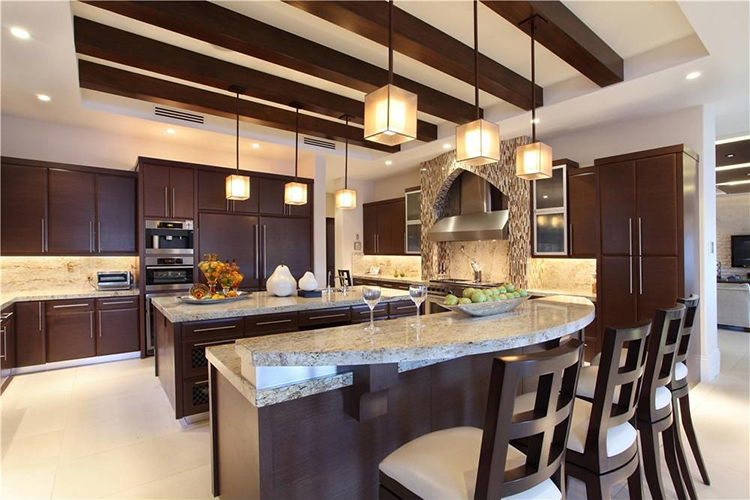 Luxurious, spacious and exclusive kitchen that is suitable for a mansion or a villa. Its functional layout creates a wide, roomy environment with a large island in the mid that can be utilized as both desk and table. A big false fireplace incorporates the cooking area, while the large counter running all along the wall provides a wide, practical working area. The giant fridge is hidden with wooden panels that repeat the ornamental motifs of the cupboards. Its classical and elegant design will favourably impress any sort of quality guests. Cosiness is the key-concept of this smart, bright kitchen that transmits energy, happiness and good vibe at first sight. Its not-pretentious design made of classical decorations and linear shapes creates a familiar ambience where it is nice to enjoy meals and share food preparation with intimate friends and relatives. A long, beautiful arch covers the big cooking area composed of two ovens and one six-cooker hob. 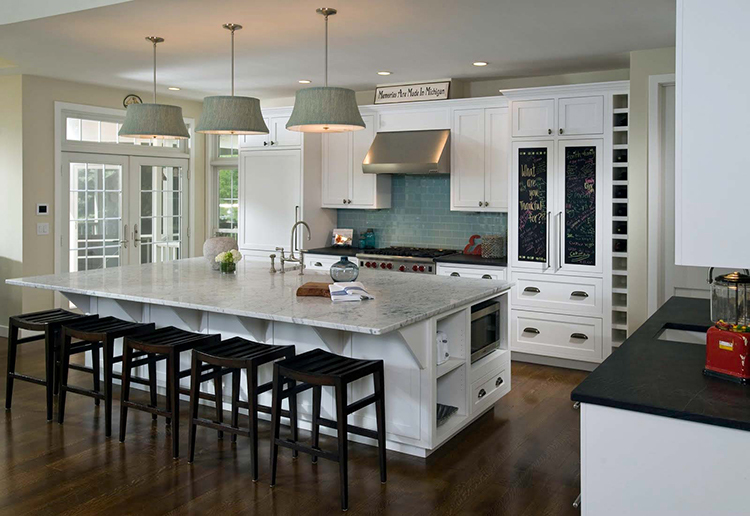 The working surface is provided by the large island equipped with two sinks and some cabinets. The design is elegant but simple, while the layout allows you to move with ease through the room. 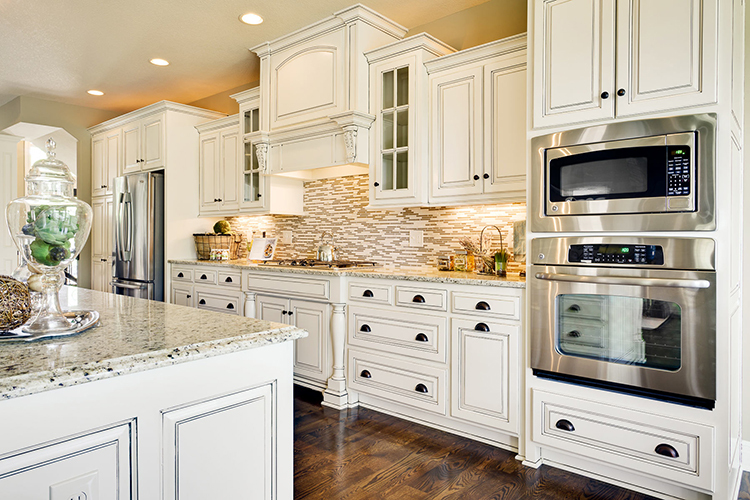 Food preparation lovers will certainly like this kitchen that helps them to make a good impression on guests. 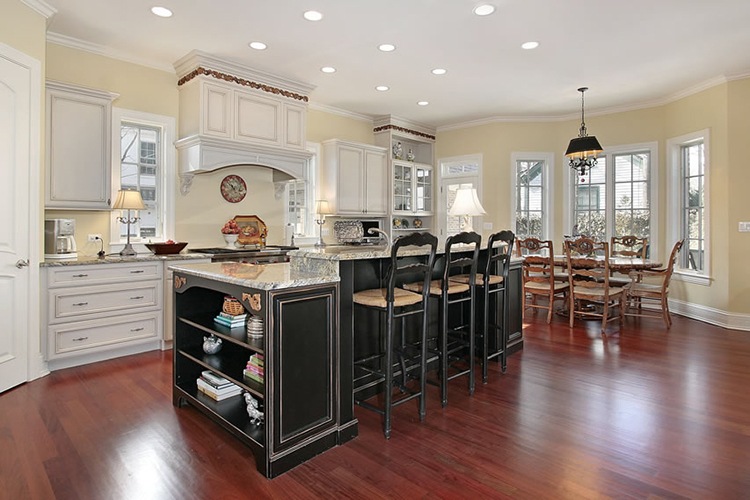 A classically designed kitchen with a nice dining area that is very sutiable for families. The combined island offers not only an additional working surface, but also a spacious cabinet and a practical but pleasant to the sight wine rack. Finally, two ovens and a medium-size hob provide all the necessary equipment for food preparation. Two large counters equipped with a big, practical sink provide all the necessary working surface in this posh and roomy kitchen that is particularly fitting for having meals and snacks with friends. Noticeable the wide island that can be easily converted into a table. A system of four ovens and the wide hob allow you any kind of food preparation and manipulation. Space is masterfully organized around the classically designed fireplace in this spacious and bright kitchen. Enough working surface is ensured by the short but large counter equipped with a medium-size sink and the large island that can work also like a table. The several window panels connect the kitchen to the outdoors and create a very scenic effect that cannot but impress your guests. 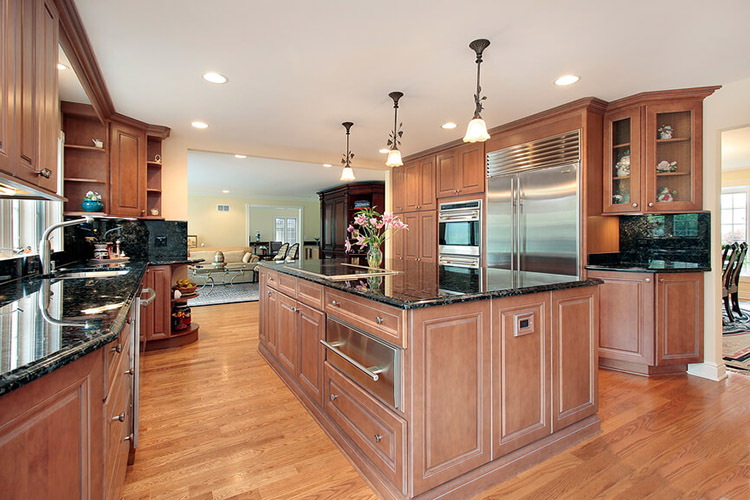 A lovely kitchen with two islands and one wide fridge that is perfect for having parties, meals or snacks with friends. 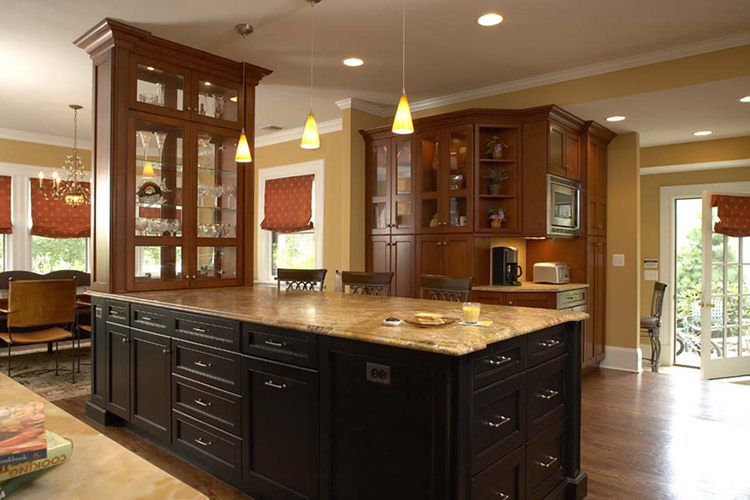 A long and large counter ( not shown in the photo) with cabinets runs along the wall and provides additional working surfaces. 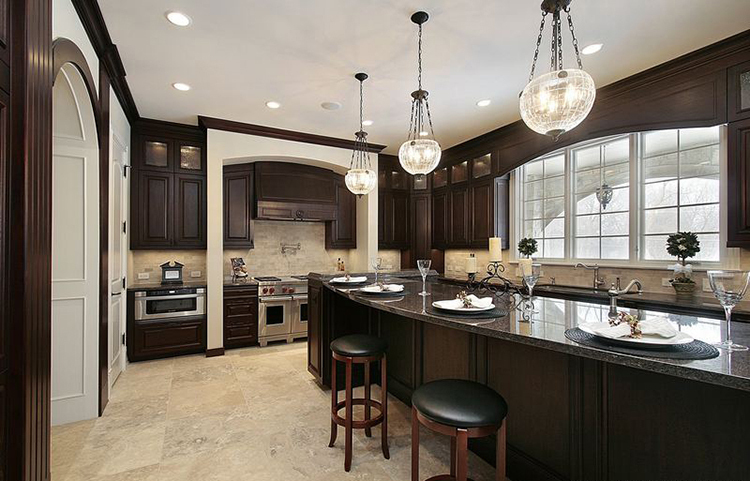 Beautiful and comfortable, this glamorous kitchen is great to give parties and have meals with friends. A classical oval walnut table with wooden chairs decorated with inlays provides a comfortable dining surface, while the working area is reduced in order to optimize space and leave as much room as possible. The distinctive element in this layout is the very large and practical multifunctional island that provides not only a big working surface, but also spaces where set shelves, cupboards, ovens or other equipment. The design with clean lines creates a happy ambience where it is fine to have meals with friends and family. The capacious fridge is wisely hidden with a panel that repeat the ornamental motifs on the cabinets. 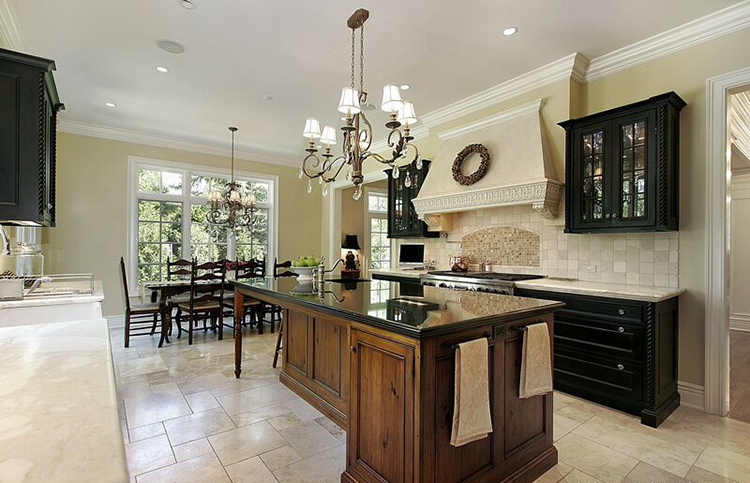 Finely decorated and classically styled, this glamorous kitchen merges together luxury and comfort. The large island provides a good working surface, while a big cooking area equipped with two hobs and two ovens ensures all the necessary resources for food preparation. A smart solution is having placed the big but useful wine rack on the side of the island. A medium-size sink with a capacious, smartly designed dish rack placed right above completes its equipment. 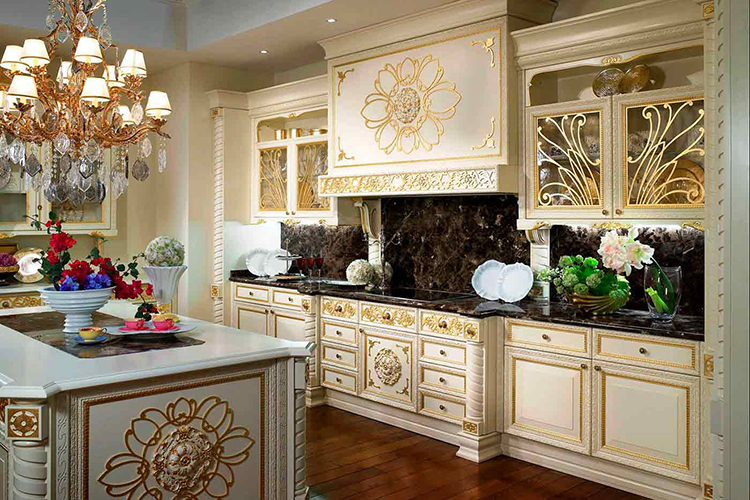 Golden decorations with classical motifs gives a touch of warm elegance to the classical design of this charming, luxurious kitchen. The wooden chairs with precious inlays and the small round table create an enchanting corner of beauty that will quickly seduce guests with its ambience so sophisticated yet intimate. 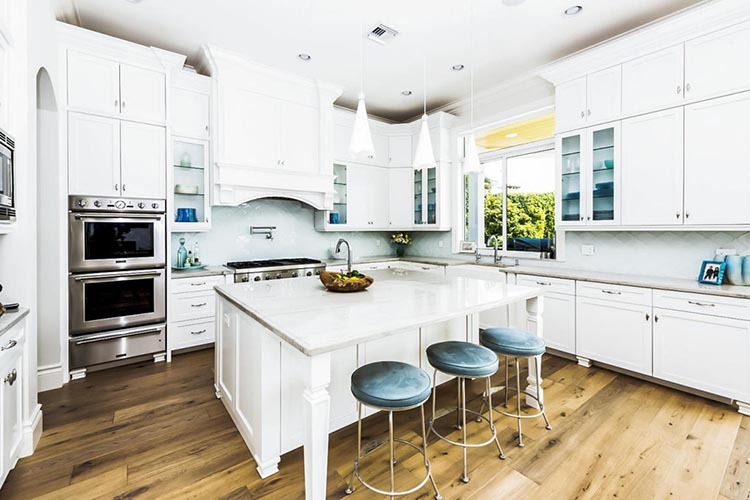 Bright and simple but in the same time elegant, this kitchen is designed to create a happy and friendly atmosphere that will delight your friend. 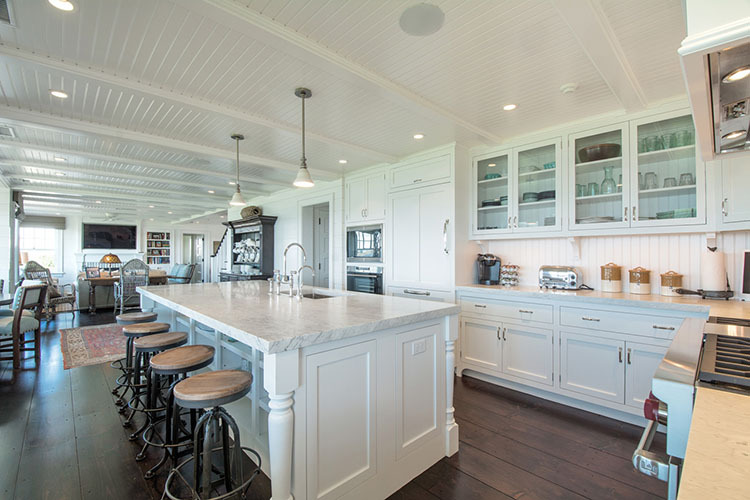 Its highly functional layout wisely split the room in a working area with big stove behind the large and comfortable island where guests sit down and a living area that is not shown in this photo. A linear design that is very focused on functionality and practicality makes this kitchen a great place for food preparation. Large working surfaces everywhere, three big ovens, giant fridge, spacious cupboards and a smart layout where everything is really close at hand ensure a great experience of cooking. 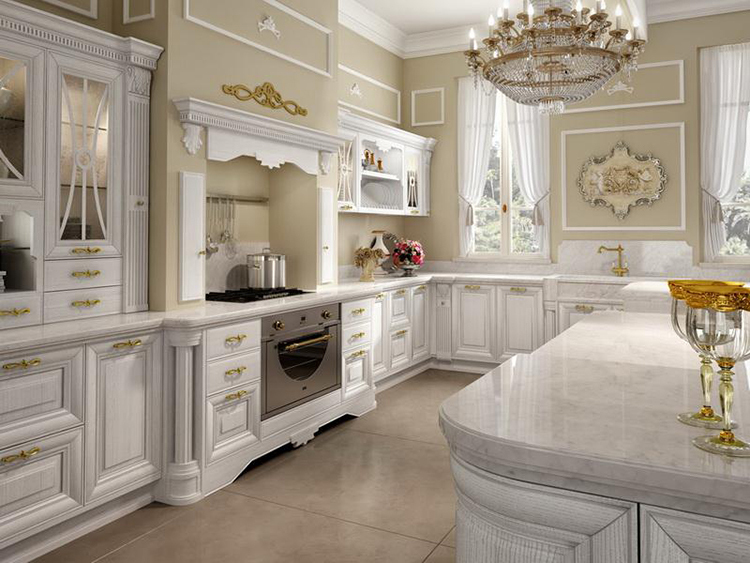 Richly and finely decorated with classical motifs, this sumptuous kitchen is the typical luxury kitchen that in the same time impresses and seduces. The finely inlaid island with its breaking lines and elaborated shapes is a real masterpiece. Functionality is ensured by the practical , spacious countertops in polished black marble. Cosy and elegant, this kitchen has a high level of space optimization that reduces encumbrance and makes it suitable for flats or studios. Its design with clean lines and classical shapes creates a pleasant ambience both for food preparation and everyday life activities. The design of this kitchen takes some elements from Industrial kitchens, like the big hood in steel, the practical stove and the island that looks like a counter. 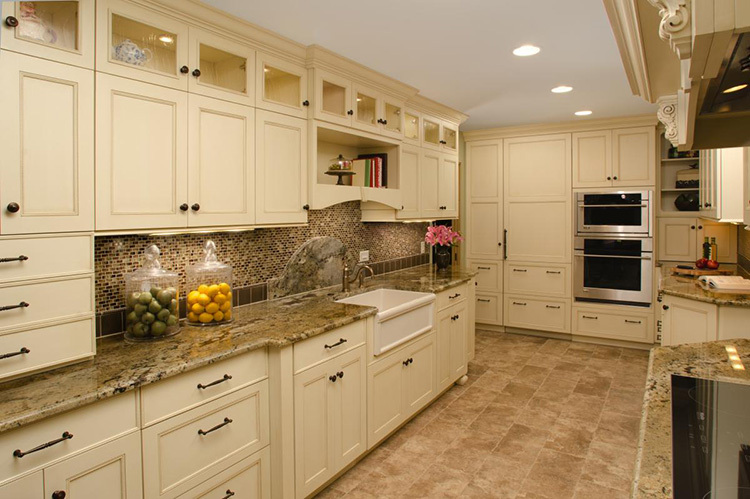 The long row of cabinets ensure all the necessary space, while the counter is large and practical. Perfect for food preparation. 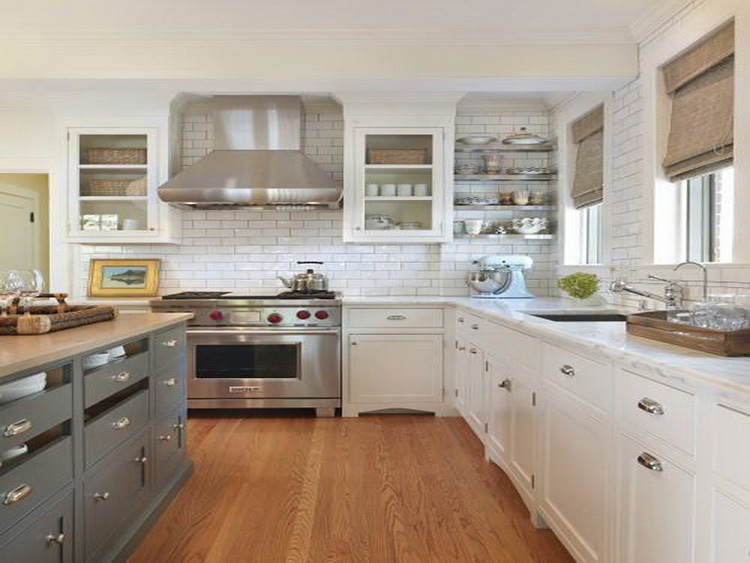 Classically designed, this posh kitchen is both cool and practical. The big stove is placed underneath a nice false mantel finely decorated with wooden motifs, while the large island provides a comfortable working area. 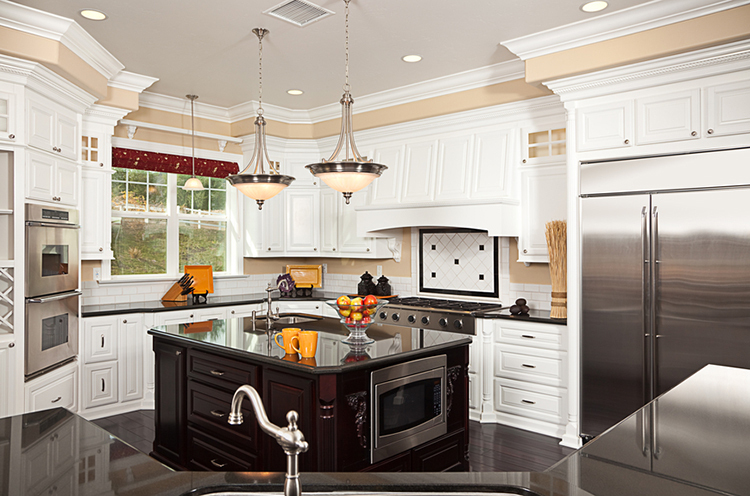 In-drop sinks, spacious cabinets and built-in appliances complete its equipment. Its wise layout leaves as much room as possible for your better comfort. 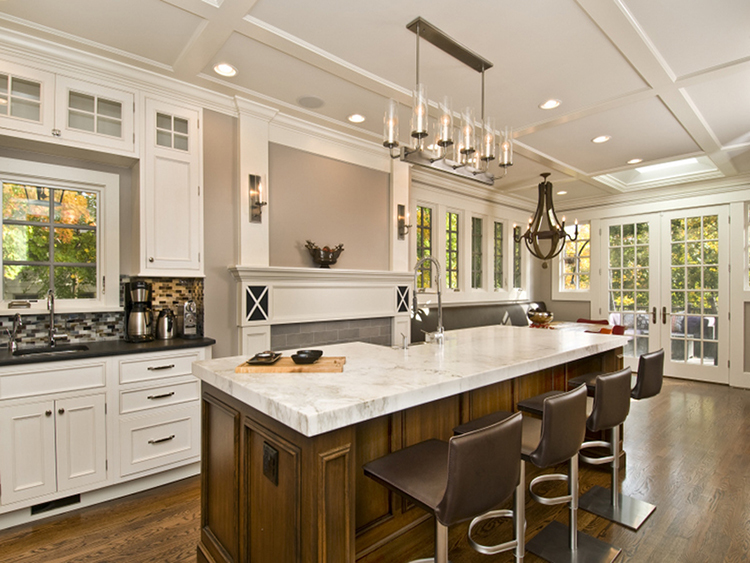 Volumes and spaces are masterly distributed in this cool kitchen that merges cleverly classical and modern elements. 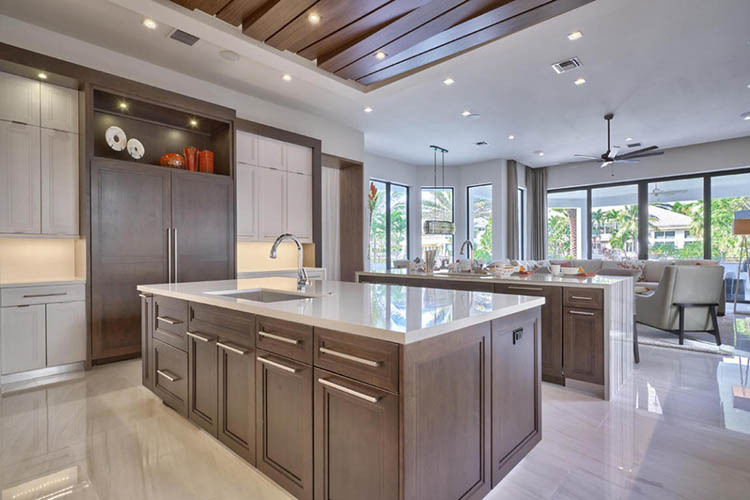 Large counters with in-drop sinks and a big square island with flat panels in steel and built-in ovens provide all the necessary working surface, while supplies are stored in its many spacious cabinets and giant fridge hidden with a false panel. 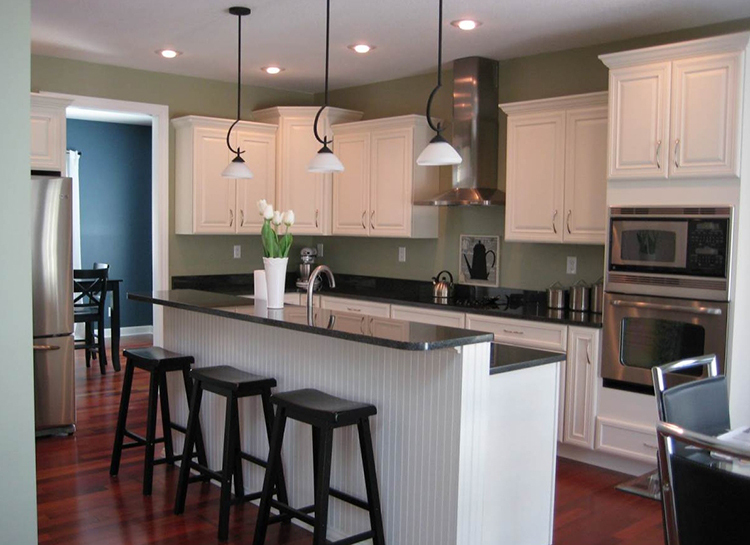 Roomy and bright, this kitchen is also a great place to invite friends and have parties. In this kitchen the working area has been distributed between two islands, one equipped with one hob and the other with two in-drop sinks. 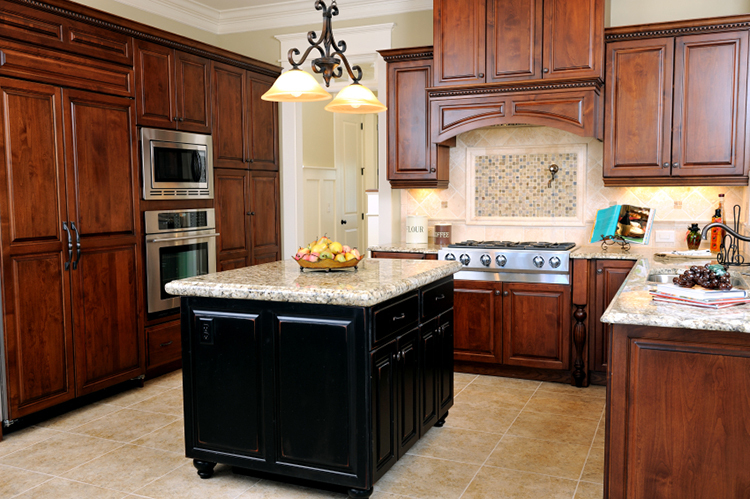 Tools can be stored in the many cabinets placed under the islands or the large counter. The capacious fridge is hidden by a false panel, appliances are in-built. Very convenient design for food preparation. The narrow space of the room is utilized very well in this cool kitchen without island that is suitable for a loft or a flat. The working surface is cleverly distributed on two large and long counters with cabinets, in-drop big sink and in-built stove and appliances. A false panel hides the fridge that is built in the wide cupboard. A great example of space optimization. This design alternates brown and white in order to create a feeling of variation. Spaces and volumes are smartly distributed in order to leave as much room as possible around the nice island that combines the functionalities of a table and a cabinet. 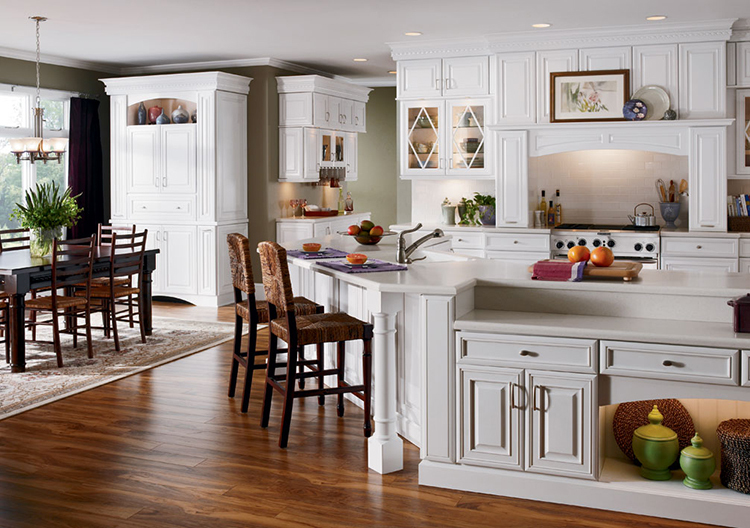 A spacious counter that runs all along the wall provides a comfortably wide working area. Giant fridge, in-built appliances , stove, rectangular in-drop sink, huge cupboard and cabinets underneath the counter complete the furniture of this elegant kitchen. 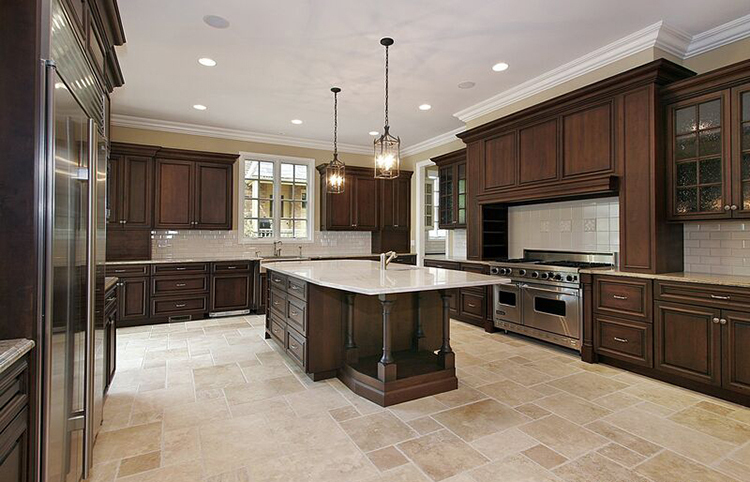 Enjoy meals and snacks with your friend in this luxury kitchen with fine, classical design. 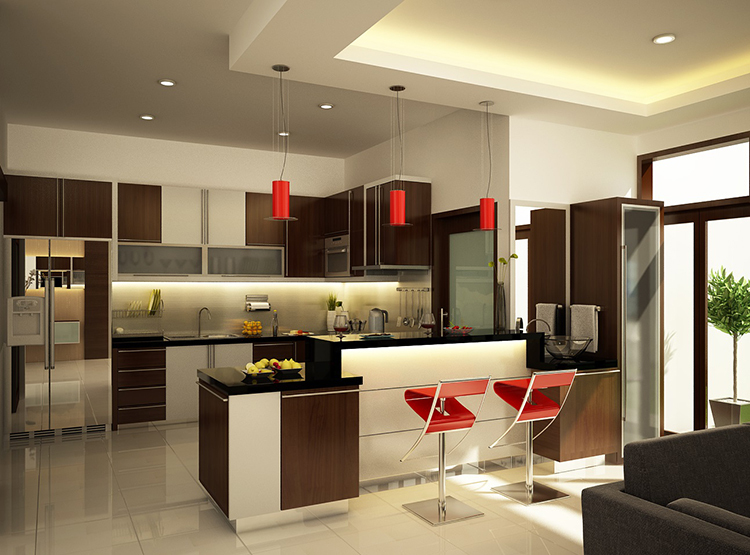 Elegant but cosy, it combines living room and kitchen and makes you feel at ease at first sight. The extra-large stove strategically placed in front of the spacious island makes preparing and serving food to guests very practical. Cosy and bright, this kitchen is a great solution for families. Its essential lines and its simple but effective layout create a space with a warm ambience where it is nice to stay. Gather the people you really love around the elegant walnut table with countertop in marble and classically designed chairs. 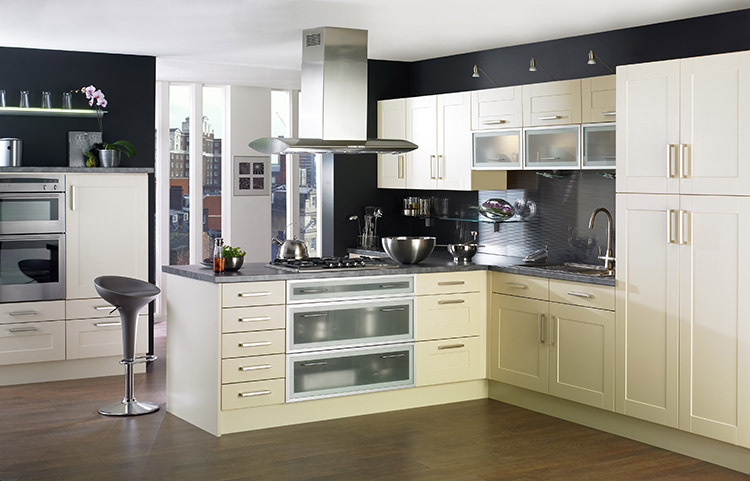 A real luxury kitchen that will impress your guests favourably. Elegant, essential lines and wise distribution of volumes create a sophisticated environment that is both cosy and posh. Practicality is ensured by the long row of cabinets, the cupboard with in-built fridge and appliances, the spacious island with in-drop sink, and the large stove. This kitchen gives evidence that luxury kitchens are also for narrow environments. Its design wisely alternates white areas with light blue/turquoise areas and volumes of different shapes and sizes in order to create a feeling of variation. Space is masterfully optimized in order to leave as much room as possible without decrease the practicality. Very beautiful and practical the wide and long in-drop sink in stainless steel. Luxury does not mean affectation. Elegant but not pretentious, this kitchen provides you with a nice environment where to spend time with your friends and family. A high level of comfort is ensured by the big fridge with iron flat panel, the two level island countertop with in-drop sin, and the strategically layout where everything you need is kept at hand. 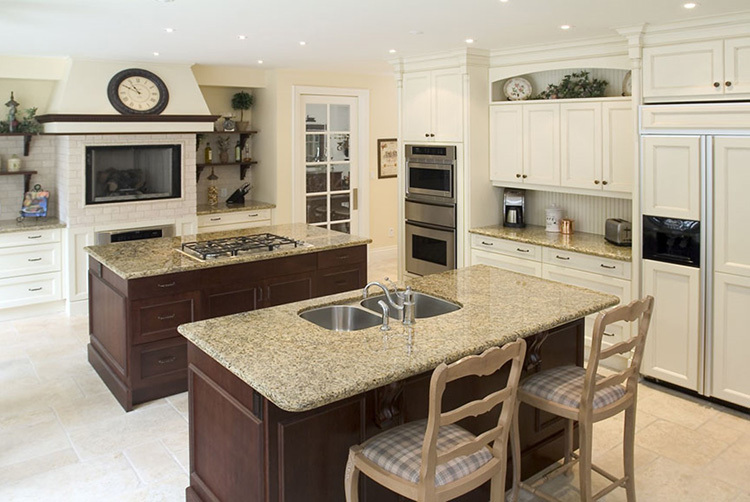 Bright and roomy, this luxury kitchen is suitable for cottages, villas and mansions. A design based on fine decorations and cream colours create a warm ambience where it is nice to stay, no matter whether you have guests or need just to spend some time by yourself. 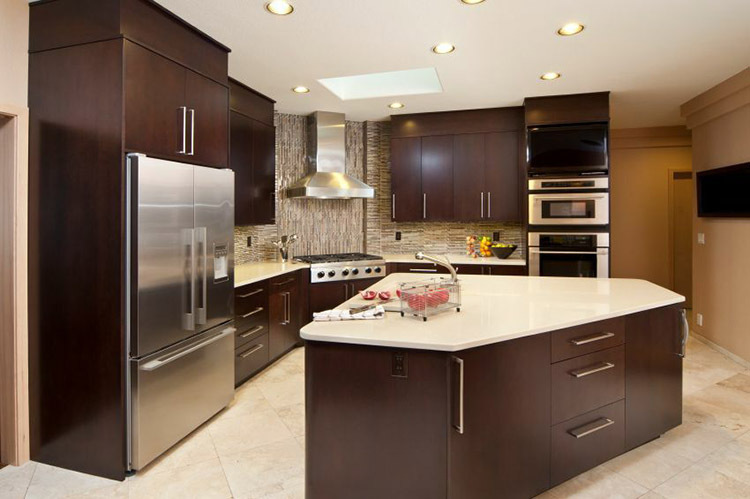 Functionality and luxury are smartly combined in the design of this roomy kitchen that is both elegant and practical. 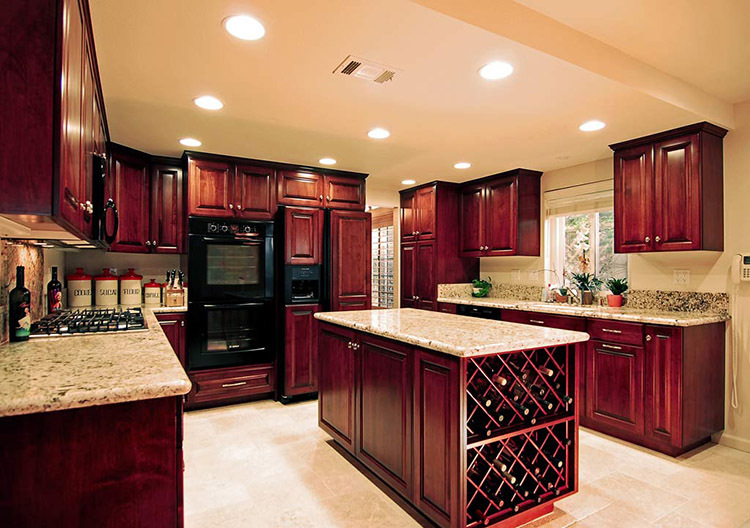 A giant stove and two large island equipped with cabinets, in-drop sinks, wine racks, in-built appliances provide all the necessary to comfortably cook. Friends wait in the dining area that is not shown in the photo. A classical simplicity is the leading motif of this luxury kitchen that is great both for food preparation and meetings with friends. Two wall cupboards, a big and capacious fridge with stainless steel panels, and several cabinets provide all the room you need. Enough working surface is ensured by two wide counters. Hob, ovens and appliances are all in-built. 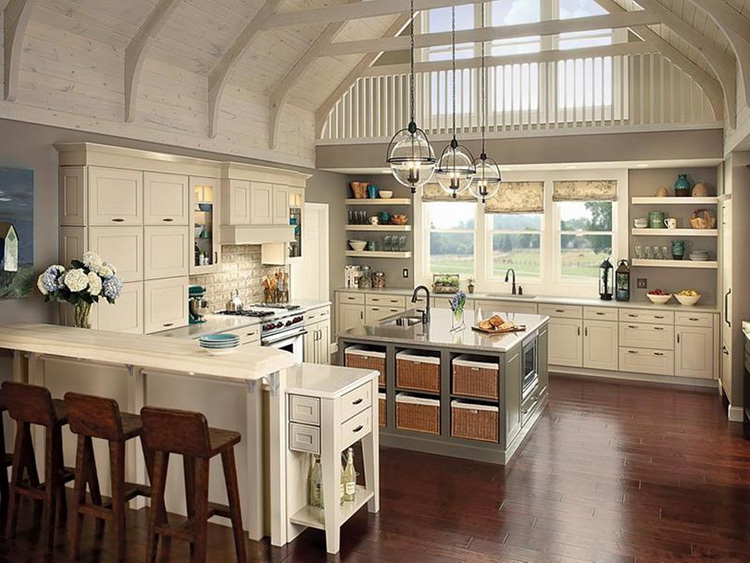 A kitchen with a nice layout that is fitting for buildings with wide rooms or villas. The design is light and based on linear elements and simple shapes. The spacious island can be utilized either as table or additional working surface. Two hobs create a wide cooking area that ensure a good level of comfort during food preparation. 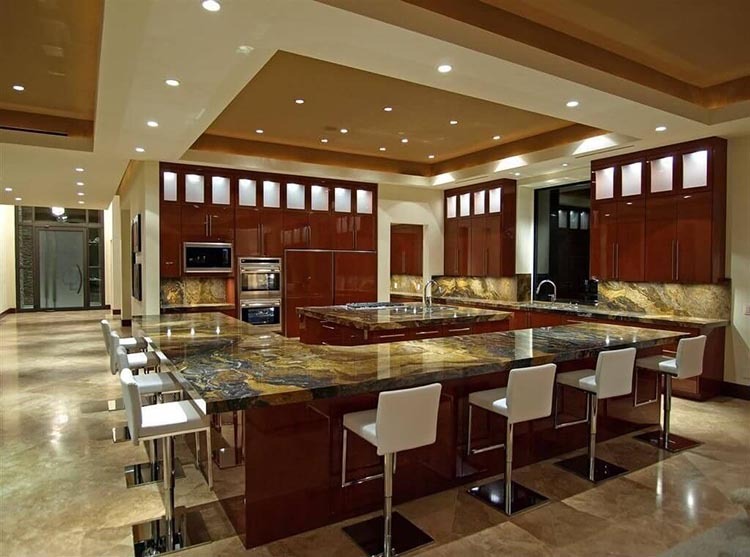 A really luxury kitchen that makes you feel like a king while preparing food. A giant island fully equipped with cabinets, in-built appliances, in-drop sinkers, thick countertop in marble, and hobs gives you all the working space you wish. The big oven corner is worthy of an industrial kitchen, while an additional cooking area is provided by a large stove set in the background. Capacious wall cupboards and a big fridge completes the abundant equipment of this posh kitchen where it is possible to cook almost everything. 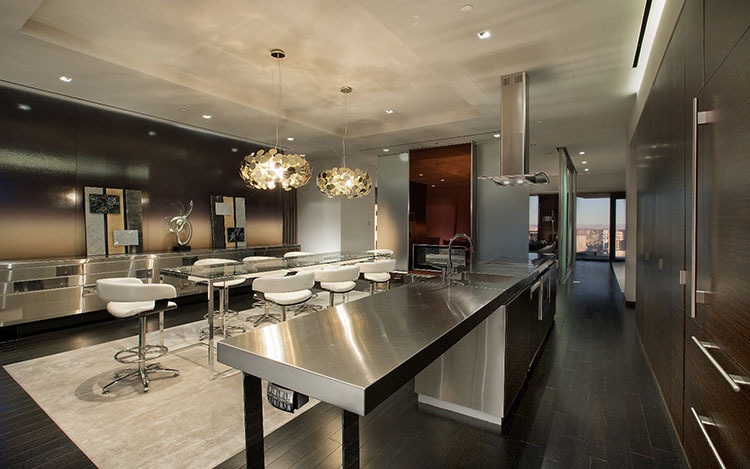 Elegance triumphs in this luxury kitchen with avant-garde, minimalistic design. The linear simplicity of its clean lines and shapes creates a sophisticated environment where it is nice to stay, while its functional layout ensures a high level of comfort. A place where to live more than prepare food. 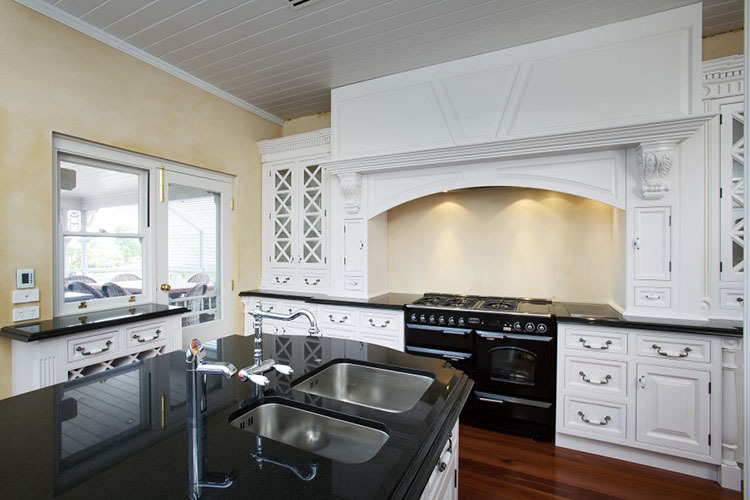 The beautiful V –shaped island equipped with in-built hob, cabinets and in-drop sink is a real masterpiece. 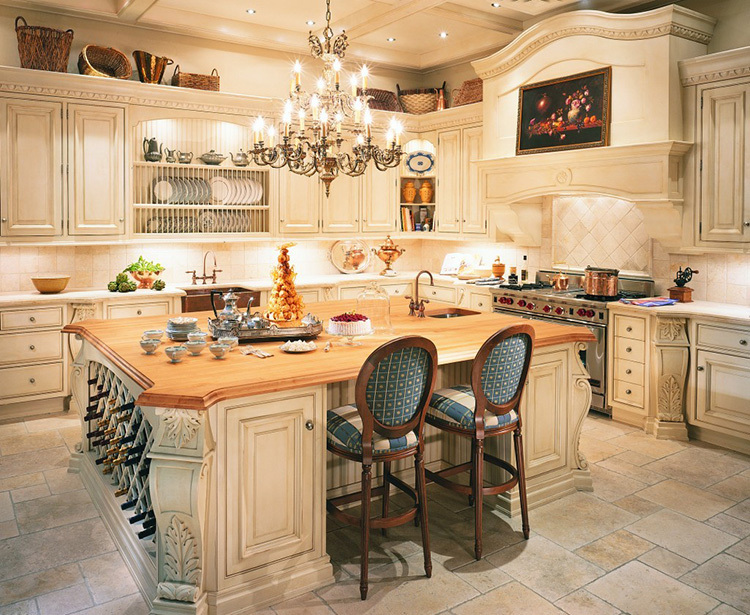 A classical design for a classical luxury kitchen. The elegant island is finely decorated with wooden motifs that are partially repeated on cupboards and cabinets. Large counter, big fridge with stainless flat panel, two wide in-built ovens, spacious cupboards and in-built stove ensures all the necessary for food preparation. 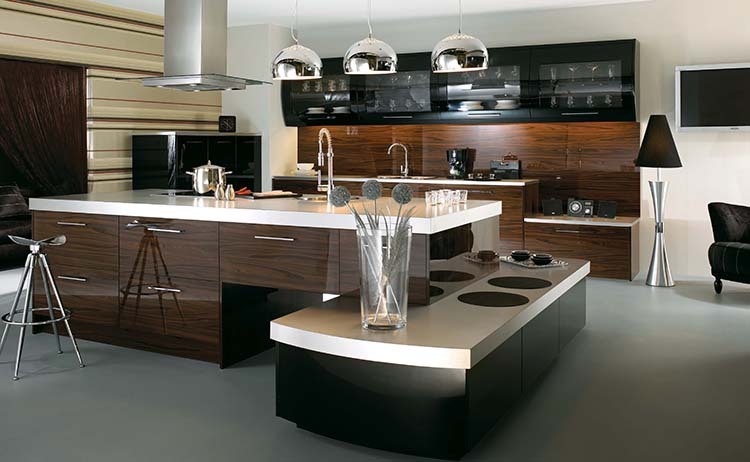 Luxury kitchens are not necessarily posh environments designed only to impress people. 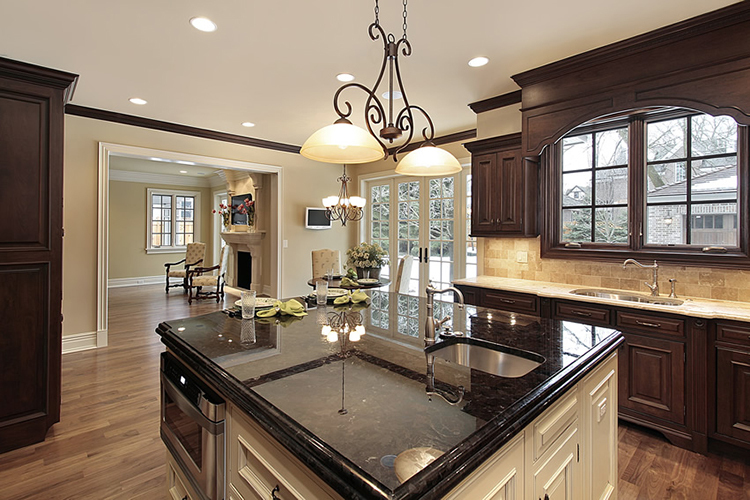 This elegant kitchen is an example of how a luxurious environment can be warm and cosy. Noticeable the false mantel with long arch over the stove that reminds the past and creates a welcoming ambience where it is nice to have meals with family and friends. Being naturally warm and elegant, wood is a great material for luxury furniture in general and luxury kitchens in particular. In this first example, the dark walnut wooden panels harmonize very well with the flat stainless panels of the fridge and the appliances and create an environment that is both practical and posh. Tradition is at the centre of the design of this combined space that is both kitchen and studio. The cooking area is composed of a big fridge, two in-built ovens, a large stove placed into a false fireplace with nice arch-shaped mantel, spacious square island with cabinets and shelves. A small desk allows you to work. 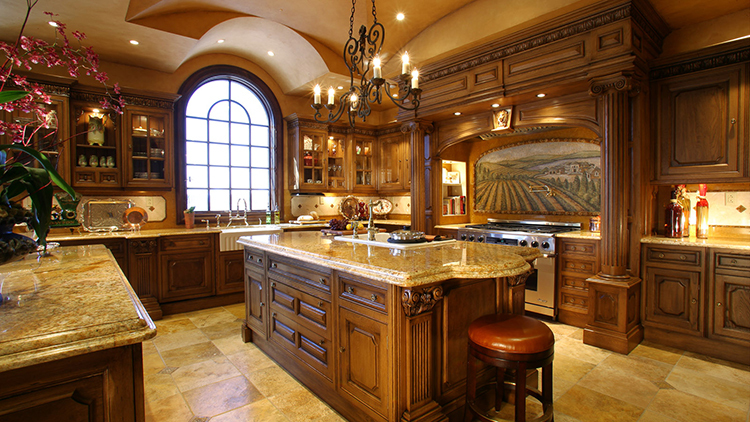 This is a real luxury kitchen. Every detail is thought in order to impress guests and convey a feeling of majesty. Roomy and spacious, this kitchen is also practical for food preparation thanks to its large counter with in-drop sink and the several in-built appliances. The large and wide island with cabinets provides an excellent dining surface, while two giant fridge are smartly hidden with wooden panels. 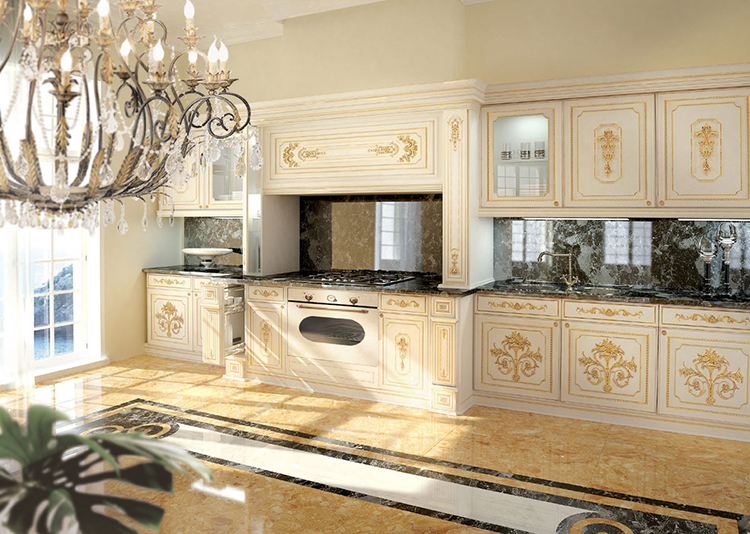 A classical and beautiful design for this luxury kitchen that is suitable for a mansion or a villa. The big false mantel finely inlaid and decorated creates a natural sense of elegance, while the layout of the cabinets all around the wall conveys a sense of order and cleanness through the repetition of the same geometric pattern. Classical and modern elements are pleasantly combined in this nice kitchen where the utilization of walnut panels creates a feeling of warmth and cosiness that makes people feel naturally comfortable. Among luxury kitchens, this is probably one of the most suitable kitchens for the activities of everyday life and for family life. Luxurious does not necessarily mean far from everyday life, and, among luxury kitchens, this one is an outstanding example of that assumption. Its layout exploits smartly spaces and volumes in order to create a roomy, airy environment where it is nice to live. The L-shape counter with in-drop big sink is beautiful and practical, while the small table is excellent to have meals with your partner. 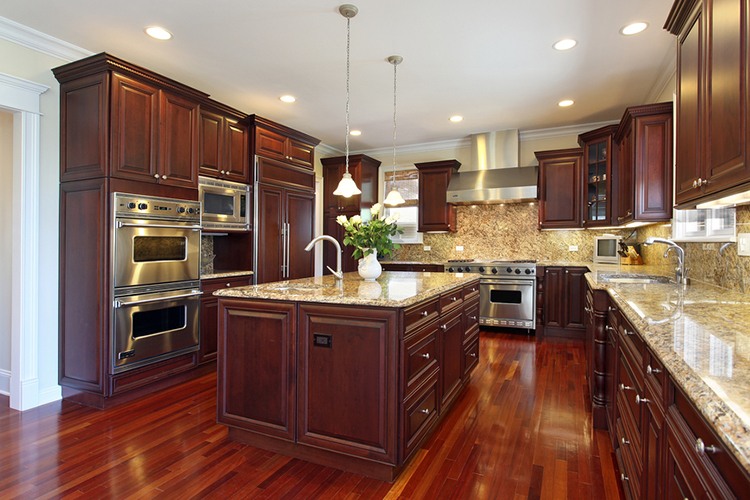 Wood can really make any kitchen a luxury kitchen. 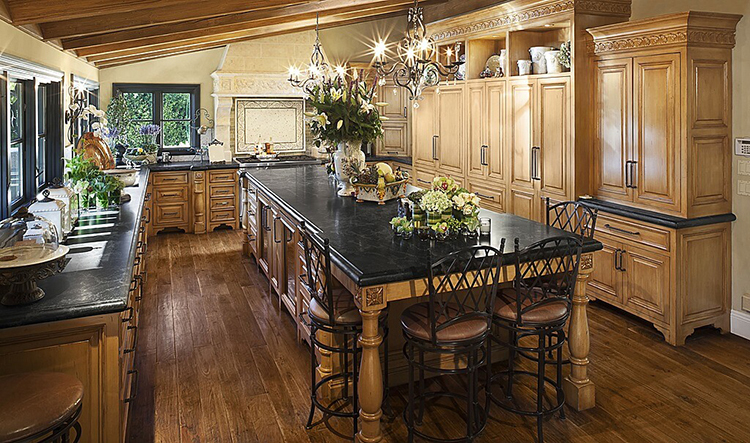 Rich inlays and decorations, sophisticated wooden panels, even an Italian renaissance styled painting that is strategically set over the big, spacious stove makes this kitchen voluptuously luxurious and as much posh as possible, yet practical and comfortable. 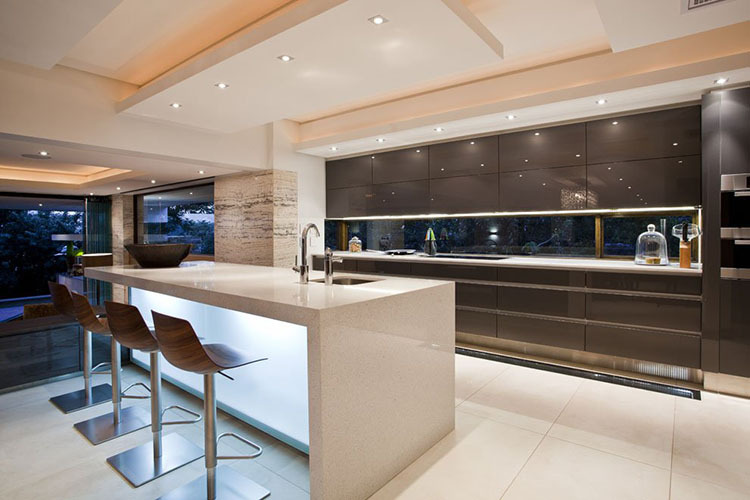 Another luxury kitchen with a design that skilfully combines practicality with elegance. 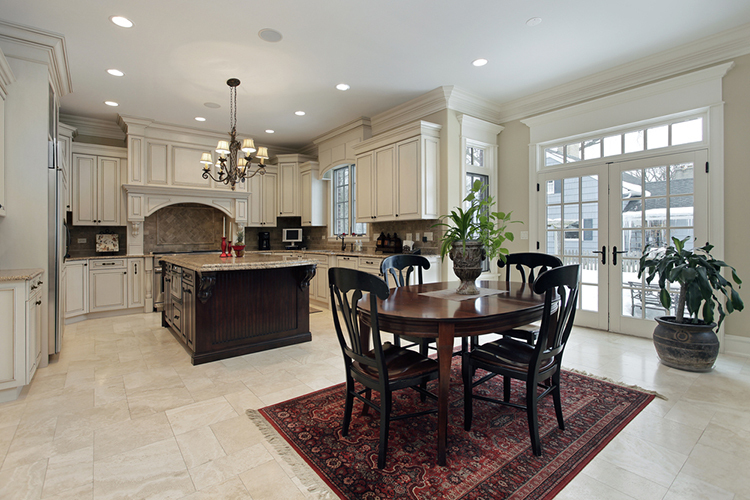 The layout is simple but powerful, as a large room is left in the mid like in the traditional kitchen. White tiles, a giant fridge, a wide counter with a comfortable in-drop sink and a big in-built stove, spacious cabinets and cupboards provide all the necessary comfort to make food preparation a very pleasant experience. 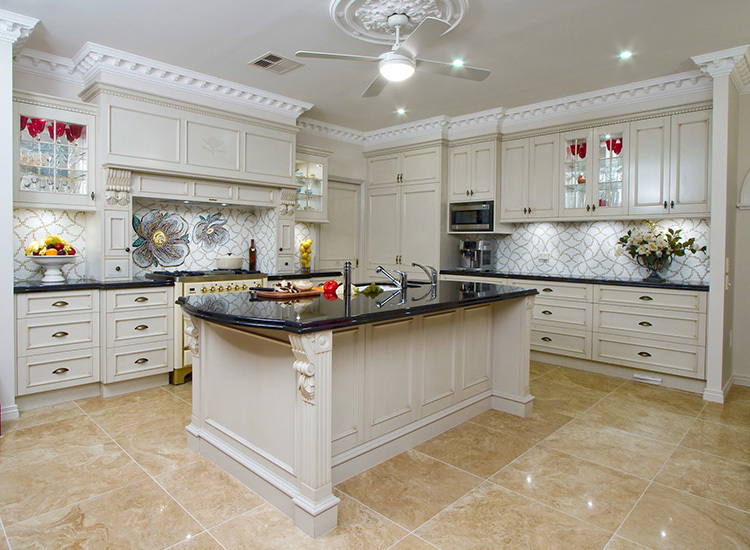 Set in a villa, this luxury kitchen is the top in terms of elegance and comfort. The big stove is placed underneath a classically decorated mantel that conveys a sense of cosiness and warmth. 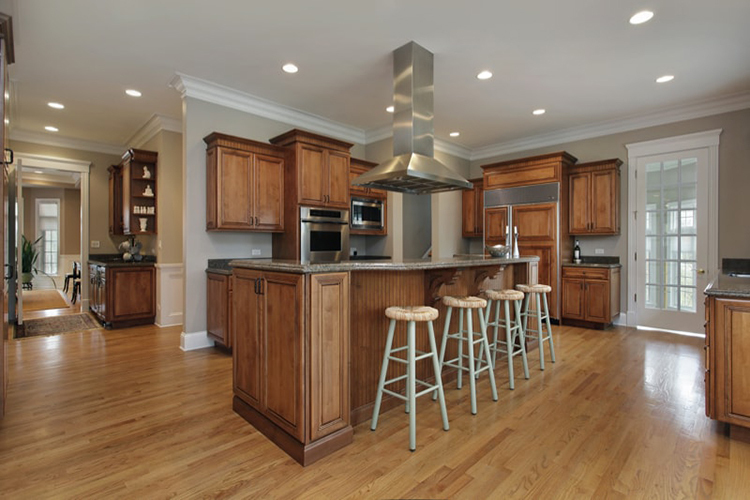 The capacious dark walnut cupboards and cabinets provide all the necessary space to store supplies and tools, while the posh large island in the mid can be utilized as both working surface and table. 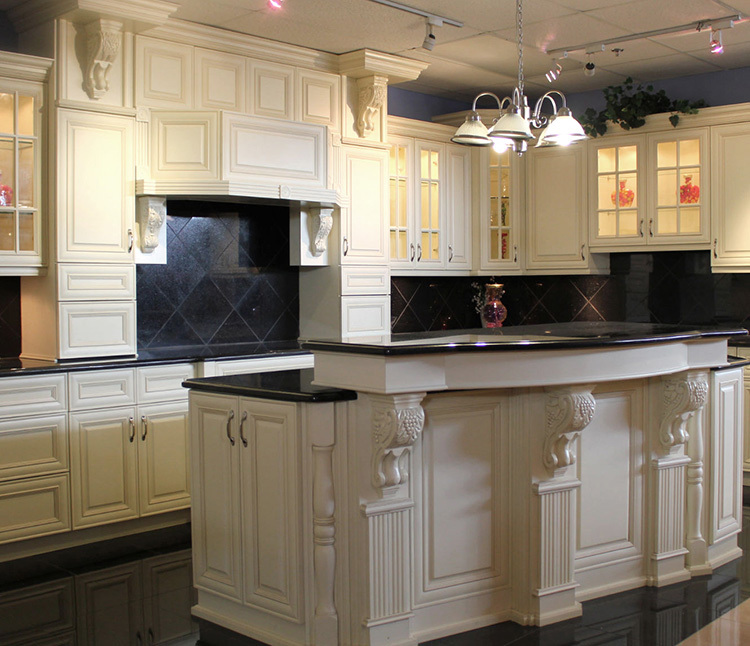 Luxury kitchens must have personality. The contrast between the white of the island and the walnut colour of the rest of the furniture creates a sense of variety, while the beautiful ceiling with wooden beams makes this kitchen precious and evocative of the past. Practicality is ensured by spacious surfaces and capacious cabinets. 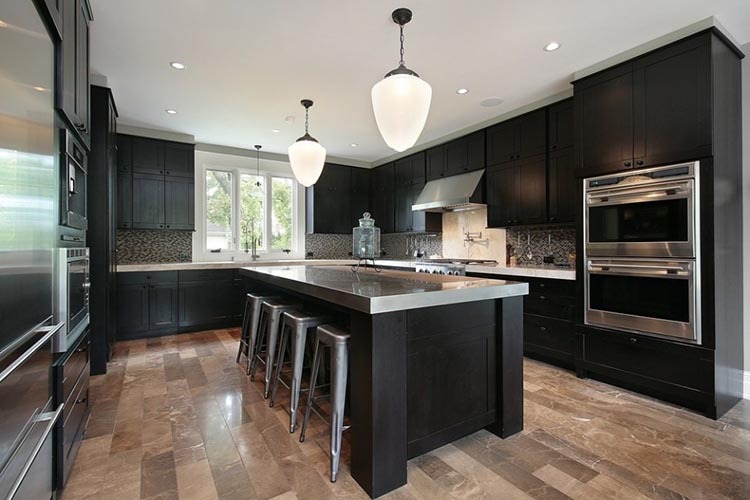 This luxury kitchen is a great place for having parties and snacks with friends. The warmth of wooden panels creates a welcoming ambience, while a clever layout puts all the necessary for food preparation at hands. Fully equipped with in-drop big sink, large counters, big stove, in-built appliances that ensure the best in terms of comfort. The original design of the false fireplace made of tiny tiles gives personality to this modern luxury kitchen. The big industrial stove and the two large islands with practical cabinets and wine racks provide all the necessary working surfaces for food preparation, while supplies can be easily stored in the giant fridge and capacious cupboards. 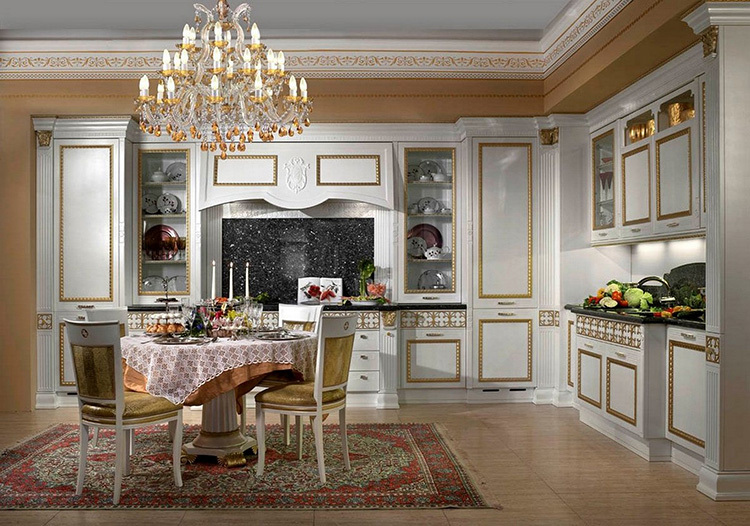 This is the classical luxury kitchen with luxurious, comfortable chairs, small round table in crystal, inlaid tools, walnut wooden panels with classical motifs and decorations. The spacious layout creates a nice-to-stay environment that is particularly fitting for receiving guests. Notice the beautiful false mantel over the large stove. 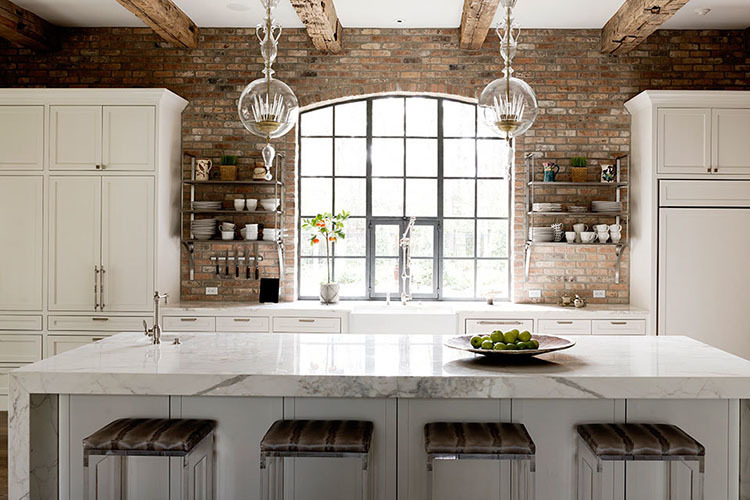 In this luxury kitchen, elements taken from industrial kitchens (noticeably the big hood, the in-built ovens, and the stainless stove) are wisely combined with classical wooden furniture (cupboards, cabinets and island) in order to create an environment that is both elegant and practical. The fridge is hidden with wooden panels that repeat the same motifs of the decorations of the cabinets. 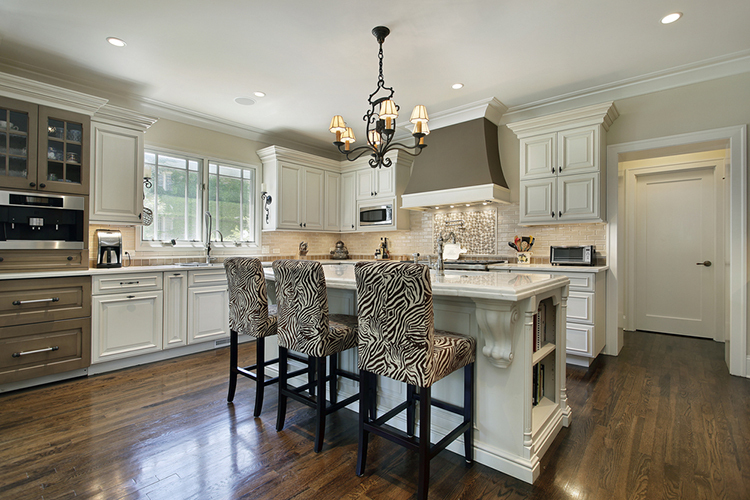 A luxury kitchen with strong personality and charm. The L-shaped island is both multifunctional and practical, while the powerful industrial stove and the giant fridge with flat panels in iron ensures the best of comfort during food preparation. 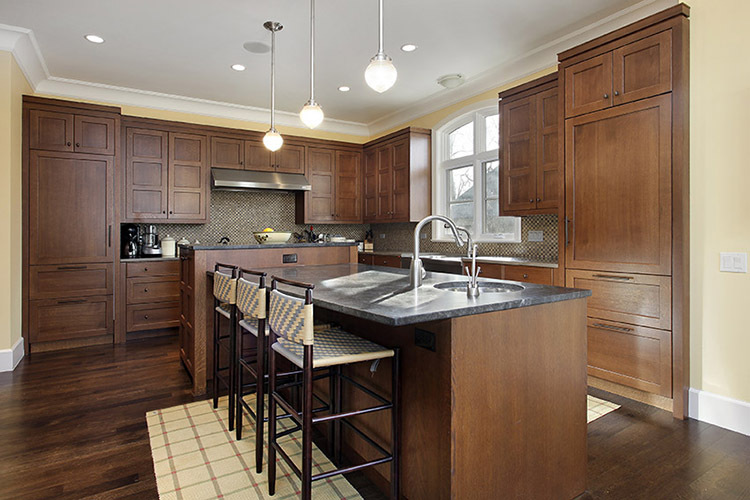 Warm and roomy, this kitchen is the right place to gather friends for a snack or some drinks. 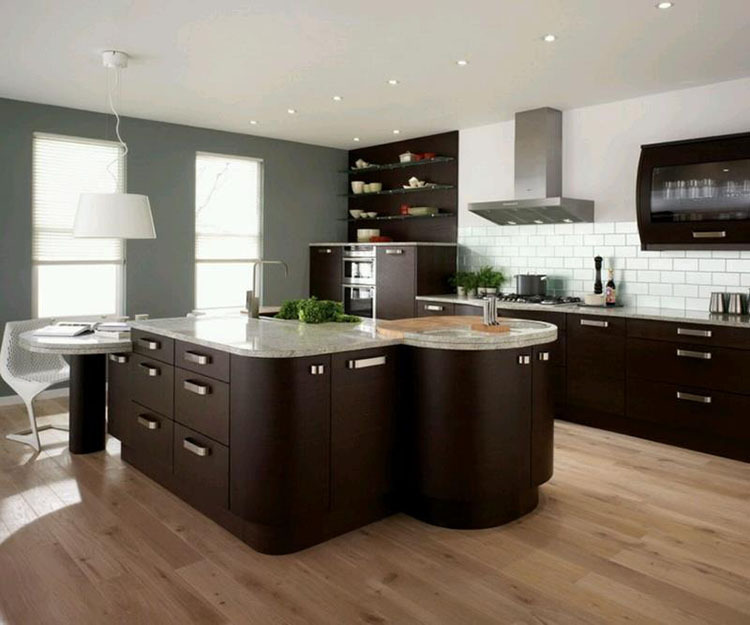 Elegance triumphs in this really luxury kitchen where light and dark walnut areas are alternated in order to create a pleasant sense of variety. Great for combined solutions that merge living room and kitchen in one space, this kitchen is the right place to receive guests. Noticeable the big wall cupboard with in-built fridge and appliances that gives an excellent example of space optimization. 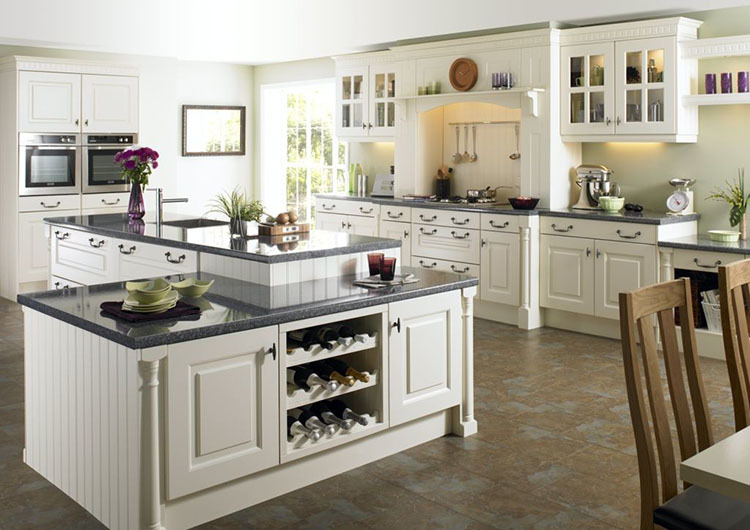 Posh and cosy, this kitchen combines luxury with comfort smartly. Light walnut panels with simple decorations create an airy and bright ambience. 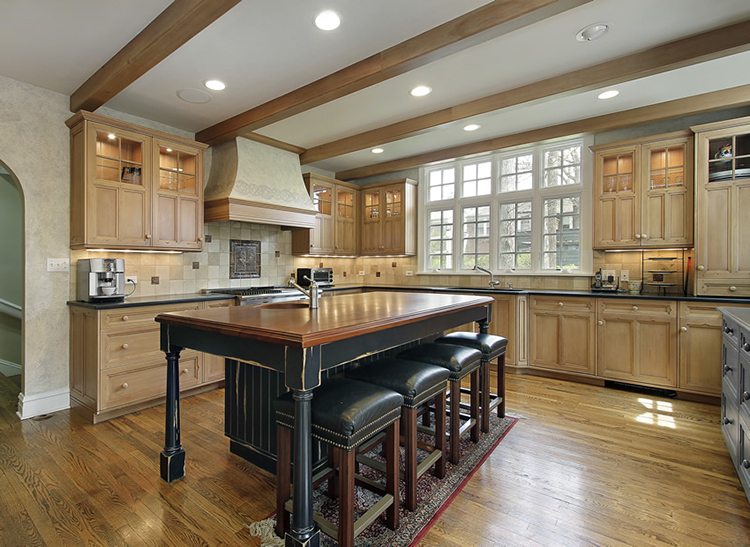 The island with tools and sink works both as additional working surface and table, while the big stove underneath the nice false mantel is just at hand for food preparation. 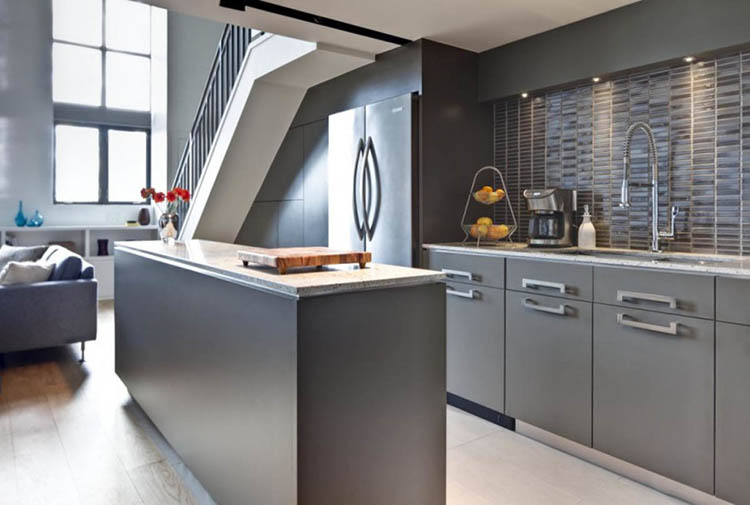 A great example of how luxury kitchens can stay even in narrow spaces. A large, practical counter that runs all along the wall creates a very practical working surface, while some spacious cupboards and cabinets provide a storing space with huge capacity. A big stove, in-drop sinks and a giant fridge hidden with wooden panels complete the rich equipment of this small but powerful kitchen. 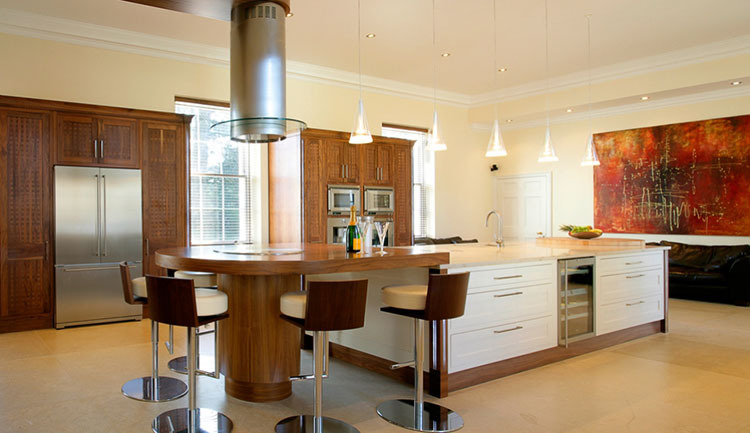 The elegant semi-circular arch over the hob and the smart alternation of light and dark walnut areas create a pleasant effect of variety in this posh, luxury kitchen that will definitely impress guests and friends with its sophisticated but discreet charm. 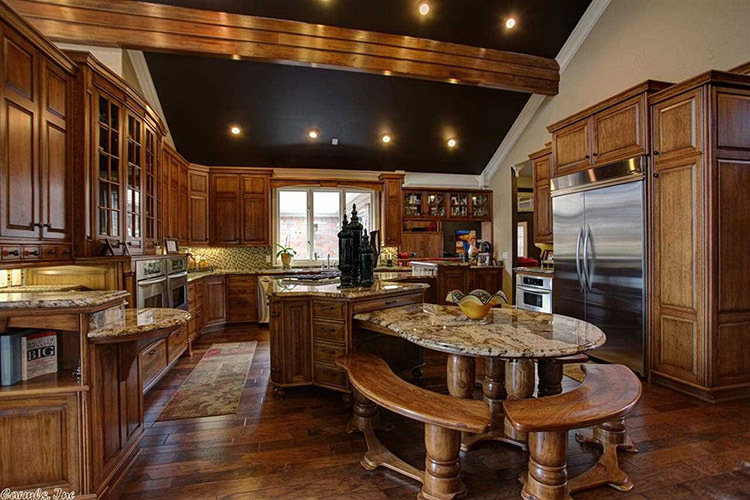 A large and fully equipped island will provide the necessary surface for food preparation. The most outstanding component of this luxury kitchen is its posh island fully equipped with in-built oven, cabinets, and sink. Countertop is in polished dark marble that pleasantly contrasts with the white top of the counter. The right place where gather friends for having snacks or drinking something. Luxury kitchens and family life are often a good combination, as this smart kitchen shows clearly. A spacious fridge with flat metal panels and a powerful stove with two ovens are cleverly combined with classically-styled wooden cabinets in order to create an environment both beautiful and practical. At the centre, a wide table allows you to gather your family and have meals together. 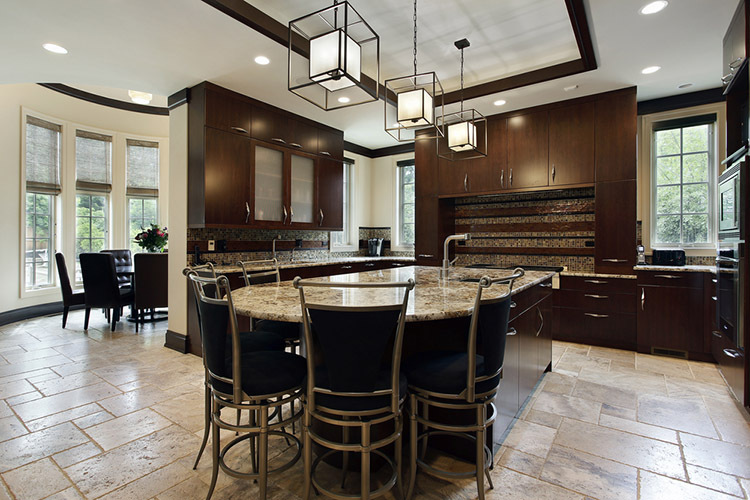 Luxury kitchens can be designed for both family and social life. A corner of this very functional kitchen has been furnished with two pub style benches in order to provide an area where guests can sit down and relax. For food preparation, there is the big industrial stove with spacious fridge immediately at hand on the side and the wide island with in-drop sink. 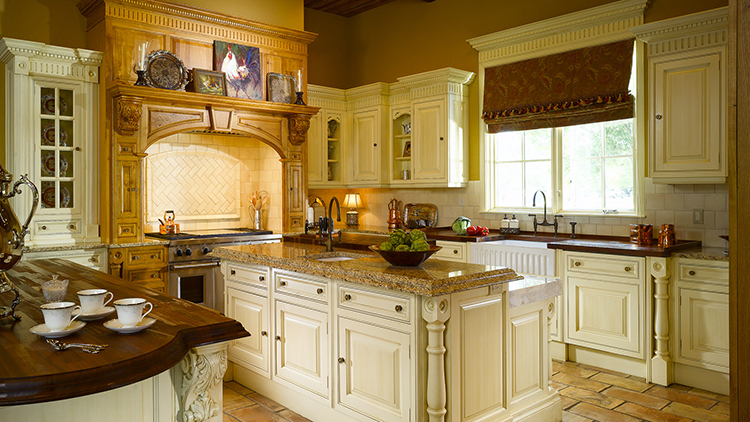 The richly inlaid and decorated wooden cap over the island gives a touch of originality to this luxury kitchen. The hob placed on the island allows you to prepare food standing right in front of your friends. Everything is at hand thanks to the capacious cabinets placed underneath the large counter right behind. The irregular arrangement of the wall cabinets and cupboards create an pleasant visual effect of variety in this luxury kitchen. The large pub style island equipped with hob, in-drop sink and hood allows you to cook standing just in front of your friends. Ovens and appliances are conveniently placed right behind. 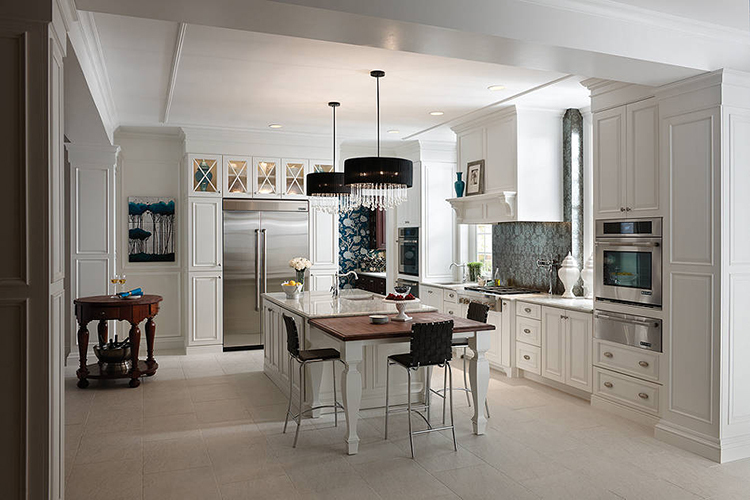 This luxury kitchen shows a classical layout with large island with in-drop sinks placed in the middle and wide counter with hob, in-built appliances and cabinets behind. 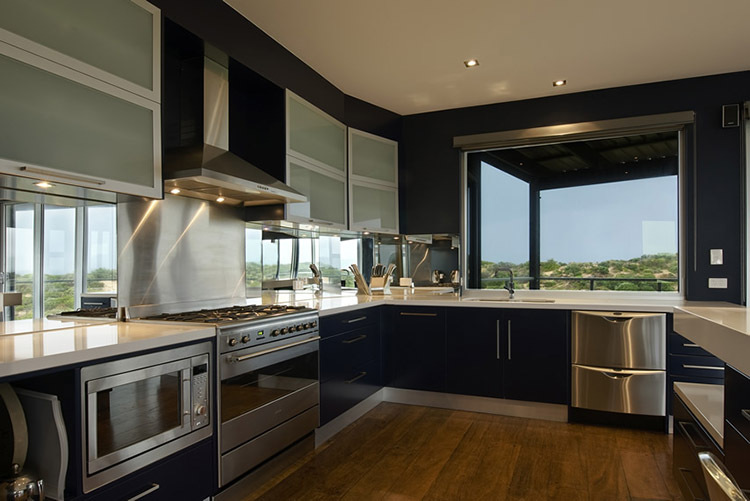 The huge mirror adds an element of originality to the composition and reflects the giant fridge and the in-built ovens placed on the opposite side of the room. This is the classical luxury kitchen furnished with richly decorated and inlaid wooden cabinets, cupboards and a false fireplace with mantel in white stone where the stove has been conveniently placed. The layout has its focus on the long, big island in the mid that provides a very wide working surface. The spaces of this villa are masterfully exploited to create a combined room with living area on the right and kitchen on the left. The composition has its focus on the nice false mantel in white stone over the stove. The fridge is hidden with wooden panels, while several cabinets provide all the necessary space where to store tools and supplies. 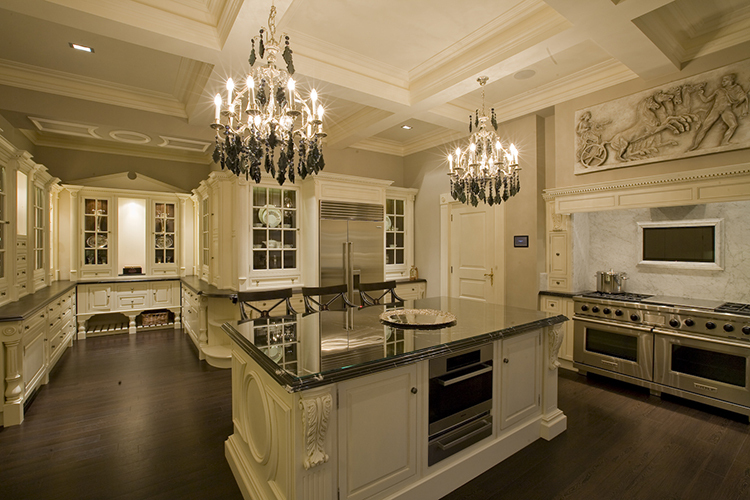 Luxury kitchens are often intended to impress guests, and this example perfectly respects the rule. Wide island with cabinets with panels in refined wood and top quality design chairs, enormous in-drop sink, walls covered with fine tiles, fridge hidden with wooden panels and a rich abundancy of in-built appliances create an effect of both majesty and beauty. In this luxury kitchen a high level of functionality is ensured by a big fridge, two big ovens, a large counter with comfortable in-drop sink and the wide, irregularly shaped island with cabinets where a huge hob has been placed. Meals are consumed on the posh, richly decorated table on the right. 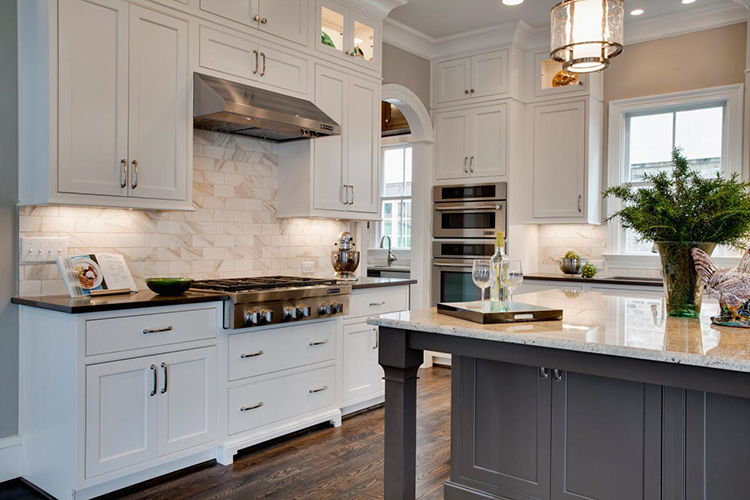 The wide white cap over the large cooking area adds a touch of original elegance to this luxurious kitchen with classical lines and shapes. The essential design of furniture combined with its practical layout creates a space that is very fitting for food preparation. 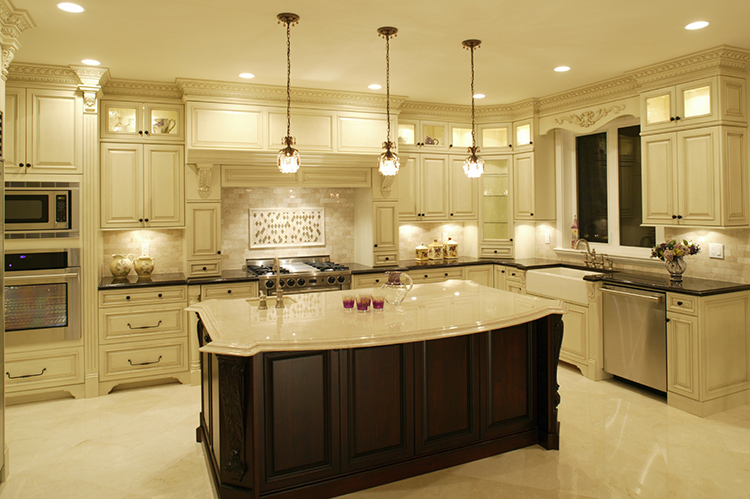 The design of this luxury kitchen certainly deserves a special mention. Classical and innovative elements are smartly combined and harmonized in order to create a space that is both elegant and practical, while all the necessary working surface is provided by the spacious island fully equipped with in-drop sink, hob and cabinets with panels in refined wood. 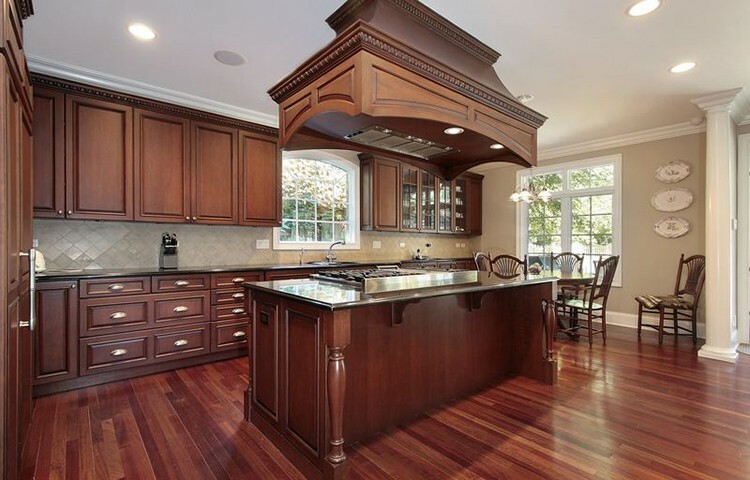 Cherry wood panels conveys a feeling of both warmth and luxury in this kitchen. The irregular, asymmetric arrangement of the cabinets create a pleasant sense of variety, while a high level of functionality is ensured by the two big in-built ovens, the spacious counters and the practical island with big wine racks. A sense of cosiness and intimacy pervades you while watching this luxury kitchen furnished with classically styled panels in refined wood and practical in-built industrial appliances. The big fridge, the stove and the two in-built ovens ensure all the comfort you need to prepare food, while the irregularly shaped island provides a nice corner where to have meals with friends. In this multi-purpose space, the cooking area is fully equipped with large island with electric hob, spacious cabinets, giant fridge, big in-built ovens, cupboards and in-drop sink. The living area on the background and the dining area on the right provide guests with all the necessary comforts. 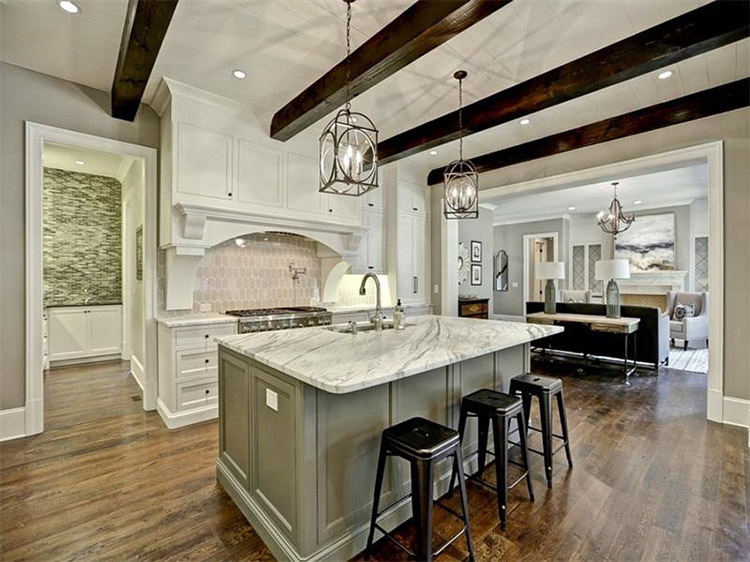 Two large islands provide enough surface both for working and having meals in this luxury kitchen, while the big industrial stove surmounted by a mantel-shaped cap is both practical and beautiful. Nice decorations in stone creates a warm ambience where it is nice to party and have meals with friends and relatives. 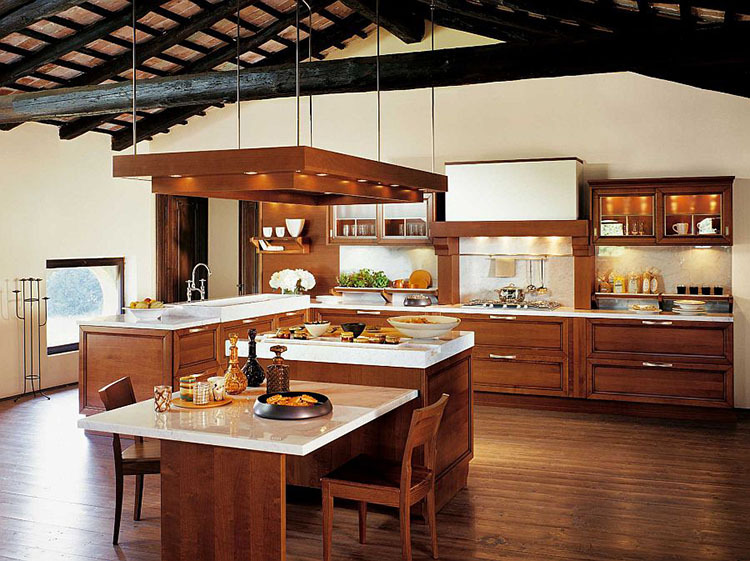 The idea of luxury kitchen is often associated with a richly furnished roomy space, like in the example above. Several cupboards and cabinets that are strategically placed here and there conveys a sense of opulence, while the two islands immediately attracts the observer’s attention with their posh majesty. Panels are in refined wood. 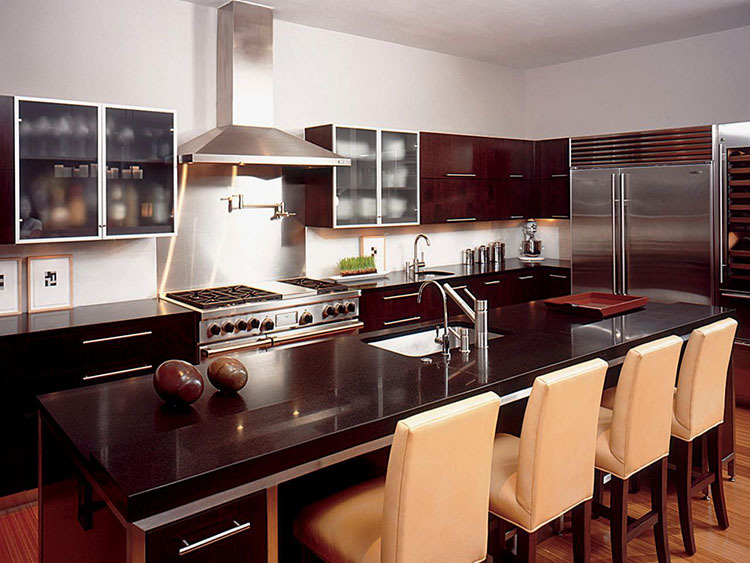 The utilization of dark walnut panels gives an air of seriousness to this luxury kitchen that will certainly impress guests with its majesty. The large island is thought to be utilized as a dining surface, while the practical wide counter with in-built sink and hob provides a good working surface. The fridge and the ovens are in-built in the spacious cupboard on the left. The unusual layout of this luxury kitchen exploits space smartly and creates an ambience that is both sober and elegant. The cupboard placed on the wide island gives a sense of pleasant variety, while fridge, cabinets and in-built appliances are confined in the spacious corner on the background. In this luxury kitchen, light walnut panels and decorations with ethnic motifs are utilised wisely in order to create an environment that is cool and welcoming. 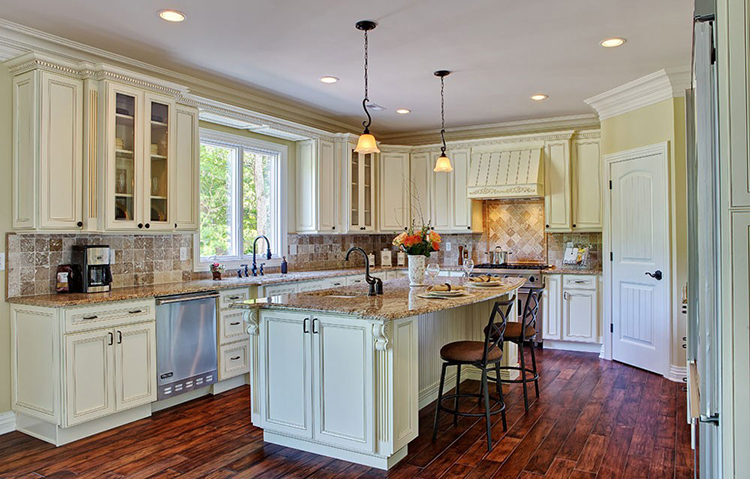 The working area is confined to the big stove and the long counter with in-built sinks and appliances. A pub style bench with elegant round table provides a comfortable corner where to stay with friends. 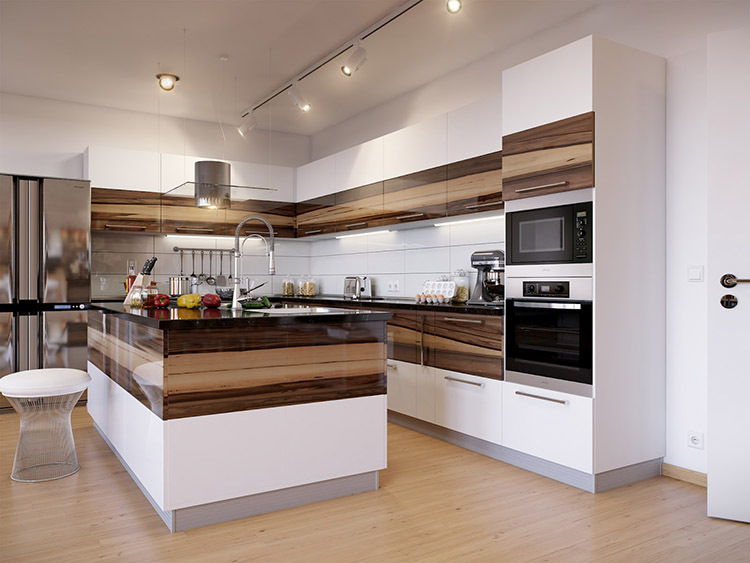 Wooden panels are a good choice for luxury kitchens because of their natural warmth and elegance, like in the example above. The square island adds additional surface to the counter, while the cooking area is provided by a practical big hob and two ovens. The large and spacious wall cupboard with in-built fridge ensures space in abundance. 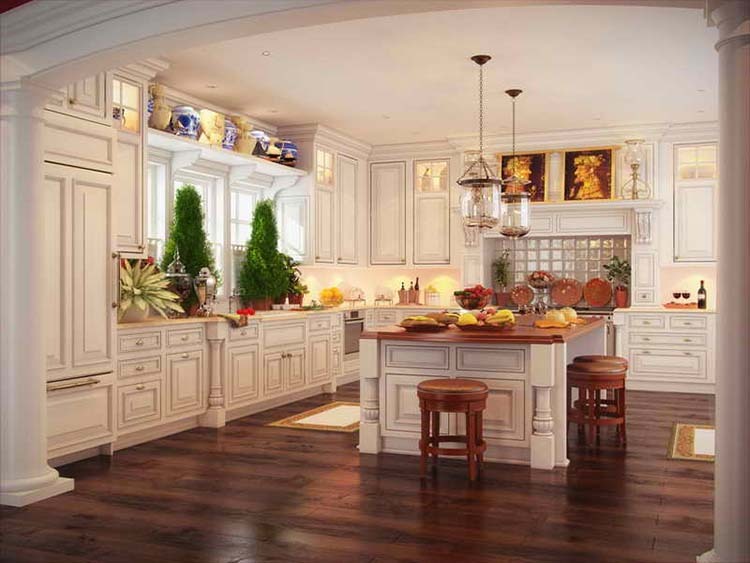 A classical simplicity is at the base of this luxury kitchen design. Fridge, stove and hood are in-built in a huge wall cupboard, like a long counter with cabinets and a spacious in-drop sink provides a quite good working surface. Guests sit down at the large island in the middle. 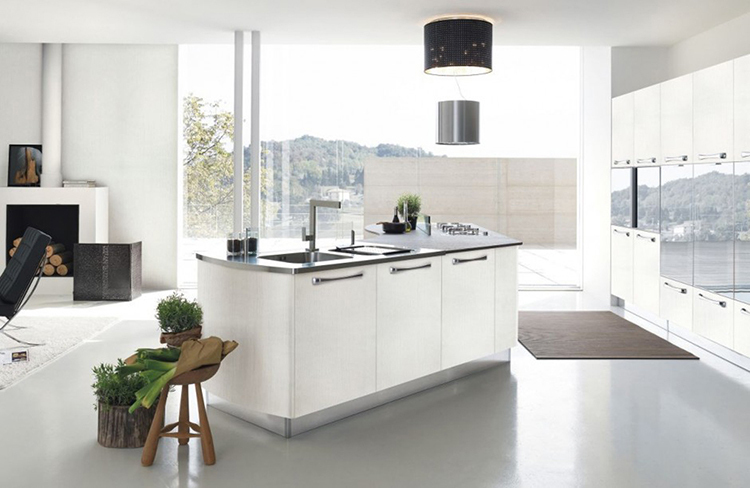 The utilization of flat panels in refined wood for cabinets and tiny tiles for the decoration of the wall combined with the linear simplicity of the appliances in stainless gives to this luxury kitchen a special charm. 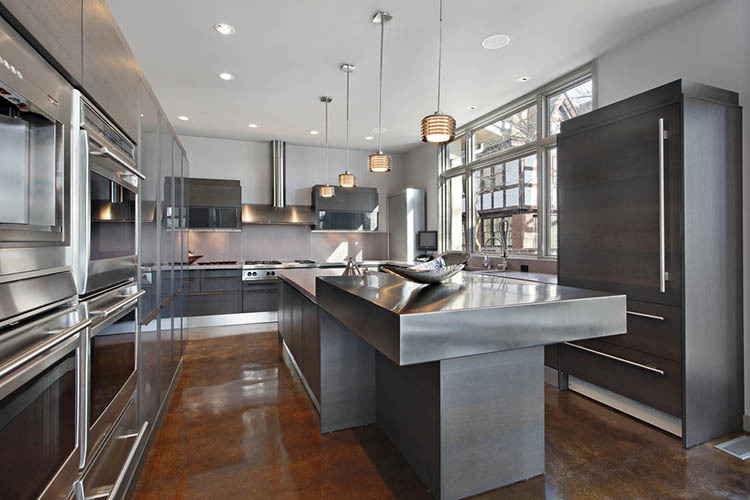 Notice the fine triangular island with in-drop sink that adds additional working surface. 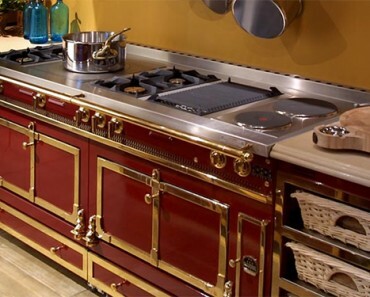 A classical luxury kitchen design with a cooking area composed of false mantel with in-built hood and big and powerful industrial stove. 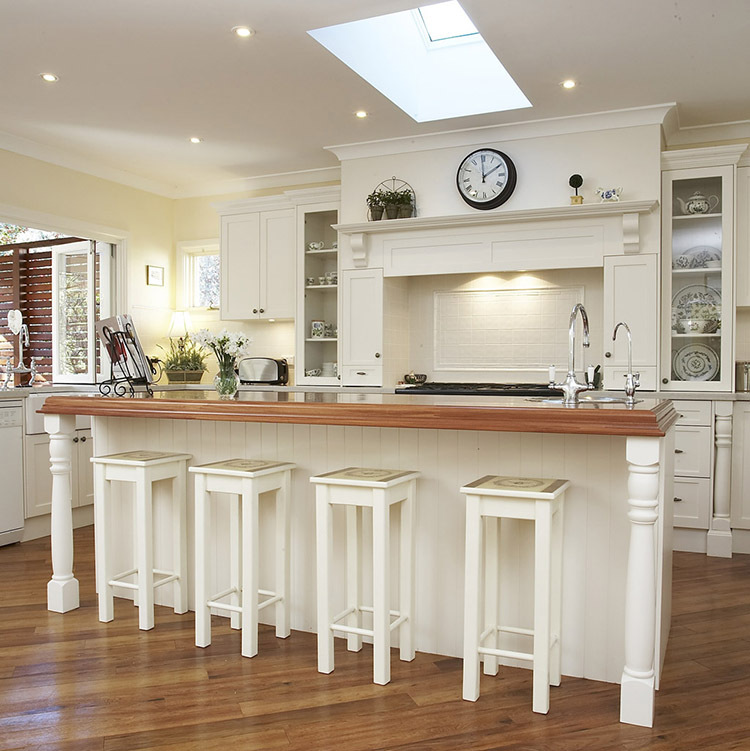 A practical island with in-drop sink and some spacious counters with cabinets provide a good working surface, while guests sit down at the wide table in the background on some finely decorated wooden chairs. 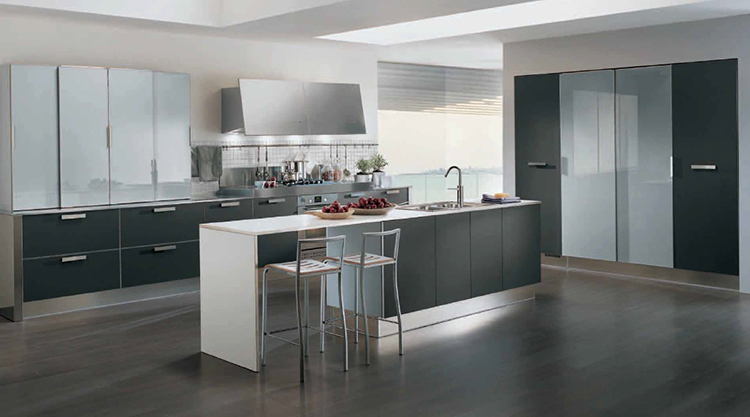 Modern luxury kitchen design is based on simple and essential lines and space optimization. In the example above, the big industrial fridge and the ovens are in-built in a huge wall cupboard, while the large island provides all the necessary working surface. In this way the need of space is minimized. 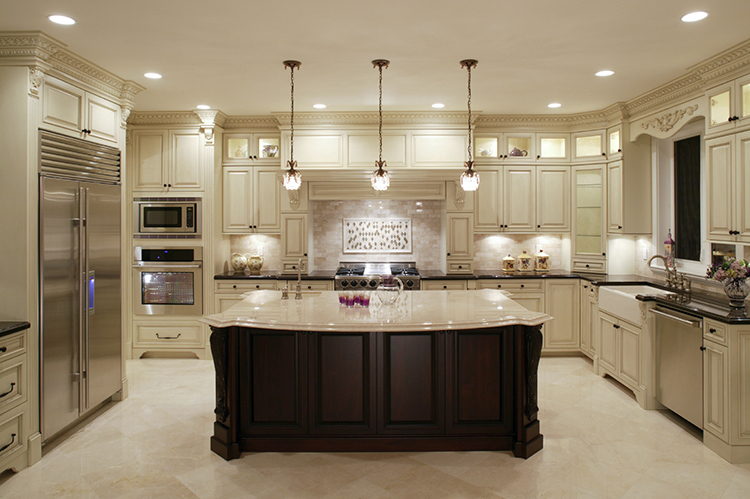 A wise utilization of space is often at the base of modern luxury kitchen design. Here a big room is masterfully divided in two parts in order to obtain a combined space with roomy living area on the right and practical and fully equipped area for food preparation on the left. 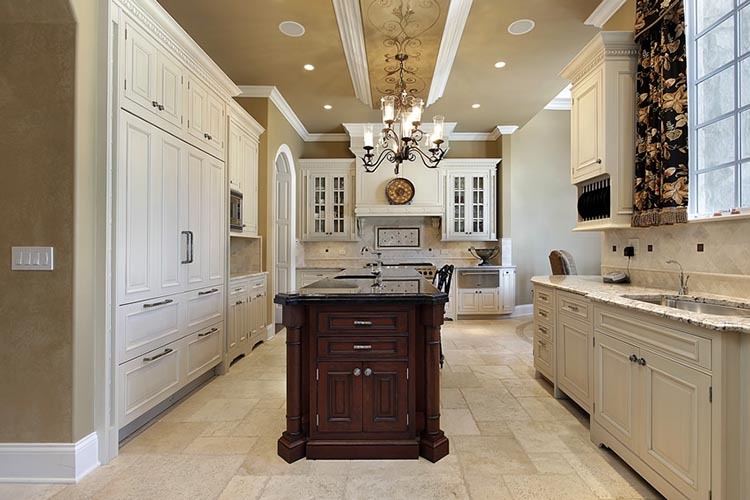 This beautiful luxury kitchen design is an application of the ideas of neoplasticism. Lines and shapes are reduced to the essentials, while the visual composition is simplified to vertical and horizontal directions. Practicality is not lost, as the two spacious islands and the wall cupboard with in-built ovens behind create a practical working area. 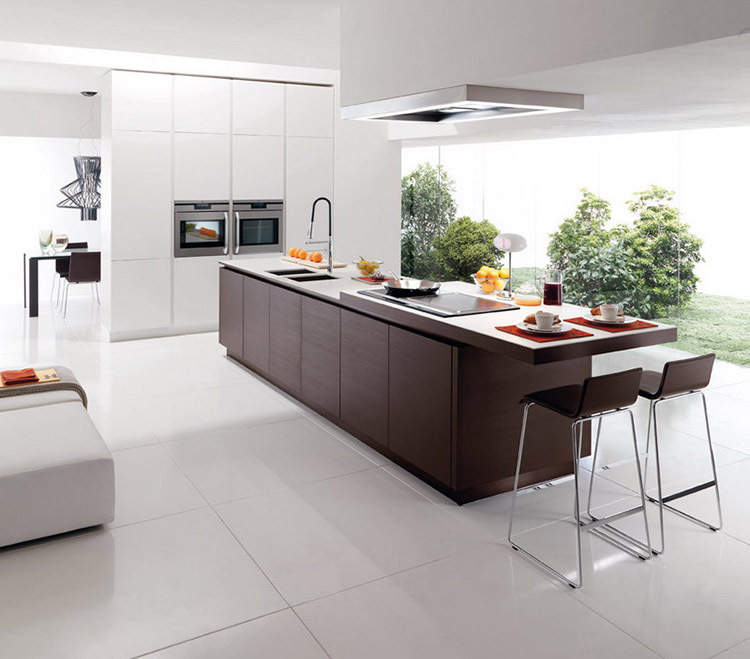 Modern luxury kitchen design is also affected by minimalism, like in the example above. The large cabinet with in-drop sinks, electric hob and cabinets is both working area and dining area, while the fridge and the ovens are in-built in the huge and spacious wall cupboard behind. Lines and shapes are extremely clean and essential. 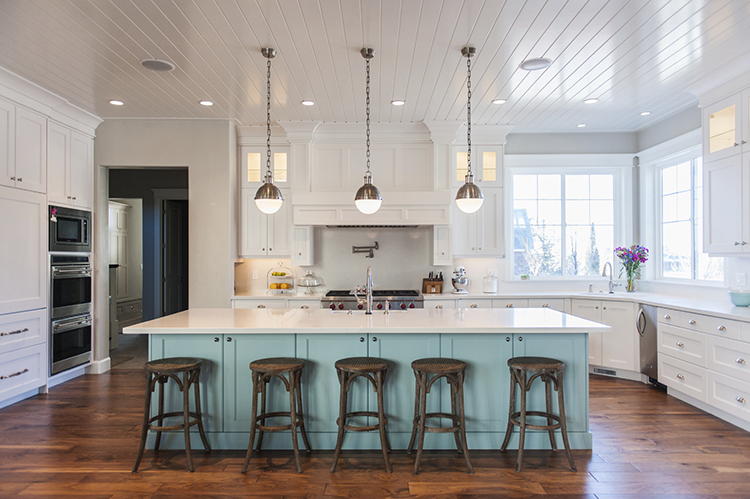 Light metallic grey and dark turquoise pair perfectly in this luxury kitchen design and create an environment that is both beautiful and functional. The long wall counter provide a spacious and practical working area, while the cooking area is composed of a powerful industrial stove with hood and in-built appliances. Another example of a minimalist luxury kitchen design with a very functional layout where the working area is concentrated on the large island fully equipped with in-drop sinks, electric and gas hobs and cabinets. The huge wall cupboard on the right provides all the necessary room where to store supplies and place the fridge and eventual in-built appliances. In this combined space the working area is equipped with a powerful industrial stove, hood, large and comfortable island with in-drop sinks, and spacious counter with cabinets, in-built ovens and appliances. A comfortable living area for having meals and spending time with friends and family is immediately after. The irregularly shaped island with big ornamental shelf, electric hob, cabinets and in-drop sink gives a touch of originality to the design of this modern luxury kitchen. Its nice minimalism and simple layout make it an effective solution for combined, multi-purpose spaces in lofts, apartments and studios. The pleasant combination of purple and light metallic grey creates a sophisticated ambience, while a very functional layout places the big and fully equipped island on the side and leaves plenty of room in the middle. 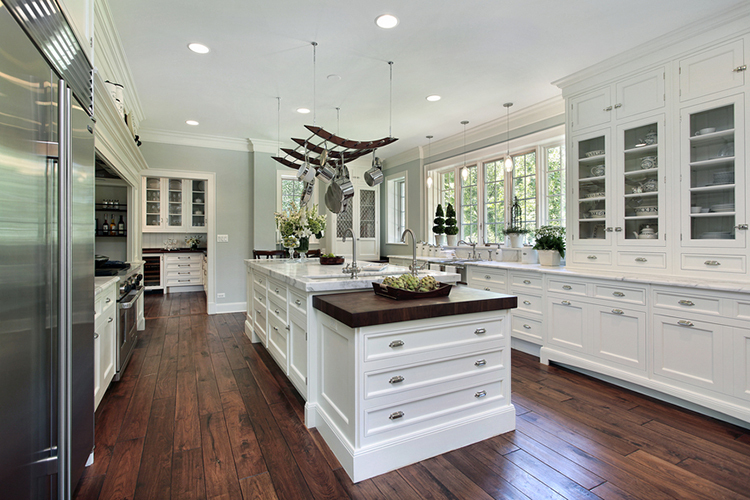 A great design idea if you are in need of a kitchen where gather your friends for parties or social events. 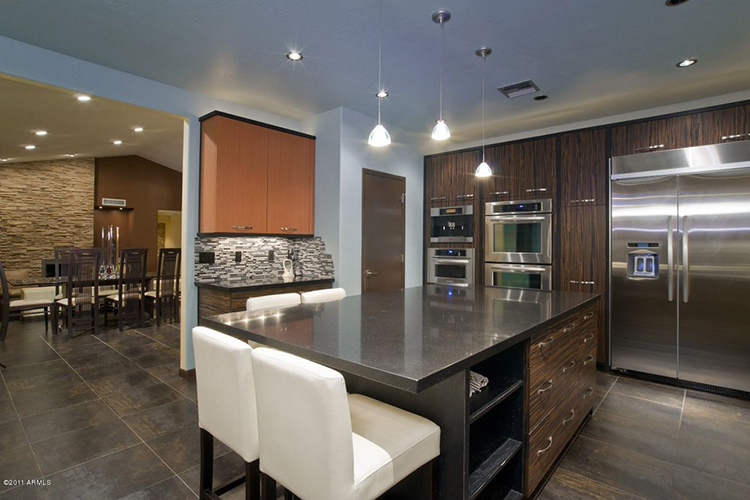 This modern design for luxury kitchen is perfect for social events. The long and wide L-shaped island provide a spacious dining area for guests, while immediately behind there is the huge working are that is fully equipped with one island with hob, one long counter with spacious in-drop sink and one giant wall cupboard with in-built fridge and appliances. This classical and functional layout places the table in the mid of the kitchen and arranges the working area all around. The rich equipment (industrial stove, several in-built ovens and appliances, giant fridge, abundant cabinets and spacious cupboards) makes cooking comfortable and easy in this luxurious yet practical kitchen. The practical design patterns of pubs and restaurants are often a leading theme in modern luxury kitchen design, like in the example above. The fridge and the in-built ovens are placed close together behind the island hosting the electric hob, while another L-shaped island provides additional surface to a long counter equipped with in-drop sink and spacious cabinets. 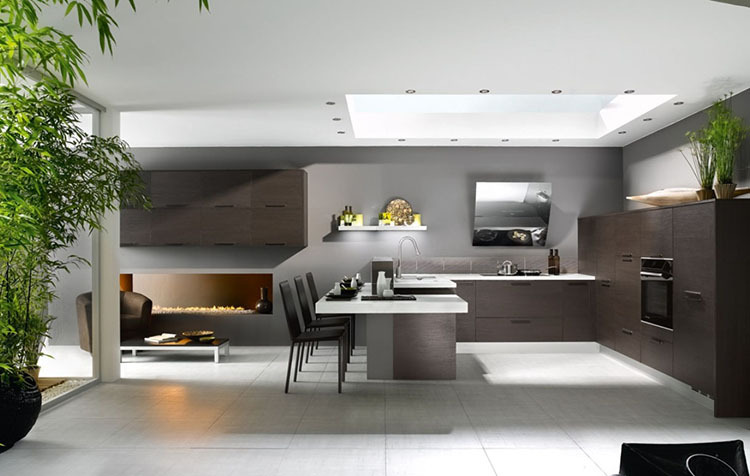 Dark brown and white areas are masterfully alternated in this cool, minimalist luxury kitchen design in order to create a glamorous ambience that is both cosy and elegant. The practical island with in-drop sink and in-built hob allows you to comfortably cook standing just in front of your guests. Unusual shapes are sometimes utilized in modern luxury kitchen design in order to create variety and explore new, original solutions. In the above example, a desk is skilfully combined with a table and a working area with in-drop sink and wide cutting board in order to provide an innovative multi-purpose piece of furniture. 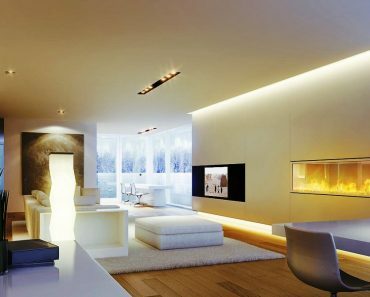 Minimalist design could make environments look cold, but this is not absolutely the case in this cool luxury kitchen with its comfortable and cosy living area standing just in front of the innovative fireplace. The working area is fully equipped with big L-shaped island, gas hob, spacious counter and cabinets, in-built giant fridge and four ovens. 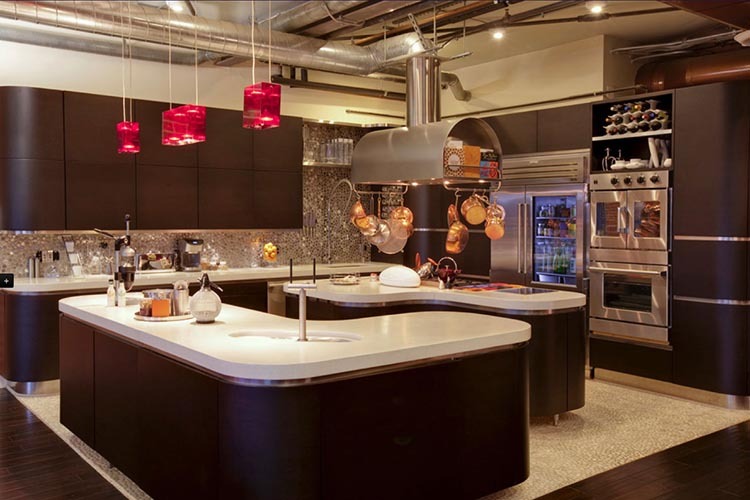 Studios and lofts can be challenging but also inspirational for luxury kitchen designers. In this layout the kitchen is strategically placed in the bottom of the wide studio, while the large and practical island with in-drop sink and cabinets can be utilized as both table and additional working surface. 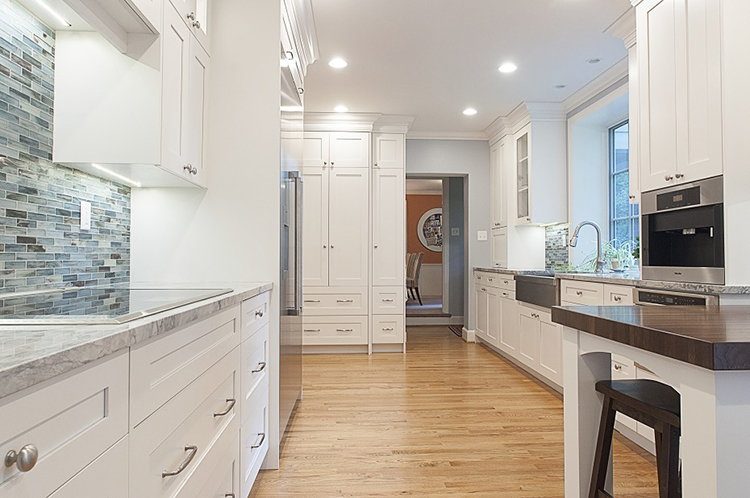 The original island in the foreground is a combination of three volumes that should not only create a sense of variety, but also provide a spacious storage area because of its several cabinets. The top in stainless steels is a perfect working surface that is added on to the one provided by the large counter with in-drop sink that lays right behind. 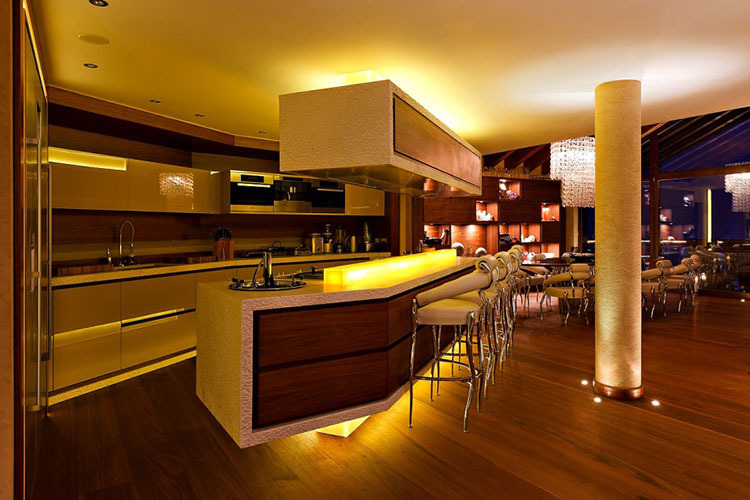 The combination of wooden and white plastic panels that reflect the yellow light of the lamp set on the island creates a pleasant and warm ambience that is clearly inspired by restaurants in this modern luxury kitchen design . The roomy living area on the right allows you to comfortably host parties and social events. Multi-purpose spaces often offer great occasions to develop smart modern luxury kitchen design ideas, like in the example shown above. Two large islands create a wide surface that can be indifferently utilized as a table or working surface. 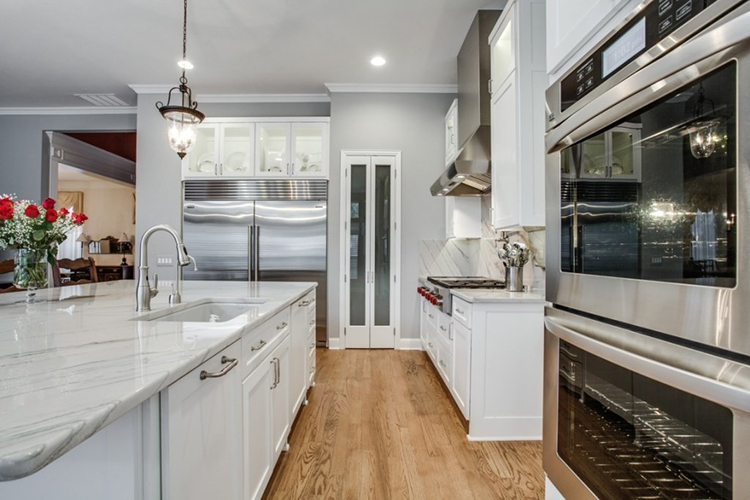 The layout has its focus in the narrow area between the stove and the island immediately behind, where everything that is necessary for food preparation is at hand. 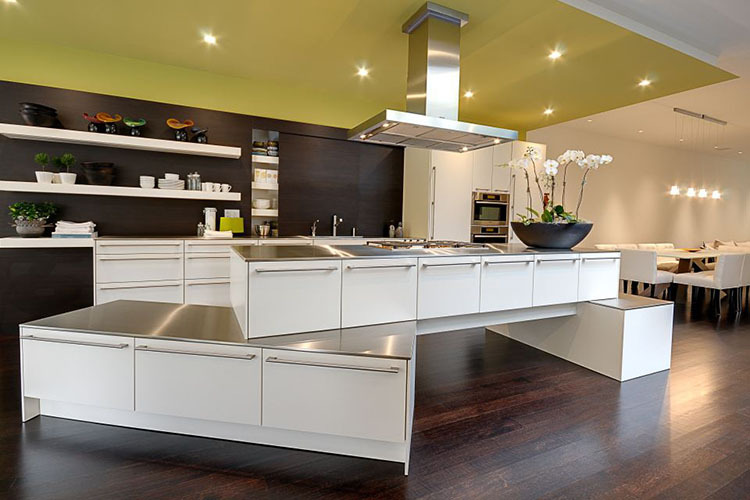 A cool example of very practical modern luxury kitchen design. The hob is strategically placed in front of the in-built ovens and near the in-drop sinker in order to keep the necessary tools for food preparation at hand. The fridge is in-built in the huge wall cupboard, while plenty of cabinets provide a spacious storage area. In this combined space the working area is confined to a practical island fully equipped with in-built appliances, stainless top counter, aspiring hood, cabinets and electric hob. Immediately on the right we have a comfortable wall cupboard with in-built fridge, while the design of the huge living area on the left repeats the industrial style of the kitchen. A great sense of spatiality that is obtained through a clever layout is the key to understand the smart design of this modern luxury kitchen. Ovens and fridge are in-built in two nice wall cupboards with panels in refined wood, while the spacious island in the centre provides both the working and the dining surfaces. This minimalist yet vivid design exploits the contrast between red and white in order to create a clean environment that cannot but impress your guests with its bare elegancy. The working area is confined to the island in the centre equipped with in-drop sink and hob, while fridge and the rest of appliances are in-built in the spacious wall cabinets. 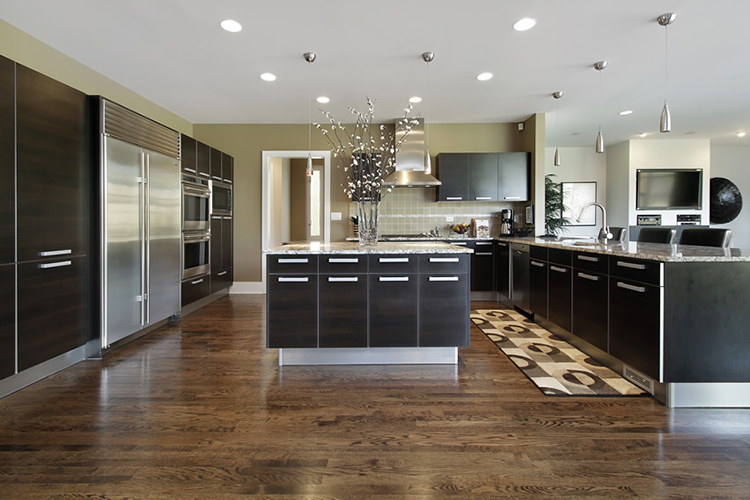 Modern luxury kitchen design is often innovative and disruptive of traditional patterns. Here, for example, there is no clear separation between the living area and the kitchen, as the furniture takes elements from the former and the latter. In this way, it is possible to get real multi-functional spaces that are more suitable for modern loft. A composed elegance is the main feature of this classical kitchen where a minimalist design combined with the utilization of panel in refined wood create a cool and warm ambience. The capacious industrial fridge, the practical stove and the big in-built ovens provide all comforts for great food preparations. 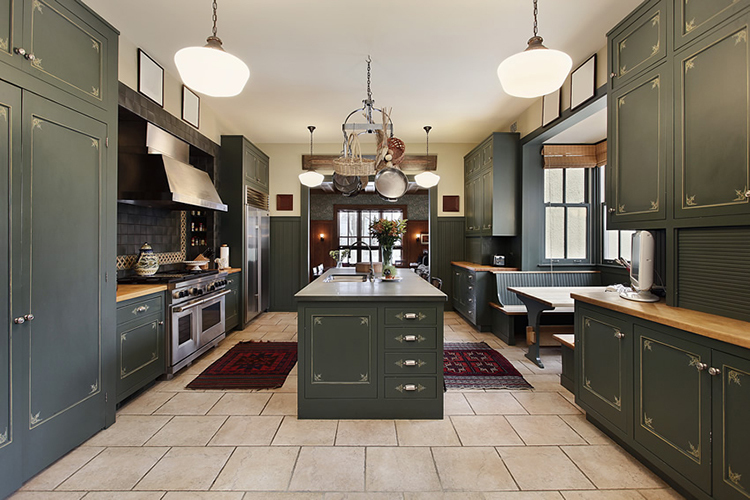 An example of how much modern luxury kitchen design is often inspired by pubs, hotels and restaurants. The simple, linear shapes of the island remind a pub counter, while the wall-cupboard behind could stand in the hall of an hotel. A great place for social life and enjoying snacks with friends. The wide T-shaped island that is fully equipped with aspiring hood, hob, in-drop sink, cabinets and shelves provides a real multi-purpose area ensuring food preparation is comfortable and easy. The space is split clearly in a part for living and another for cooking, in order to best optimize space. 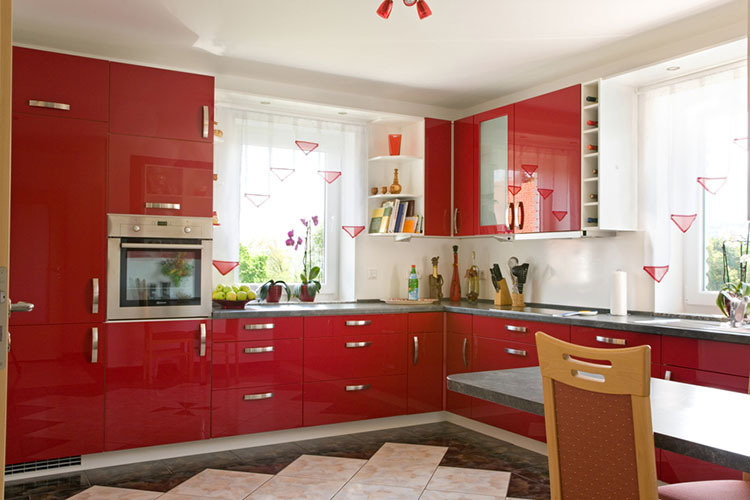 Classically beautiful, this example of modern luxury kitchen design exploits the combination of red and white in order to create a cosy ambience resembling the style of the furniture of the 60ies. The cabinets are set all around the practical table in the middle in a disposition that optimizes space. Some elements taken from traditional kitchen design (like the false mantelpiece in wood and the classical motifs of the wooden panels) adds a touch of familiarity to this kitchen. Its cool layout masterfully arranges the furniture all around the focal point provided by the small, cosy table and its annexed tiny island. 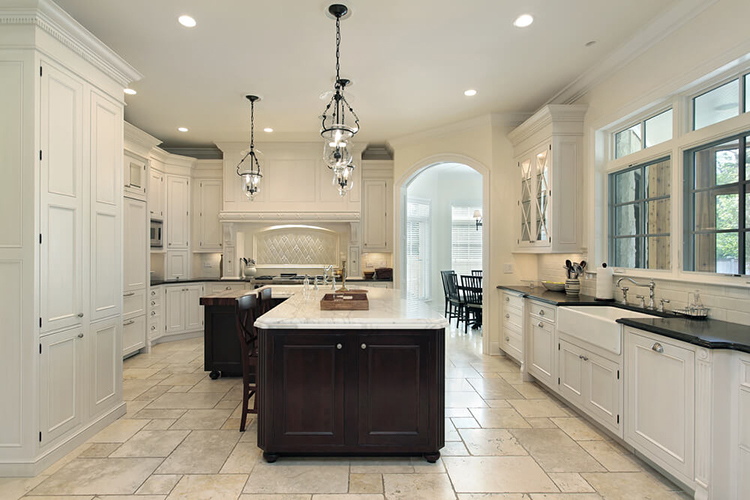 The whole layout of this example of modern luxury kitchen design has its focus in a point between the semi-circular island and the line behind where cabinets, in-built ovens, counter with in-drop sink, fridge and cupboards stand. In this way, the chef has both guests and tools immediately at hand. A very great solution for food preparation enthusiasts. Communication is at the centre of this design, where the long L-shaped island provides not only a comfortable area where to set guests but also a cooking area near them in order to keep verbal contact. 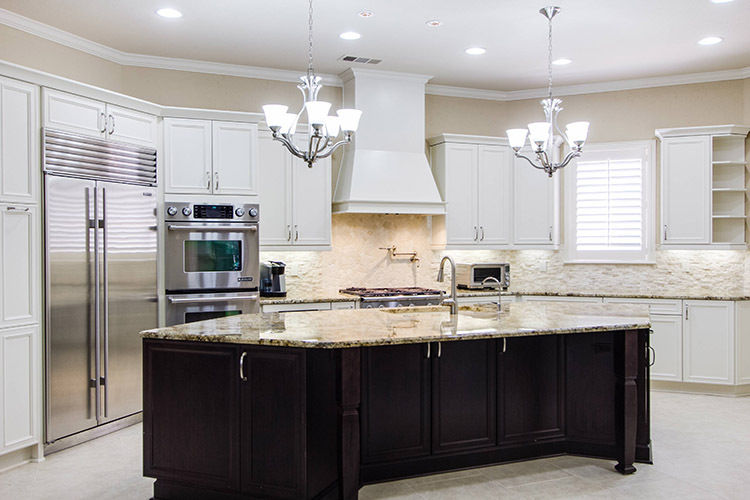 Behind, a fully equipped kitchen provides all the necessary for food preparation. The combination of wooden panels, white surfaces and the metallic surfaces of the in-built appliances together with the utilization of clean lines and linear shapes creates an ambience of bare but superb elegance in this modern luxury kitchen. The unusual shapes of its wall cabinets and the alternation of plastic and wooden panels add a touch of originality to this modern kitchen. Its layout is extremely functional, having its working area fully provided by the long and practical counter with in-drop sink and in-built hob that runs all along the wall. 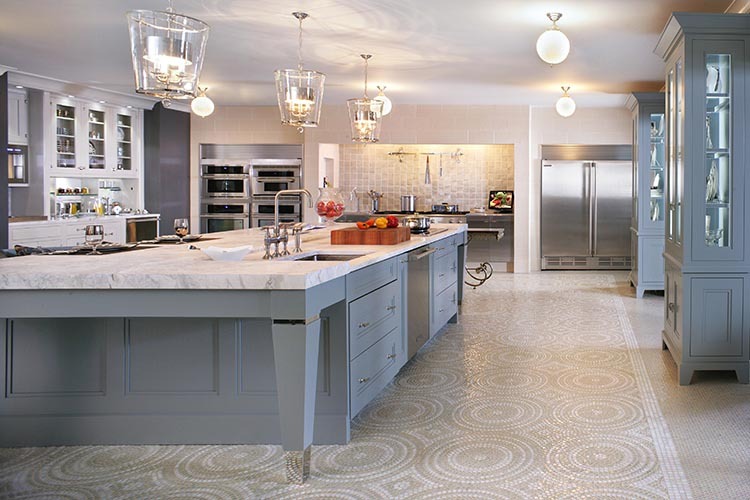 Tiles are a little but important detail that can really characterize the design of a kitchen. In this example, they provide both an ornamental motif and a practical protection against splashes for the portion of the wall above the sink. A big fridge and a wide counter with cabinets complete the furniture of this small but practical kitchen. 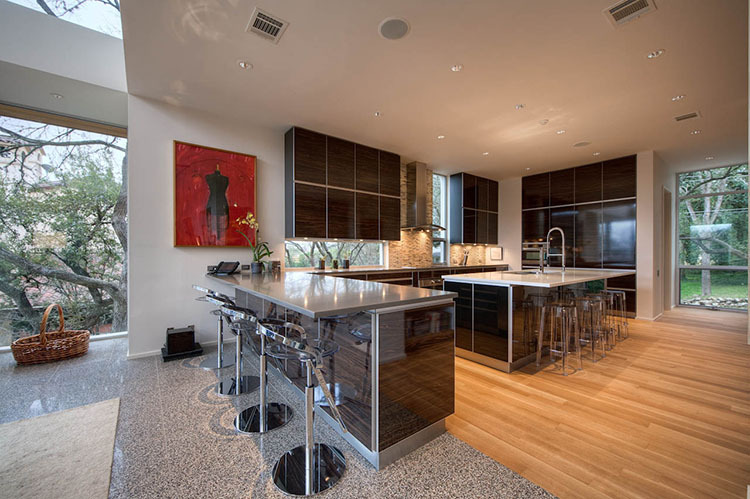 The masterful utilization of alabaster, glass, wooden and stainless panels and marble counter tops creates an ambience that is both glamorous and warm in this modern design. Small but practical, this kitchen has all the necessary for preparing food and making your guests feel comfortable. Clearly inspired from industrial kitchen design, this kitchen is the triumph of functionality and practicality. Food preparation becomes easy and comfortable when there is immediately at hand something like four in-built ovens, one powerful industrial stove, one giant fridge, some spacious cabinets and cupboards, one large island and one practical counter with in-drop sink. A smart solution for combined spaces where guest needs are put on top. The two large and capacious islands provide all the necessary working surface to prepare and serve food and drinks, while the adjacent huge living area can host as many people as you wish. 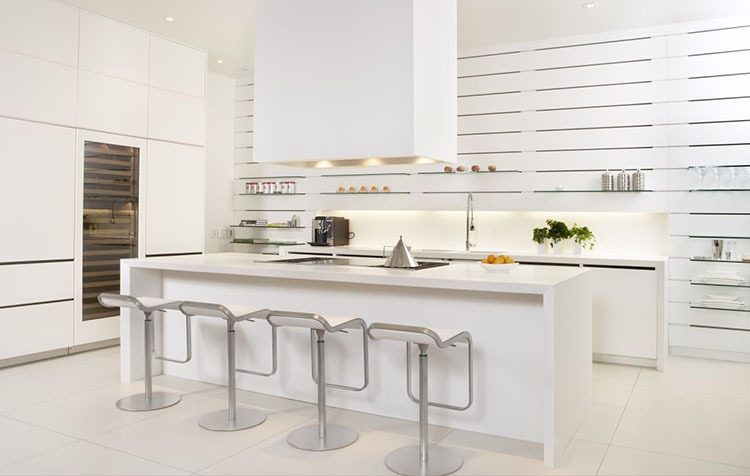 Minimalism led the designer of this modern luxury kitchen. Its linear shapes give an impression of natural elegance, while cupboards are replaced by a huge wall panel where cabinets and appliances are in-built. Notice the original cap with lamps and aspiring hood over the practical counter with in-built hob and sink. 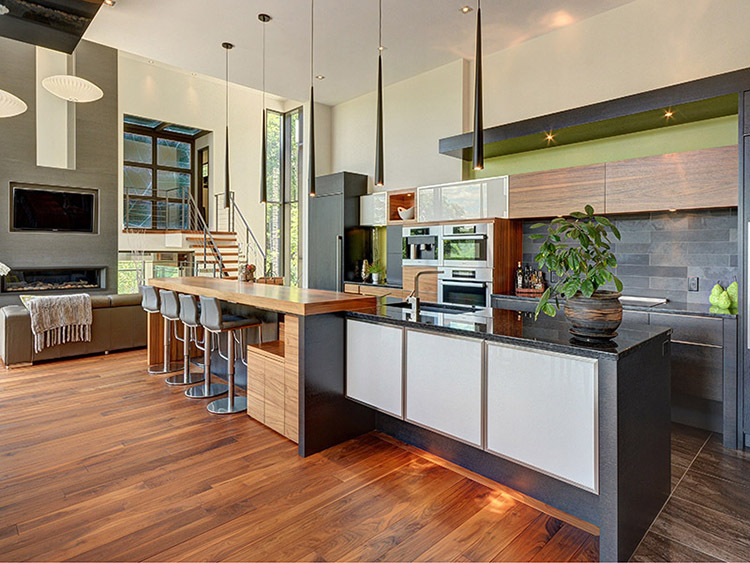 This luxury kitchen is placed in a modern, multi-purpose contest. The space is neatly divided into a living area, where it has been set a big, comfortable table, and a cooking area classically arranged on a long island and a huge wall cupboard with in-built appliances immediately behind. A studied combination of grey, silver and white tonalities creates an airy, a bit ethereal ambience in this cool example of modern luxury kitchen design. An extra touch of glamorous elegance is added by the utilization of a roomy layout and some opaque glass panels. 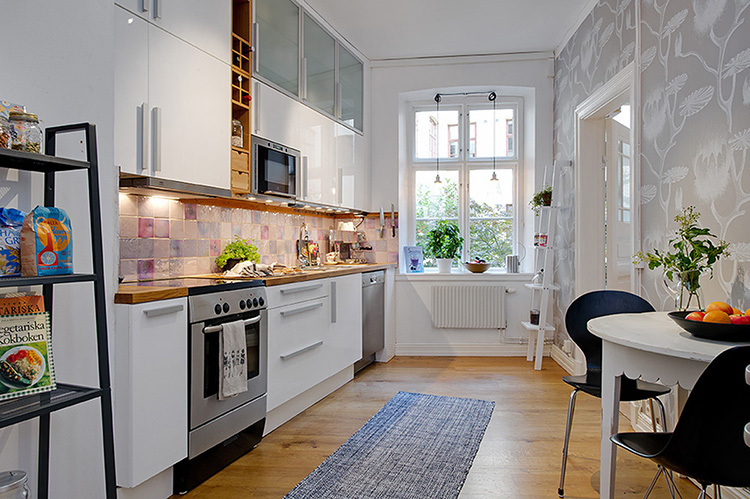 The little of space available is perfectly optimized in this small kitchen arranged on two clearly distinct areas. The first is provided by the wall cupboard with in-built ovens and fridge on the right, the latter by the counter with one in-drop sink and cabinets on the left. The divisor element is given by the large island set in the middle. 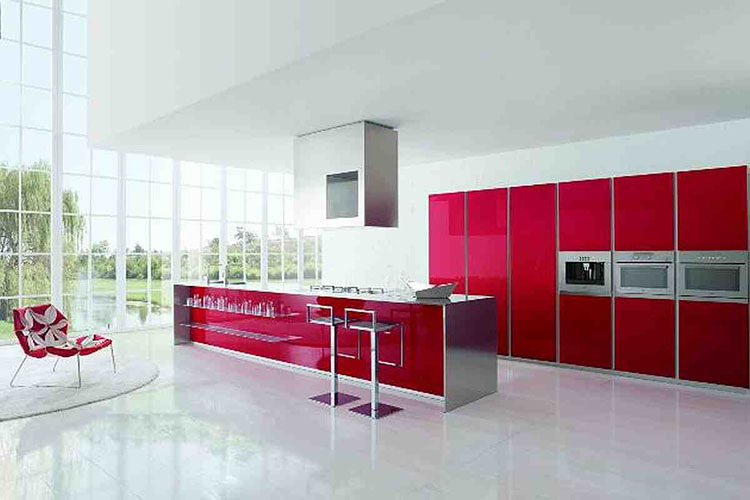 Very modern and bright, the design of this luxury kitchen is based on a palette of 3 colours, white, red and walnut. 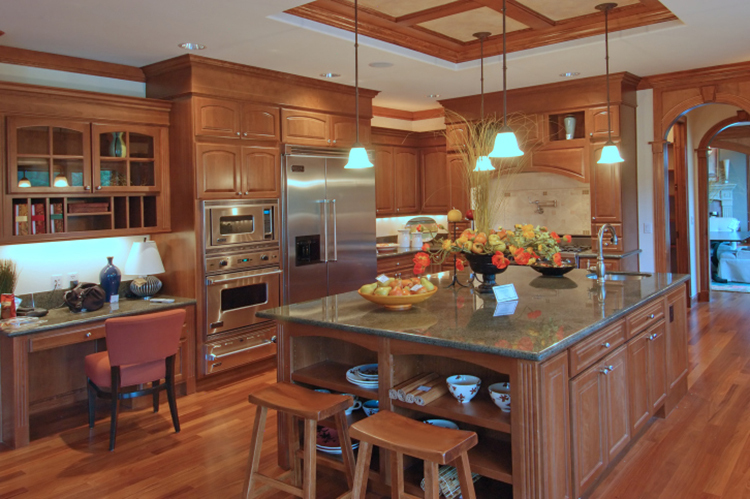 The island, where it is possible to prepare food standing right in front of guests, is placed between two cabinets that have also an ornamental function. A touch of glamour is added by the nice opaque glass panels, while the difference in size of cabinets creates a cool visive impact. 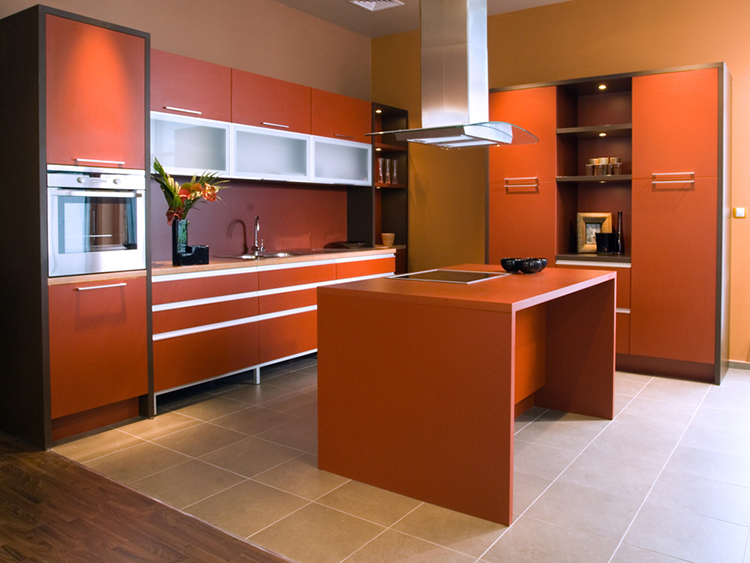 Ginger peach gives an unusual warmth to this nice example of design of modern luxury kitchen that is inspired by the furniture of the seventies. The volumes are masterfully arranged in a way to create a pleasant sense of variety, while its basic equipment with small electric hob, counter with in-drop sink, in-built oven and fridge is simple but effective.